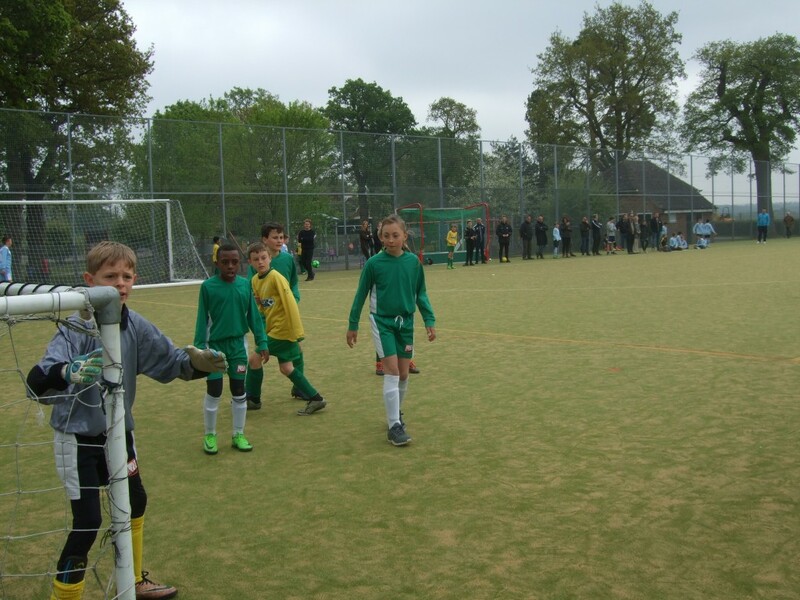 On Wednesday 6th March the St Matthew’s boys football team played St Augustine’s in the last match of the season. The team played their best game all season winning 4-1, with the goals coming from Henry and a hatrick from Harrison who was playing in his first ever game. Well done guys great effort. 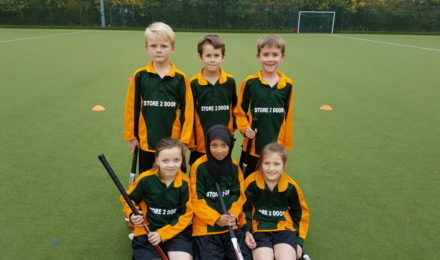 On Monday 4th March St Matthew’s entered two teams into the quick sticks hockey tournament at TWGGS School. It was another fantastic afternoon of sport with both teams playing really well after very little practise. The B team were superb just losing out in the semi finals and the A team narrowly lost in the quarter finals. Well done guys you were all fantastic. 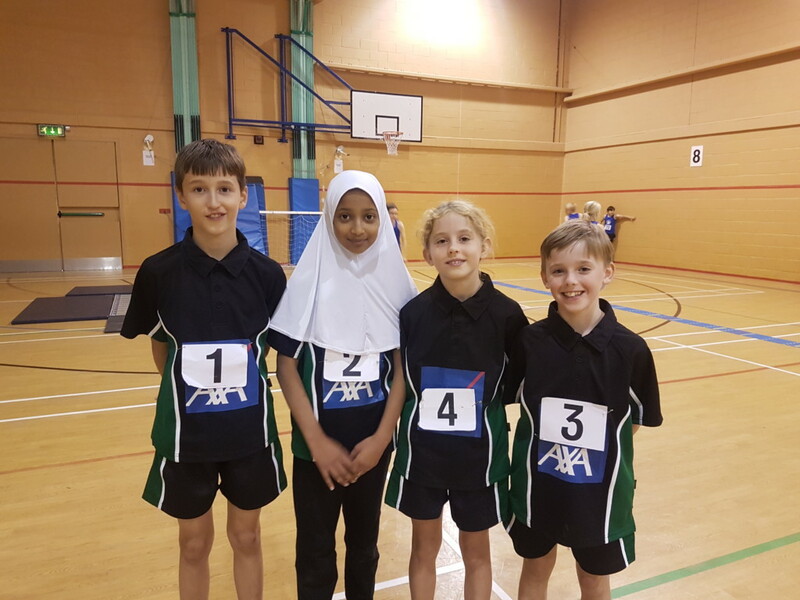 On Sunday 3rd March Olivia, Demi, Jake, Henry & Humairaa represented Kent at the Southern Inter Counties Sportshall Athletics Championships in Burgess Hill. This was a huge honour for all the children and St Matthew’s were so proud to have 6 children in the Kent team. They performed brilliantly on the day with Humairaa recording her highest ever vertical jump of 55cm, Olivia throwing her furthest ever javelin of 17 meters, Henry jumped a huge 6 meters 29 in the triple jump, Demi jumped her best ever triple jump of 5 meters 98cm and Jake produced an impressive 57 speed bounce. These children were part of a 30 strong team and both the boys and girls managed to win the competition, which hasn’t been done before. Congratulations to them all you were superstars. 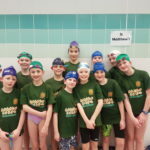 On Wednesday 27th February St Matthew’s took part in the inter schools swimming gala at Tunbridge Wells pool. Our team consisted of Emily, Becca, Theo, Jake, Matthew, Abbie, Erin, Kyle & Charley and they all swam really well. 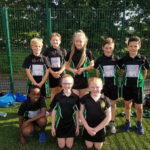 They were up against some really strong opposition but Theo managed to win his Year 5 breast stroke race and Abbie won her Year 5 back stroke race. 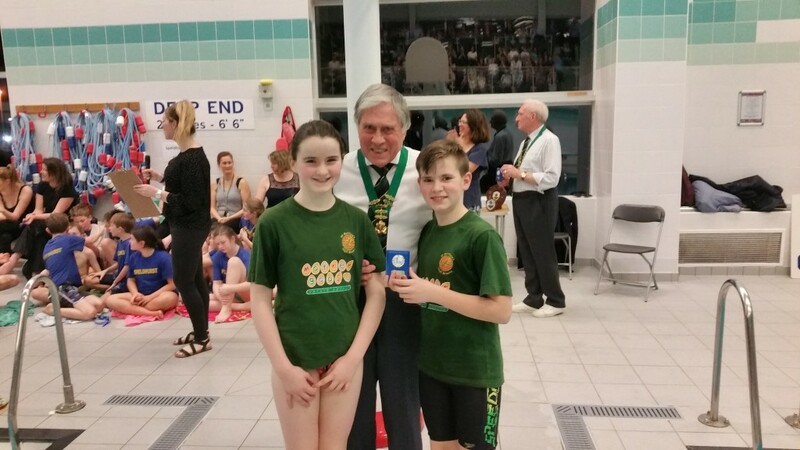 Charley was 2nd in the year 5 breast stroke & Becca was 3rd in the Year 6 back stroke. We finished 4th overall which was a fantastic result. Well done guys a great effort. 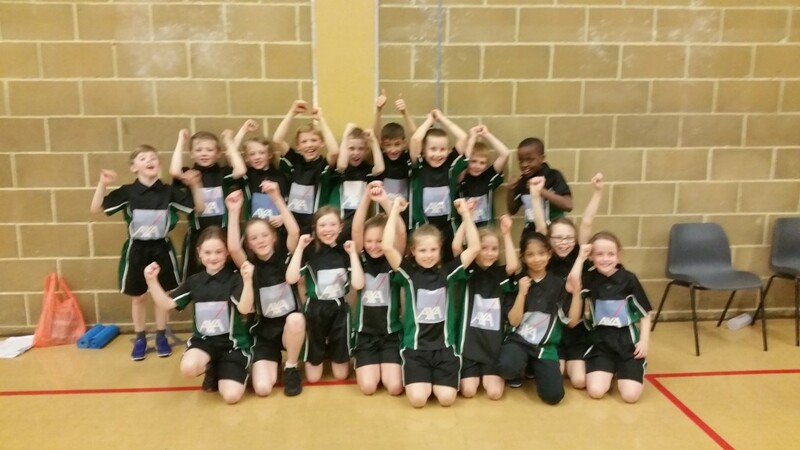 On Wednesday 13th February St Matthew’s took part in the Year 3/4 Indoor Athletics competition at Mascalls School. We had a fantastic team and they finished in 2nd place. 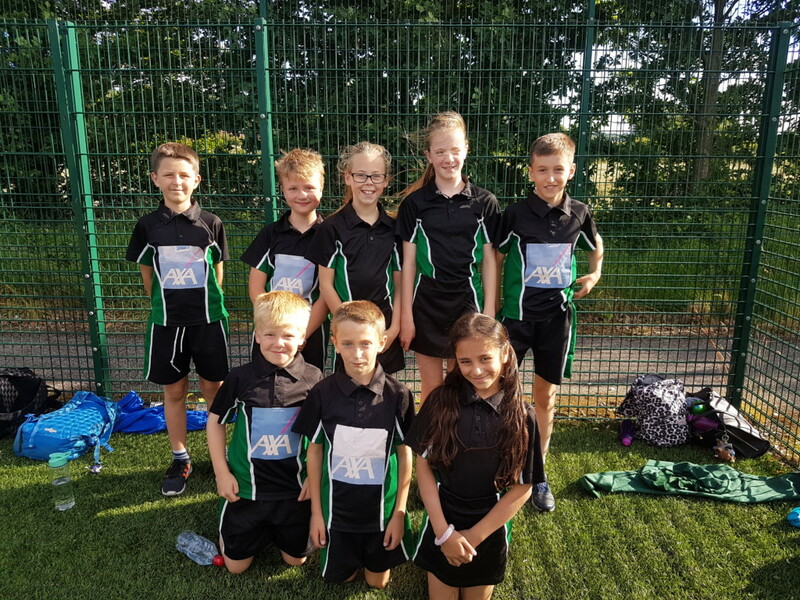 All the children performed brilliantly but there were some stand out performances from Harvey who threw 9 meters in the chest push, Harrison who threw 15.50 meters in the javelin, Charlie who did 57 speed bounce, Leah who did 54 speed bounce & Lily who threw 13.50 meters in the javelin. I was so proud of the whole team as they were only 10 points behind the winners. 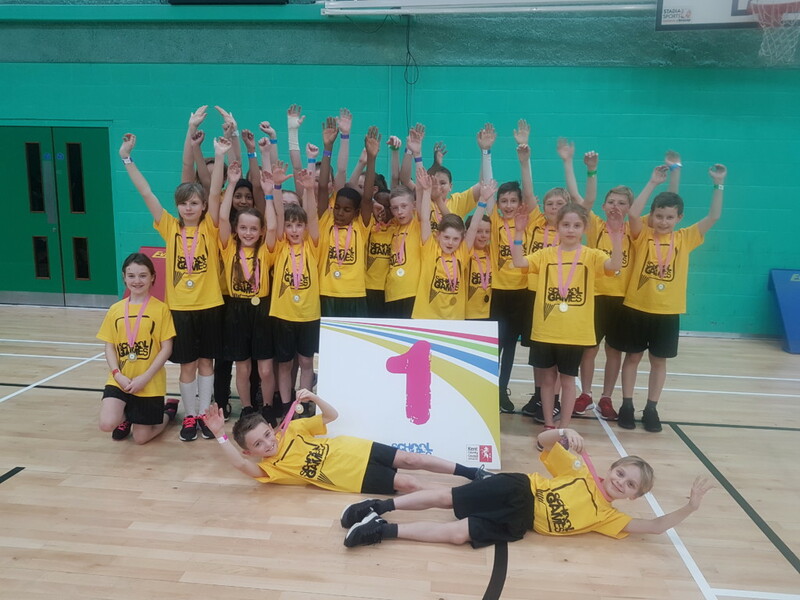 On Tuesday 5th February St Matthew’s became Champions of Kent at the Year 5/6 Sportshall athletics, Kent School Games Finals in Gillingham. This was a huge achievement for all the children and it also meant the school has now won the Kent Finals at every age group from Year 1-6. Our team consisted of Dominic, Theo, Henry, Petroc, Jake, Nikki, Joe, Joshua, Tinashe, Tochakwu, Freddie-Lee, Freddie D, Harry, Demi, Olivia, Erin, Humairaa, Lily, Nikola, Ella, Abbie, Nicola & Daisy. 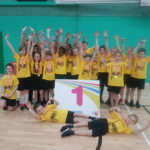 There were 16 schools taking part, representing all the different areas of Kent and St Matthew’s were crowned champions with a huge score of 704 points, 100 points more than 2nd place. 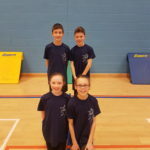 There were superb performances from all the children but some stand out achievements came from Joshua who managed 60 speed bounces, Henry who jumped 2 meters 12cm in the long jump, Abbie who gained 58 in the speed bounce, Lily who jumped 2 meters 16cm in the long jump & Demi who jumped 6 meters 6cm in the triple jump. This was without doubt once of the most impressive performances by any team from St Matthew’s, so huge congratulations to every member of the team. 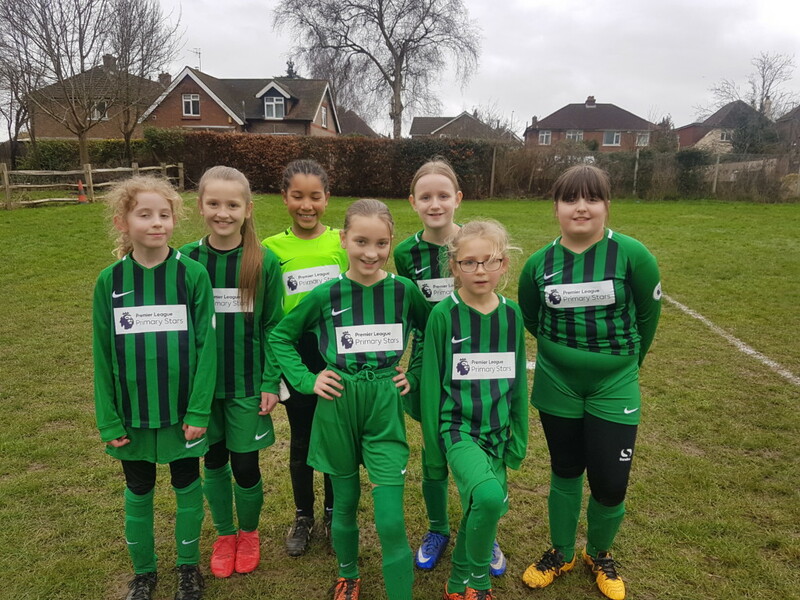 On Wednesday 30th January the girls football team played against Speldhurst School. The team consisted of Martha, Jess, Annalys, Keeley, Abbie, Amelia K, & Amelia L. There were some great performances from all the girls and they showed huge improvement. Martha bravely stood in for our goalkeeper who was ill, making some great saves and Annalys and Jess played really well in defence making it tricky for the Speldhurst strikers to score. The final score was a well deserved 2-2 draw and our two goals were scored by Amelia K & Amelia L. Well done to all the girls who now have only one match left to play this season. 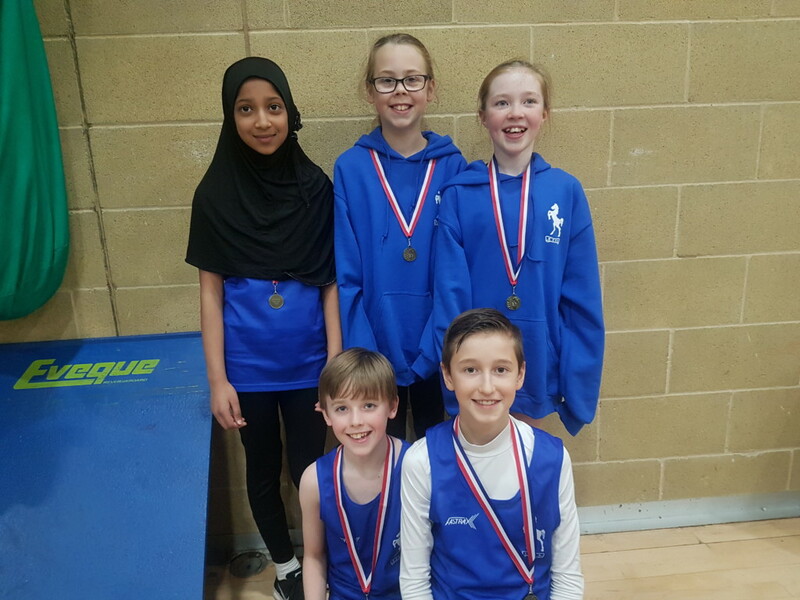 On Sunday 27th January Lily, Demi, Olivia, Abbie, Humairaa, Henry & Jake took part in the Kent under 11 Decathlon Championships at the Stour Centre in Ashford and they had to take part in 10 different events to gain an overall score. Lily performed really well gaining exceptional scores in nearly all 10 events. Her outstanding performance came in the long jump where she achieved 2 meters 10cm. Humairaa had an exceptional triple jump gaining 5 meters 96 cm. 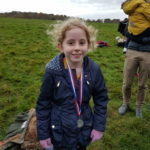 There were 68 boys and 70 girls taking part and Lily finished in an incredible 2nd place, Demi and Olivia were equal 4th, Abbie was 10th & Humairaa was 13th. In the boys competition Henry finished in 7th place & Jake was 15th. 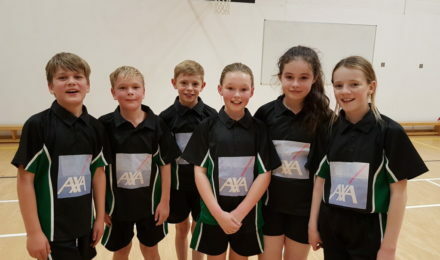 This was an amazing performance from all the children and 6 of them have now been selected to represent Kent in the Inter counties on 3rd March. 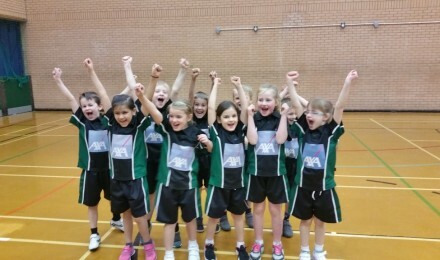 On Tuesday 22nd January St Matthew’s became champions at the Infant Agility competition for the 4th year running. The team consisted of Ruby, Jasmine, Betty, Amelia, Alice, Marios, Freddie, Henry, Noah & Sonny. 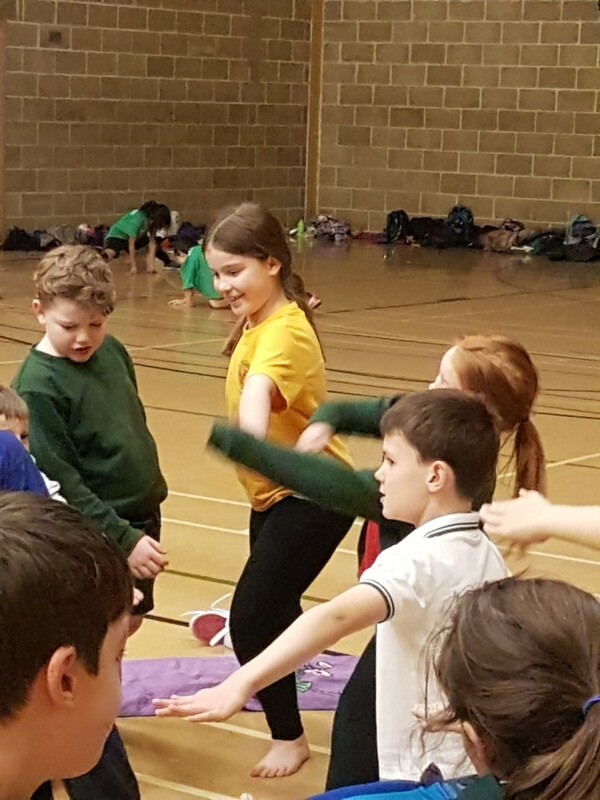 The children had to do 6 activities including, speed bounce, skittles, shuttle run, long jump, chest push and javelin and they all performed amazingly well gaining some really high scores. They had practised every lunchtime for 6 weeks and their dedication really paid off today. 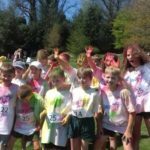 They will now progress to the Kent School Games Final in June. Well done to each and every one of you. 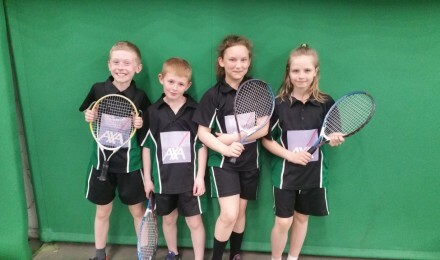 On Tuesday 15th January 10 children from St Matthew’s took part in a developmental Badminton Festival which gave children the opportunity to practise their racket skills. There were various stations set up which incorporated all the skills needed to play badminton. Our team consisted of Jack, Akil, Florence, Hermione, Olivia, Ganeshai, Niamh, Joseph, Joshua & Freya and they all had great fun. 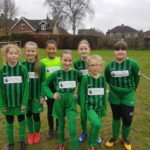 On 14th January St Matthew’s girls played football against Paddock Wood Primary School. The team consisted of Olivia, Martha, Abbie, Amelia, Jessica, Amelia & Keeley. The girls played really well and although they are still relatively new to the sport they looked really strong. The score was 1-1 and Olivia managed to score our first goal of the season. Well done to all the girls we are really beginning to see some improvement in your game. 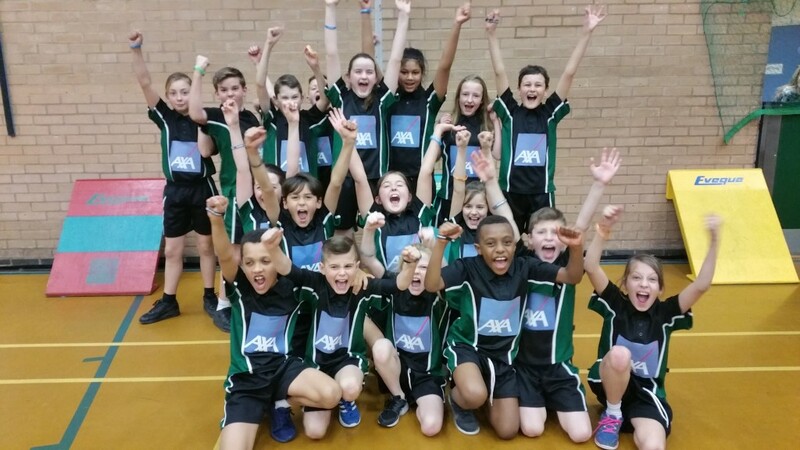 On Tuesday 4th December St Matthew’s became champions at the Year 5/6 sportshall athletics festival at the Angel Centre in Tonbridge. The team consisted of Humairaa, Lily, Demi, Nikola, Ella, Olivia, Aysha, Abbie, Nikki, Henry, Tinashe, Dominic, Petroc, Jake, Joe, Joshua and Theo. This was without doubt the most talented team St Matthew’s have ever had and each and every child produced amazing performances. To name a few outstanding athletes, Henry jumped 2 meters 30cm in the long jump and an incredible 6 meters 50 cm in the triple Jump. Lily and Humairaa jumped 2 metres 18cm & 2 meters 22cm and Dominic achieved 2 meters for the first time. Petroc and Theo were incredible in the chest push throwing 8 meters 75cm & 8 meters 25cm. The team finished in first place with a huge score of 735 points, 10 points in front of 2nd. 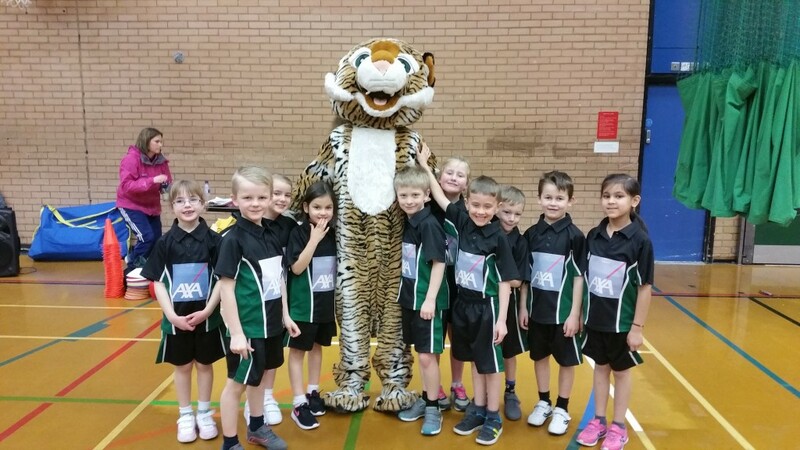 The children now progress to Kent School Games Finals in Gillingham on 5th February and we are so excited to see if they can improve their already amazing performances. Well done to all the team you were amazing. 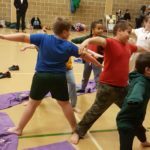 On Thursday 22nd November 9 children from St Matthew’s went to the Active 30 festival at Putlands Sports Centre in Paddock Wood. 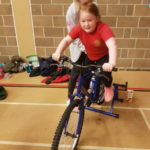 The children took part in different sports and activities with the aim of getting them to fall in love with sport and maybe join clubs outside of school. The whole afternoon was non-competitive and was just a bit of fun for the children. The festival concentrated on alternative activities to inspire and engage children to reach their Active 30 minutes (in school and after) so they achieve the 60 minutes recommended by the Government. 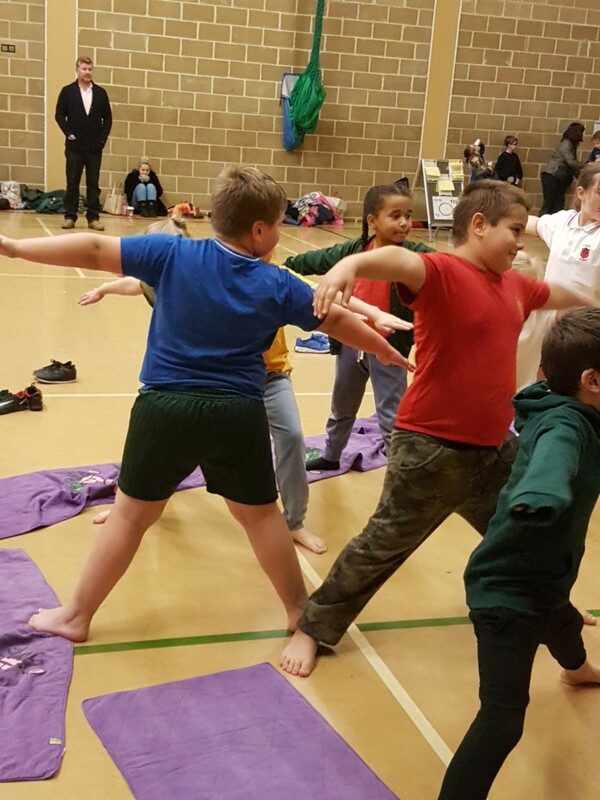 Callum, Kiyan, Zak, Nasi, Alyssa, Tori, Lily, Millie & Maddie had a fantastic time doing Yoga, Fire fighters keep fit sessions, making smoothies on the smoothie bike and lots of running games with Sport England. It was a lovely afternoon and Callum said it was “the best day of his life”!! YEAR 5/6 INTER SCHOOLS BASKETBALL. 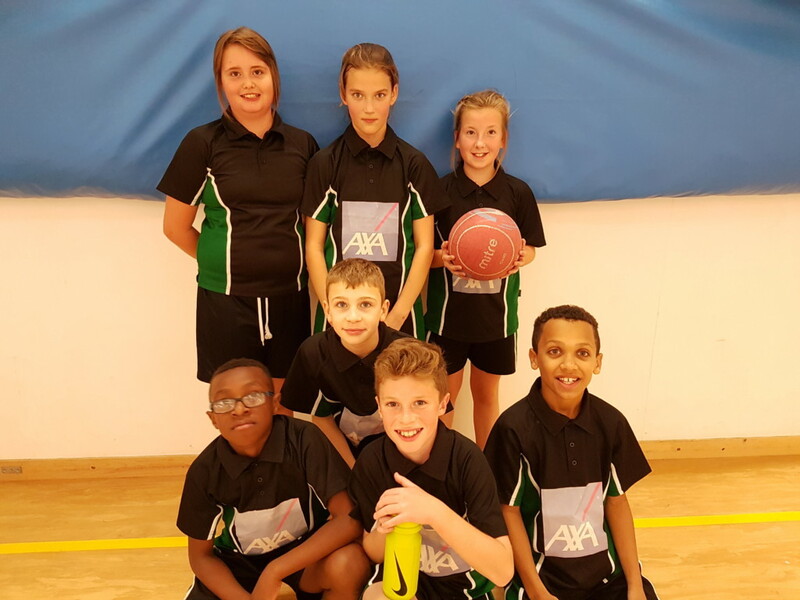 On Thursday15th November St Matthew’s took part in the Year 5/6 inter schools basketball competition at Skinners Grammar School. The team consisted of Erin, Olivia, Lily, Nicola, Petroc, Theo, Joe, Harry & Tinashe. The team won all four of their group games winning the first one 22-1, which was very impressive. They proceeded to the semi finals and after a really tightly fought game they unfortunately lost by 1 point. This put them in the play off for 3rd or 4th position and after a great show of strength and skill they won 11-5, giving them 3rd place overall. Well done to all the children, your weeks of hard work leading up to the event really paid off. 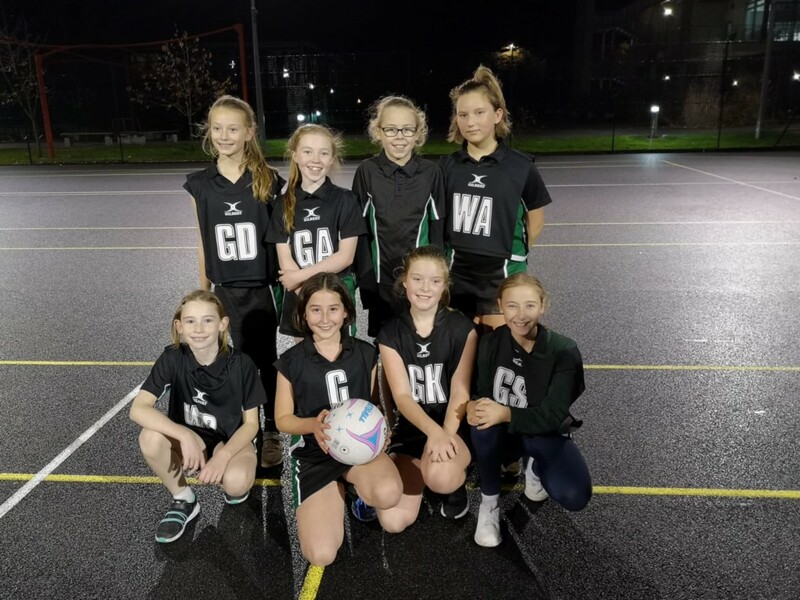 On Tuesday 13th November the Girls netball league started and St Matthew’s had 3 games to play at Skinners Kent Academy. The team consisted of Florence, Olivia, Demi, Nicola, Emily, Becca, Lottie & Rebecca and they got off to a great start winning 2 out of the 3 games, beating Langton 4-1 and St Mark’s 2-0. 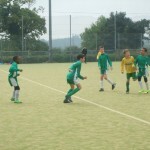 On Thursday 11th October the boys played their first league game against Bishop’s Down. Due to some absences within the team a couple of players had to stand in but they did a great job and the whole team played really well. The game was an exciting one with end to end play and the score remained at 0-0 until the last few minutes when an unfortunate deflection resulted in Bishop’s Down scoring. the outstanding player in the team was without doubt Petroc who played in goal and made numerous incredible saves, which even gained him praise from the opposition. It was a great start to the season and gives us a good idea how well the team will play this year. 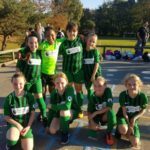 For the first time ever St Matthew’s have entered a team into the Girls football league. The members of the team are all novices, but they are very enthusiastic and willing to put lots of hard work into becoming better. On Tuesday 9th October the girls played their first match against St John’s away from home which added to the nerves. There were some great performances however from all the girls especially Martha who stepped in for the normal goalkeeper who was absent. She was incredibly brave and made several great saves. Unfortunately they did not manage to win but they worked so hard and showed a great attitude. Well done girls it was a great first performance. 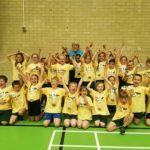 On Sunday 7th October St Matthew’s took part in the Kent under 11s indoor athletics festival at St Johns sports centre. This was a competition for some of the most talented children in the school and our team consisted of Henry, Humairaa, Abbie and Jake. 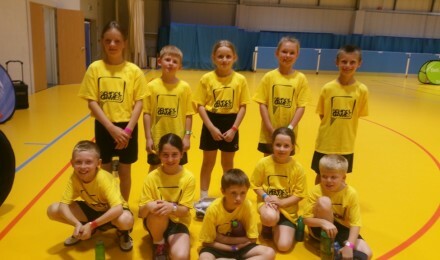 Each child had to do a jump, a throw and two relay runs and their scores were added together to make a team total. Henry and Humairaa were exceptional in the Long Jump recording distances of 2 meters 15cm and 2 meters, giving them 1st boy and 1st girl place. 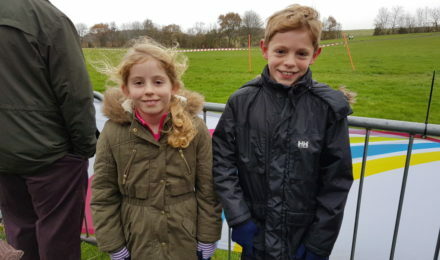 Jake performed really well in the speed bounce where he achieved 55 bounces and Abbie really shone in the balance test where she achieved a maximum 60 out of 60 seconds. 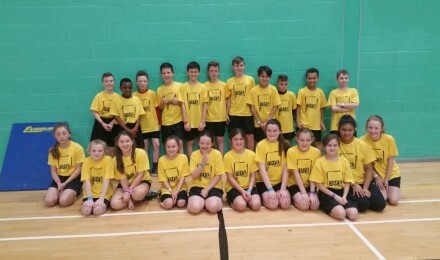 The relays were also very impressive and they managed to gain the fastest times out of all 15 schools taking part. This was a great achievement and it gives us a good indicator as to how well we can do in this years competitions. Our children will be able to kick-off the new term in style, following the delivery of a free Premier League Primary Stars kit for our football team. 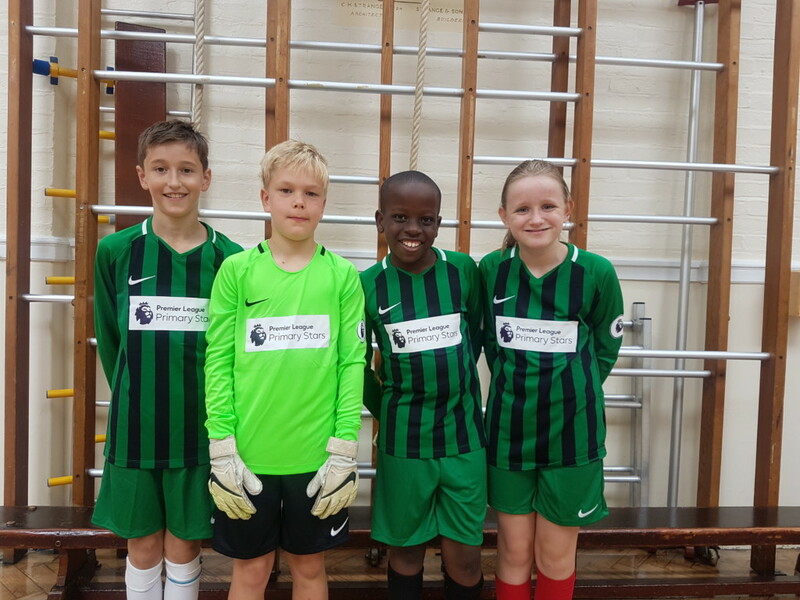 St Matthew’s was awarded the free Nike kit, consisting of 15 football shirts, shorts and socks, after Mrs Hookway’s successful online application through the Premier League Primary Stars website. 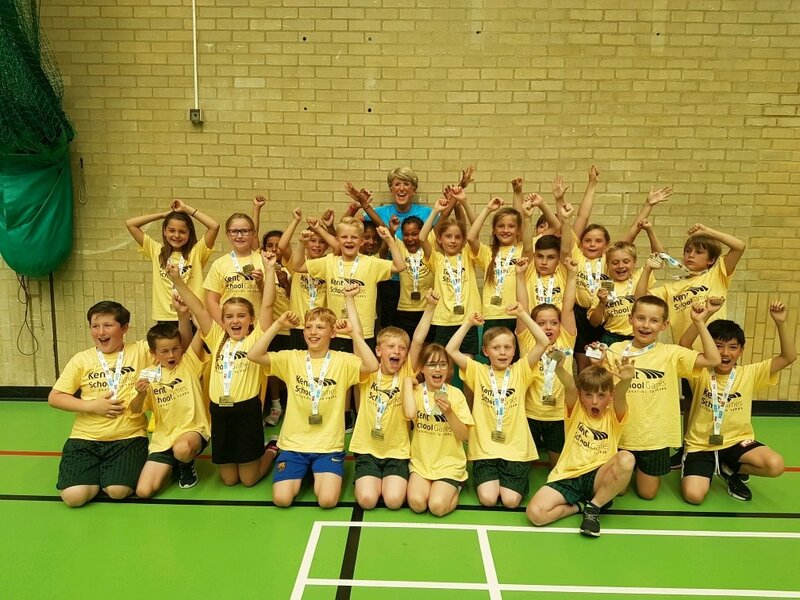 On Wednesday 27th June St Matthew’s took three teams to represent the Tunbridge Wells area in the Kent School Games Finals in Canterbury. In the morning the Year 2 Infant Agility team attempted to regain the title we won last year. 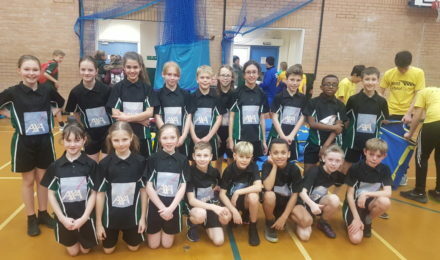 The team consisted of Justin, Jackson, JJ, Logan, Archie, Leah, Sally, Lacey, Freya & Florence and they all gave 100% effort and determination winning the competition by 20 points from 16 other schools from around Kent. The whole team was incredible but there were some outstanding individual performances from JJ who produced 60 speed bounces and Logan who threw over 15 meters in the javelin. 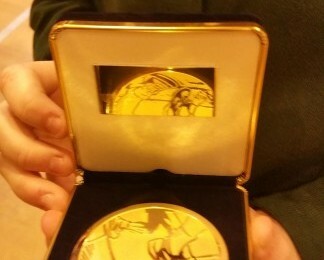 This was an amazing achievement but thoroughly deserved as the children had trained every lunchtime for 3 months. We were still on a high when the Year 3/4 competition began in the afternoon. 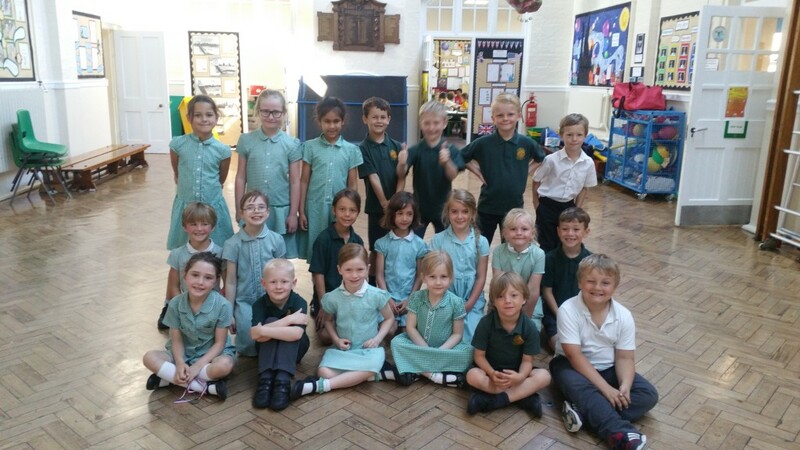 The team consisted of Matthew, Nikki, Jake, Jonathan, Theo, Freddie, Charlie B, Harvey E, Charlie W, Oliver, Harvey S, Harrison, Lilly, Lucy, Alana, Katelyn, Humairaa, Martha, Abbie, Keeley, Jessica,Annais, Aysha, Freya and Niamh. The competition started off really well with the boys winning the first relay. This continued with many of the team winning their field events. 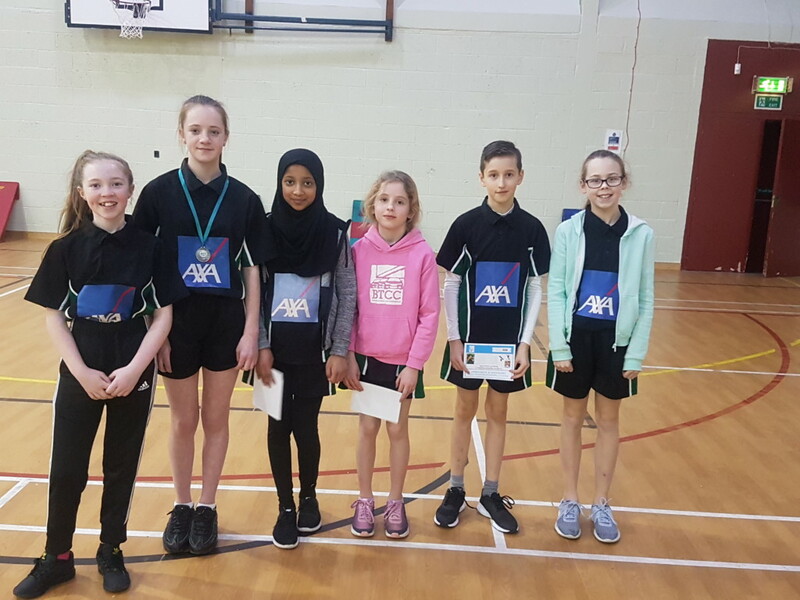 There were some outstanding performances from Abbie and Humairaa who both jumped 9 meters 50cm in the 5 strides, Harvey S and Theo in the chest push who threw 7 meters 75cm & 7 meters 25cm respectively, Alana who jumped 45cm in the vertical jump and Charlie W and freya B who produced 57 & 56 speed bounces. It was a nervous wait for the results but there were great scenes of joy when St Matthew’s were crowned Kent Champions for the 2nd year running. Well done to each and every one of the team you were all spectacular and did St Matthew’s proud yet again. 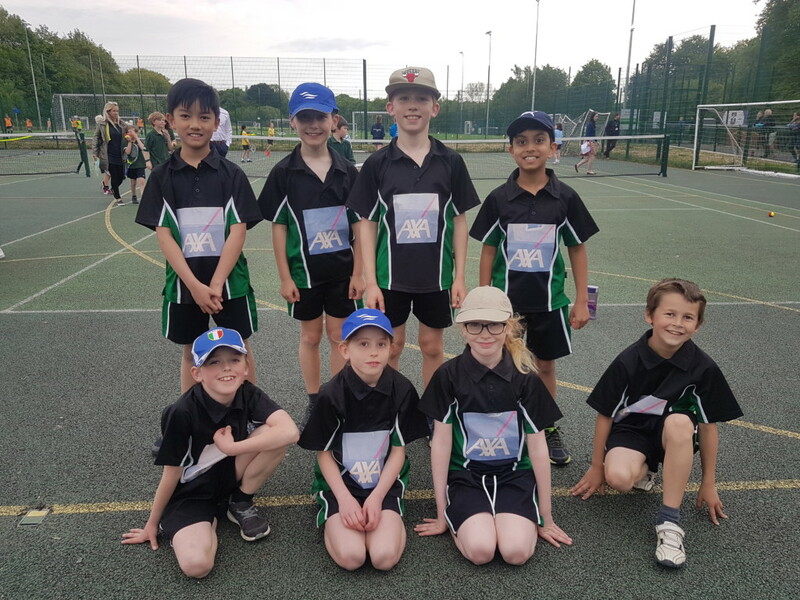 Also on Tuesday 27th June St Matthew’s represented the Tunbridge Wells area in the Kent School Games Final Tri-Golf competition in Canterbury. 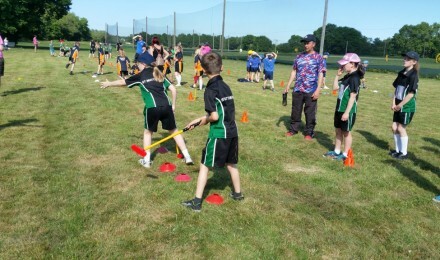 The team consisted of Leia-Mai, Olivia, Willow, Emma, Amelia, George, Ajay, Eryk, Harry & Aidan and the children had to complete 10 different activities testing their putting and chipping skills. 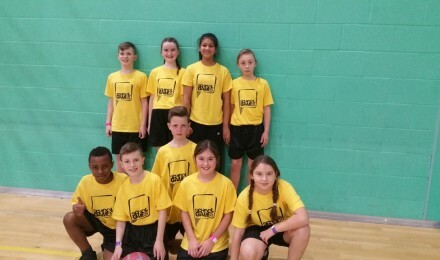 This was a huge achievement to even make the finals and the children all played really well finishing in 11th place out of 16 schools a result they should be really proud of. 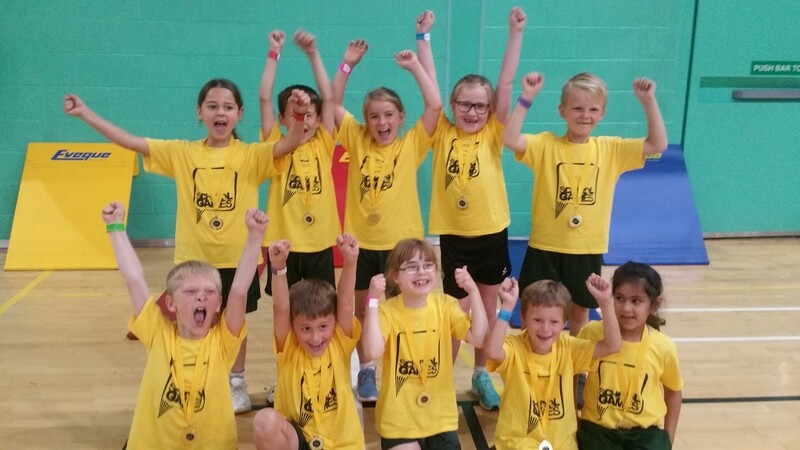 On Thursday 21st June St Matthew’s took part in the Inter Schools Year 5/6 Handball Tournament at Hayesbrook School. As handball is one of the children’s favourite sports we took three teams. The A team consisted of Luka, Munashe, Kieran, Zach, Felix, Rhianna, Chloe, Erin & Shantaya. 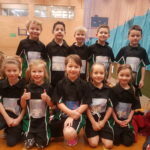 The B team consisted of Petroc, Harry, Archie, Theo, Tinashe, Frankie, Olivia and Ruby. The C team consisted of George, Ben, Henry, Jack, Joe, Lily and Hadia. It was an incredibly hot day but all the teams battled on playing superbly well. The A team played incredibly well in the group stages, only losing one game. 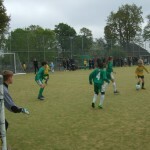 They progressed onto the semi- finals where the score was a draw and in extra time they unfortunately lost on a penalty. 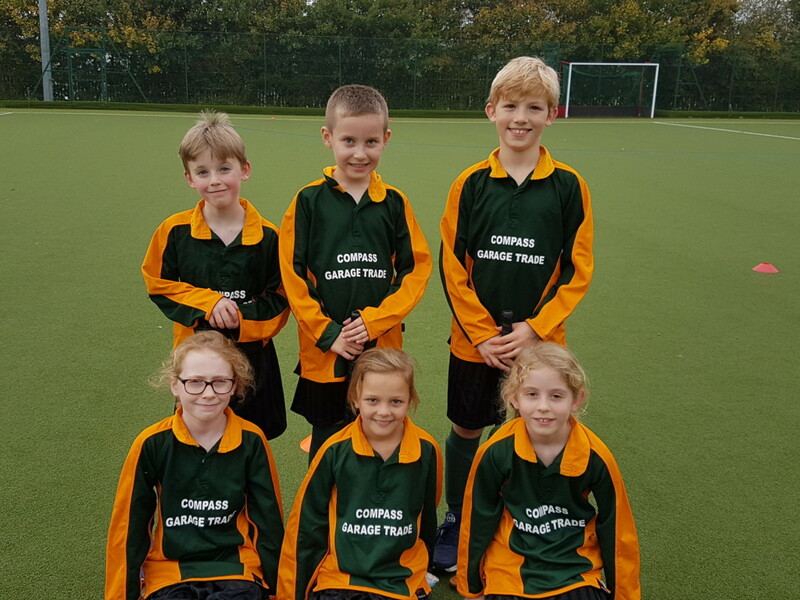 The B & C teams also played really well winning many games and all the children showed great skill and determination and they did St Matthew’s proud. 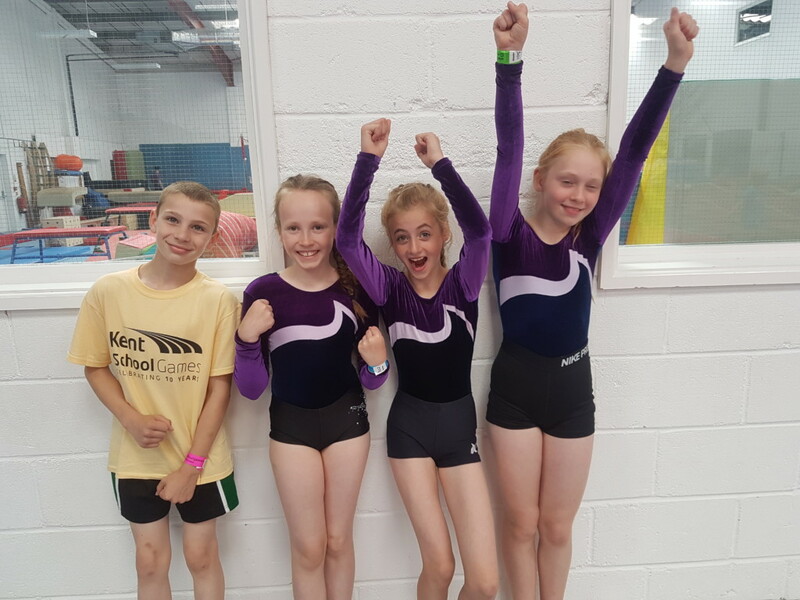 On Tuesday 19th June St Matthew’s Year 6 gymnastics team took part in the Kent School Games Gymnastics Finals in Maidstone. 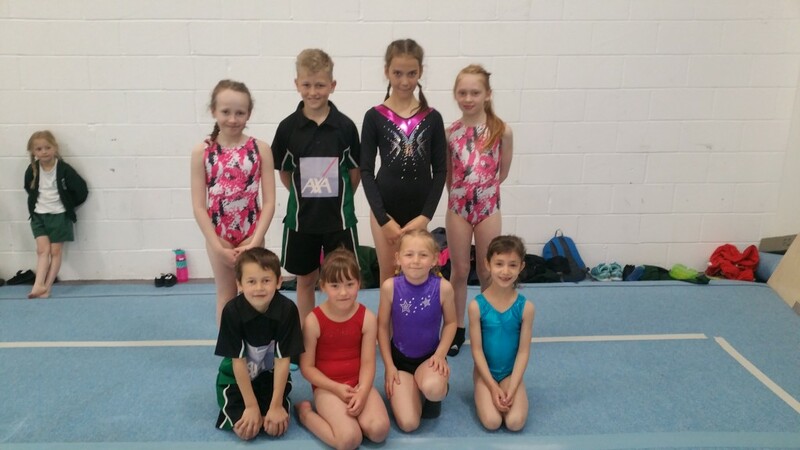 The team consisted of Jasmine, Sofia, Caoimhe and Zach and they performed incredibly well especially in the vault exercise where they all scored 9.7 out of 10. 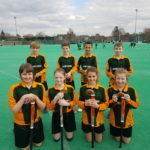 Their scores gained them second place out of 16 schools and a very well earned silver medal. Congratulations on an amazing achievement. 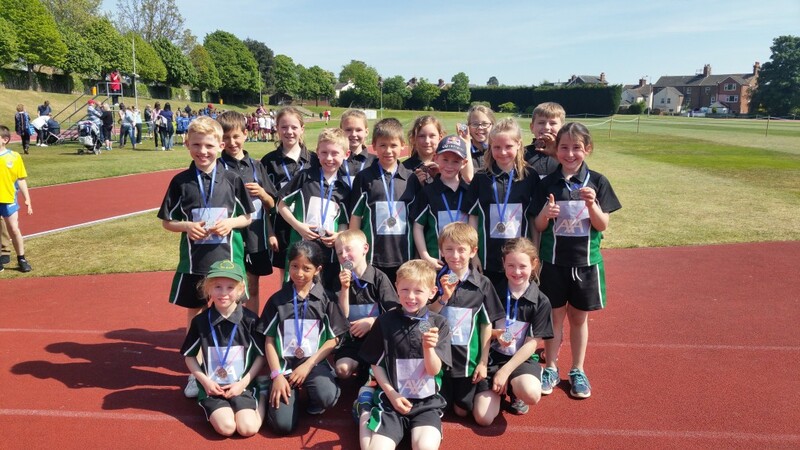 On Wednesday 13th June St Matthew’s had a fantastic day of athletics at the Tonbridge School with the Year 1/2 team becoming Pentathlon champions. 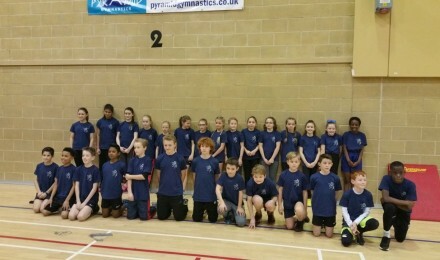 In the morning 25 children from years 1 & 2 took part in a Pentathlon which included Javelin, Chest push, Long jump, 5 strides and 60 meter sprint. Each event has standards, level 5 being the best and nearly all of the team achieved a level 5 in their respective events and Justin was the only child out of 120 athletes to achieve a level 5 in the 5 strides, a great achievement. The whole team performed brilliantly finishing first with 152 points, 10 points more than second place. During the afternoon the 3/4 team took part in their pentathlon and it was a really tightly fought battle for first place. We were lying in second place, 5 points behind Claremont in the last round of the competition and there was great excitement when Abbie, Humairaa, Nikki & Matthew all managed to get maximum points in their events meaning we finished 1 point behind Claremont. This was a great achievement but also disappointing as it was such a close finish. Well done to the whole team you were amazing. 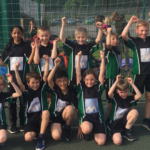 On Thursday 7th June St Matthew’s became champions in the first ever Year 3/4 Handball tournament at St Gregory’s School. 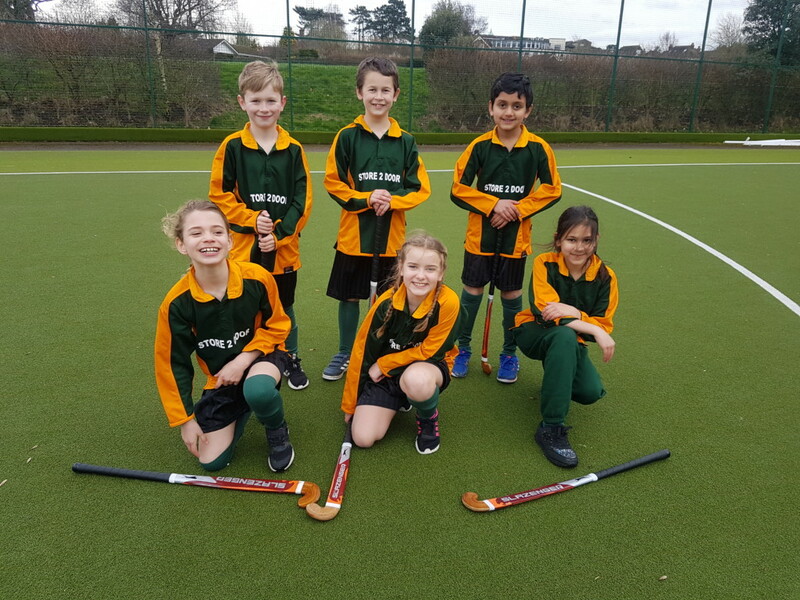 The team consisted of Theo, Oliver, Charlie, Jake, Jonathan, Nikki, Matthew, Annais, Abbie and Humairaa and the standard of our play was superb.They didn’t lose a single game in the group stages and progressed to the final where they played Claremont winning 8-3. There was some amazing play from all the children but Theo particularly showed great skill and determination scoring many goals. Well done guys we were very proud of you all. 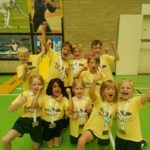 On Thursday 24th May St Matthew’s became the Tri-Golf Champions for the 2nd year running. 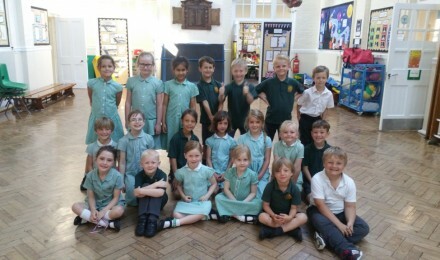 The team consisted of George, Eryk, Aiden, Harry, A-Jay, Amelia, Lea-Mai, Emma, Willow and Olivia. 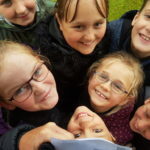 The weather was horrendous with torrential downpours, but the children battled on scoring some great points in the 10 disciplines and finished with 164 points, 60 more than 2nd place. The team now progress onto the Kent Finals on 27th June in Canterbury. Well done to all the team, you were fantastic. Golf stars Sheltering from the rain!! 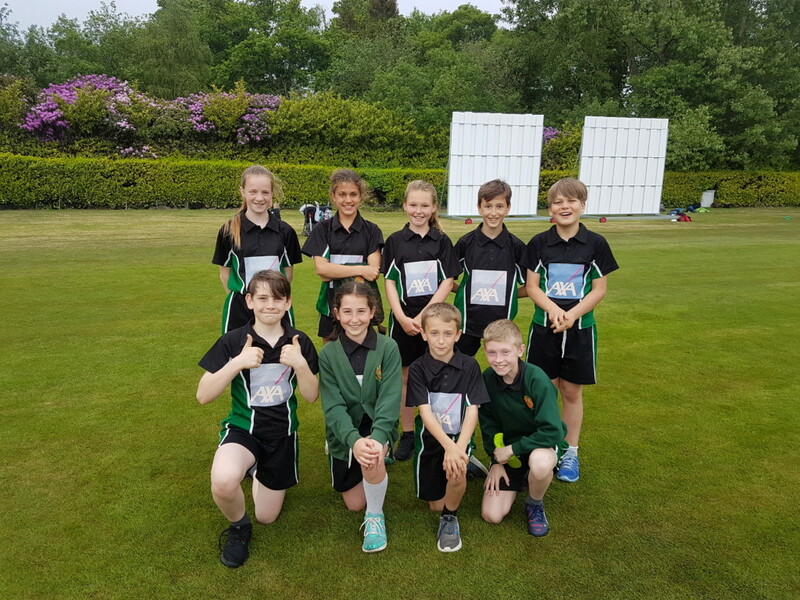 On Wednesday 23rd May St Matthew’s had two teams taking part in the inter schools cricket festival at the Nevil Cricket Ground. 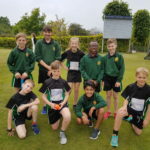 The A team consisted of Luka, Munashe, Petroc, Kieran, Harshal, Zach, Archie, Rhianna & Chloe and the B team consisted of Felix, Henry, Nathaniel, Dominic, Joe, Erin, Lily, Shantaya & Becca. There was some superb bowling and fielding from both teams and many players were caught out on a zero score as a result. 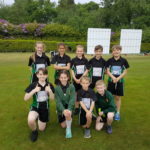 The A team were very unlucky missing the final by one run and then having to play in the play off game for 3rd which resulted in a tie at full time and then a golden bowl which they lost and finished in 4th place out of 12 schools. The B team played equally well and finished in 10th place. Well done to both teams. 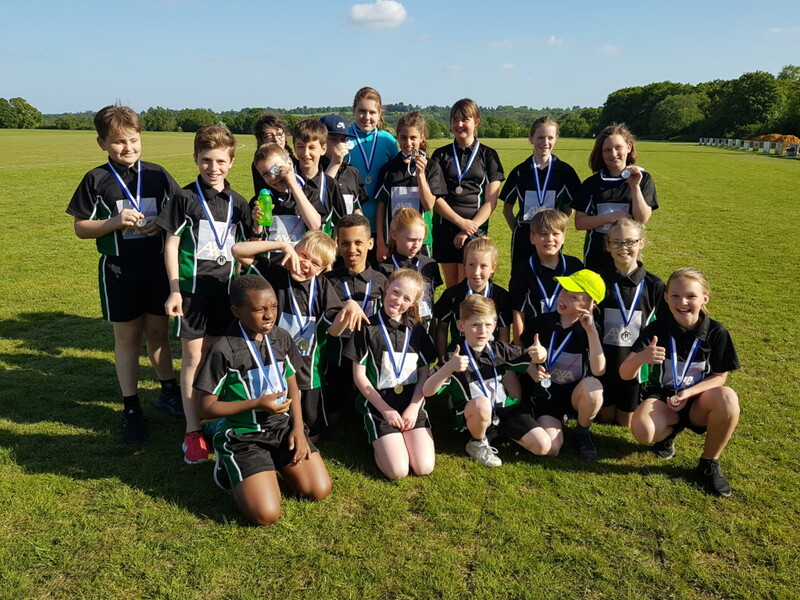 On Tuesday 22nd May St Matthew’s took part in the Primary Tag Rugby Festival at Tunbridge Wells Rugby Club and the A team consisted of Luka, Munashe, Rhianna, Kieran, Harshal, Zach, Shantaya, Lily & Olivia and the B team consisted of Petroc, Freddie-Lee, Joe, Jashua, Charlie, Bailey, Erin, Demi, Amelia & Hadia. The rules of tag rugby have been changed by the Rugby Football Union and all competitions have to be fair play awards, which means the scores are irrelevant and the teams are judged on sportsmanship, respect, determination, good supporters and quality of play. 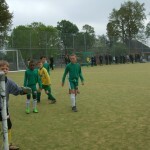 St Matthews A team won 4 games and lost 1 and the B team won 2 and lost 3. 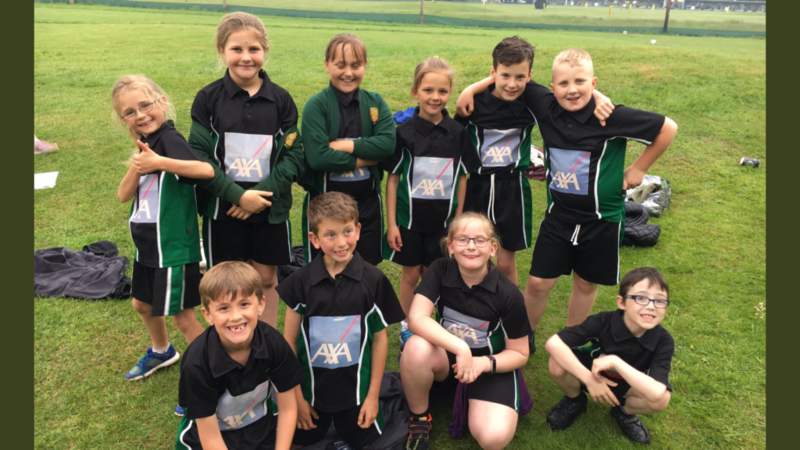 We were incredibly proud of all the children because not only did they display the required values but they also played some exceptionally good rugby. 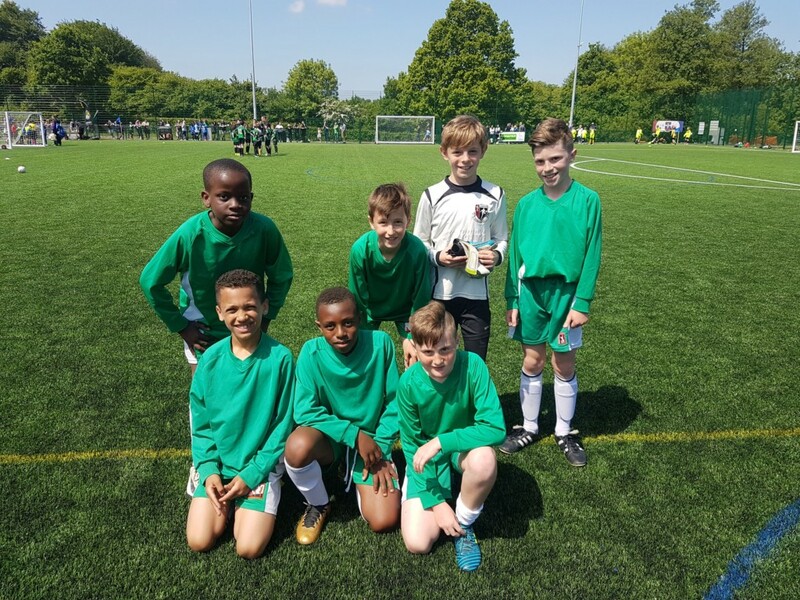 On Saturday 19th May St Matthew’s took part in the end of season Inter Schools Football Tournament at St Gregory’s School. 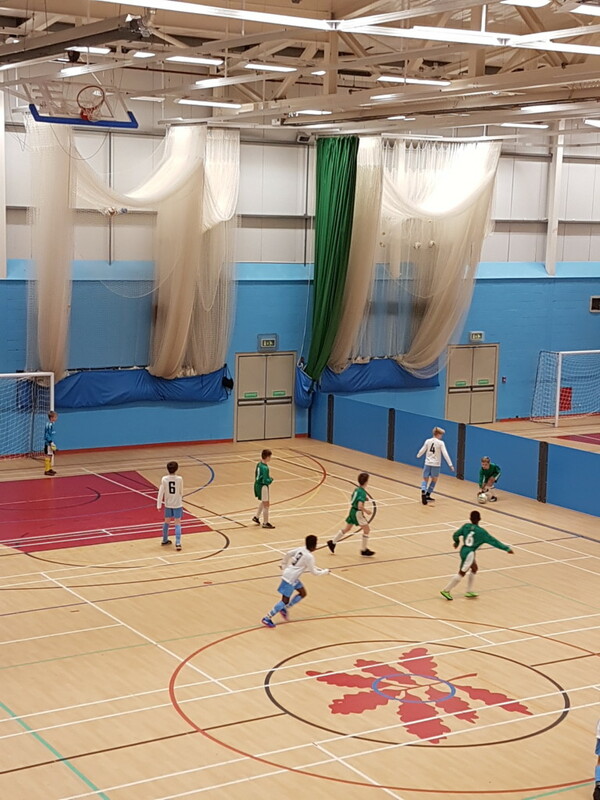 The team consisted of Luka, Munashe, Tinashe, Ethan, Henry, Archie & Kieran and they played really well throughout the group stages playing five games & winning 2, and drawing 3 games. This meant they won the group and proceeded to the final against Groombridge. It was a really close, exciting game but unfortunately Groombridge scored a goal in the last few minutes meaning they won 1-0. Well done to all the boys it was a great performance and a great finish to your time at St Matthew’s. 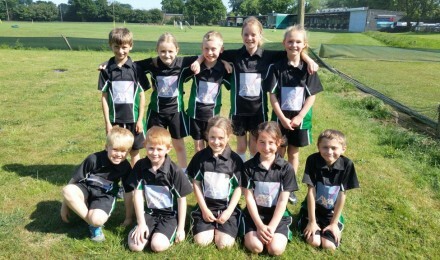 On Thursday 17th May St Matthew’s took part in the Year 5/6 Pentathlon at the rugby club. 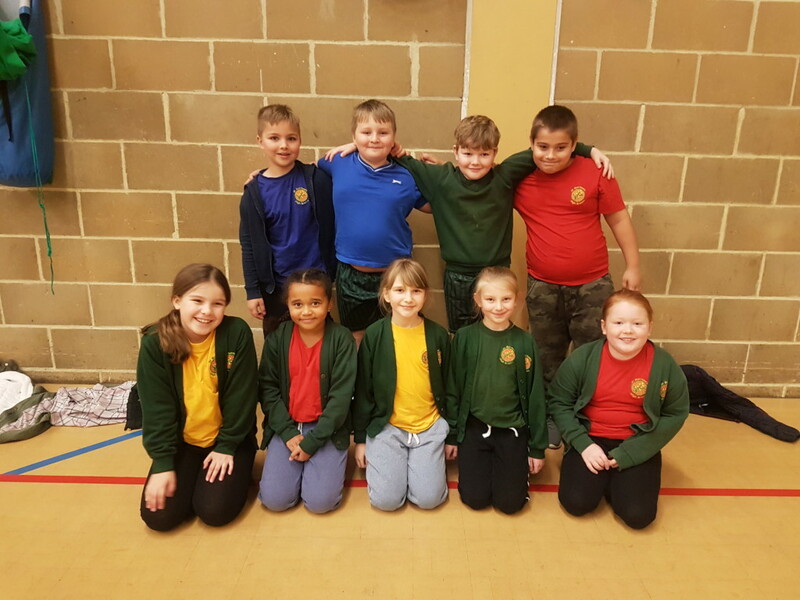 The team consisted of Olivia, Demi, Erin, Nicola, Lily, Harry, Henry, Joshua, Petroc, Dominic, Chloe, Kamilla, Tara, Jasmine, Rhianna, Shantaya, Luka, Munashe, Ethan, Zach, Nathanial & Felix. 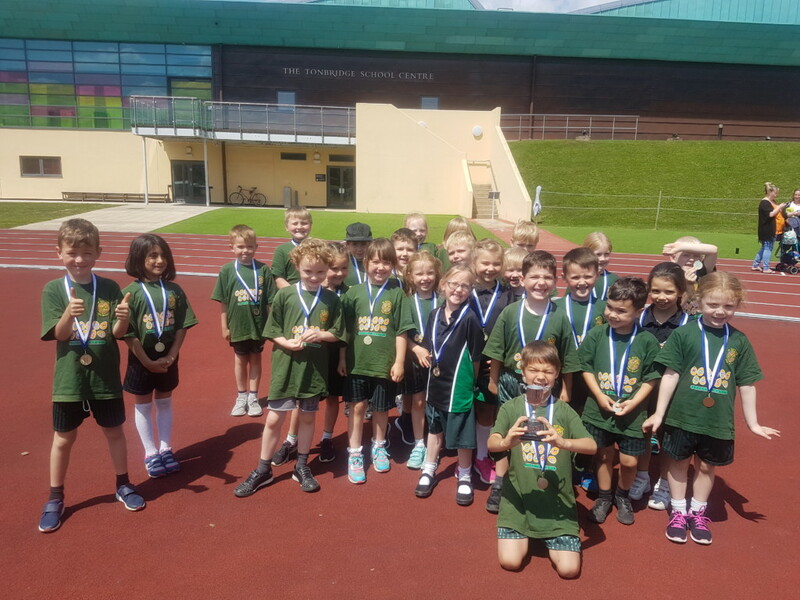 All the children had given up weeks of lunchtimes to practise their events and it definitely paid off as they finished in an impressive second place. 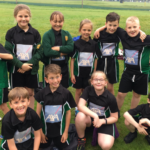 There were some remarkable individual performances, the best being a 26 metre javelin throw by Petroc, which is a new school record for Year 5 boys. Rhianna & Chloe also threw impressive distances in the girls javelin gaining 20 metres and 18 metres. Luka, Henry & Dominic produced some incredible jumps in the triple jump gaining 6m, 6m 02 & 6m 15 respectively. I was really proud of the whole team as they were up against some tough competition so very well done to each and every one of them. 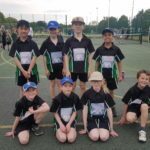 On Wednesday 16th May St Matthew’s took part in the Year 3/4 Kwik Cricket Tournament at the Nevile Cricket Ground and the team consisted of Matthew, Ganeshai, Jonathan, Jake, Charlie, Annais, Humairaa & Theo. Considering the team had only had a couple of practises they played really well.and improved in every game they played. There was some impressive bowling and fielding from Charlie and Annais and the team finished in 5th place out of 12 teams. Well done guys. 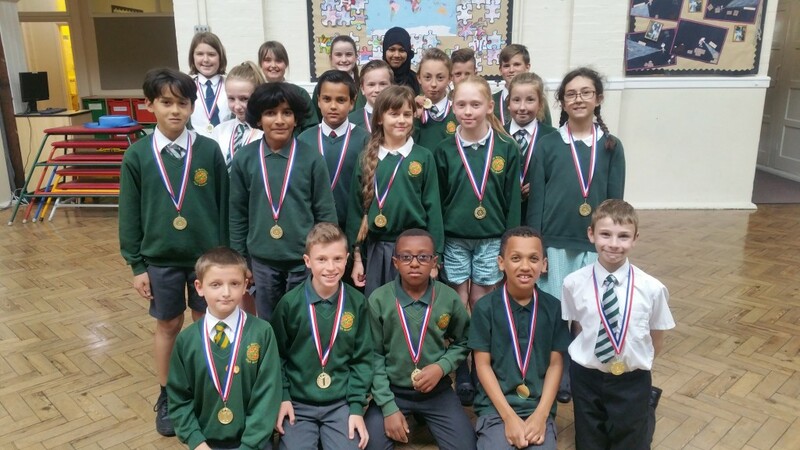 On Monday 14th May St Matthew’s took part in the inter schools mini tennis tournament at St Gregory’s school. 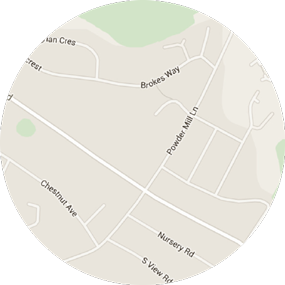 Our team consisted of Charlie, Theo, Jake, Abbie, Lucy, Ganeshai, Matthew & Nikki. 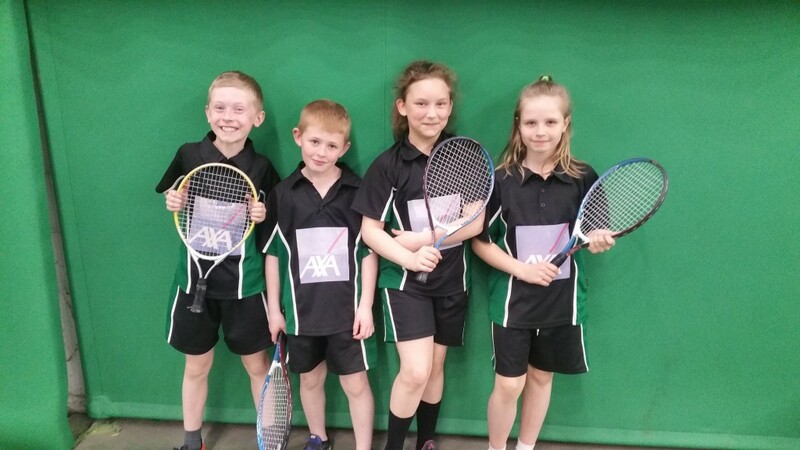 They played as doubles and performed really well showing some great tennis skills. Overall the team won 18 out of 20 games and finished as runners up which was really impressive. 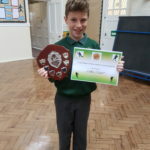 St Matthew’s has a new sports person of the year award and it was presented on Friday in collective worship. This award can be won by any child from Year R to Year 6 and the attributes required are enthusiasm, effort, talent, sportsmanship, respect and being a team player. 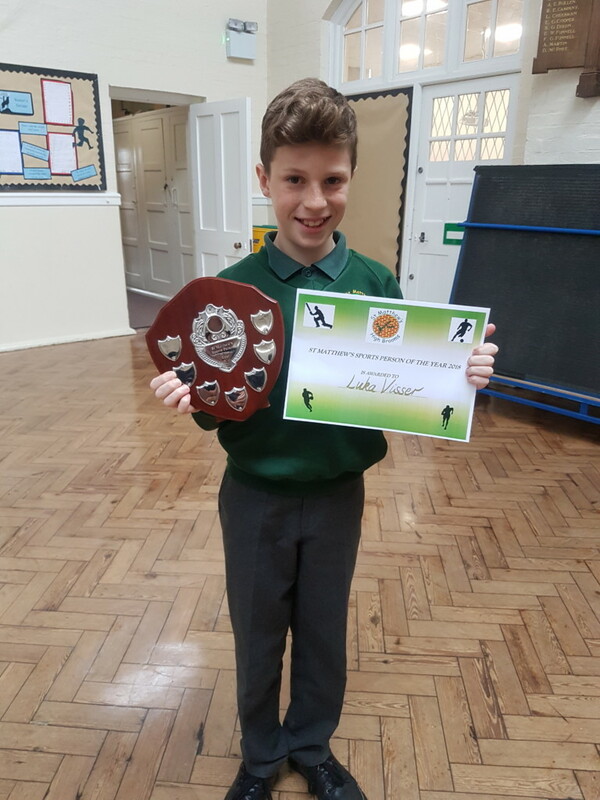 This is the first year that this award has been presented and I was really proud to award it to Luka from 6VT. He has given us great pleasure over the past few years watching him improve and succeed in all the different sports he takes part in. He has represented the school on many occasions and he always makes us proud to have him as part of the team. He is a wonderful winner but also a gracious loser and he is always ready to offer advice and encouragement to others. This year he has performed at the highest level, representing Kent at Indoor Athletics and being part of the winning team at the Southern Inter Counties competition. He is a valued member of St Matthew’s School and he will be greatly missed when he leaves to start secondary school in September. Congratulations Luke you are an all round superstar. 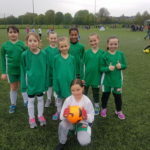 On Friday 27th April St Matthew’s had their first ever all girls football team competing in the Super League Tournament at Hayesbrook School. 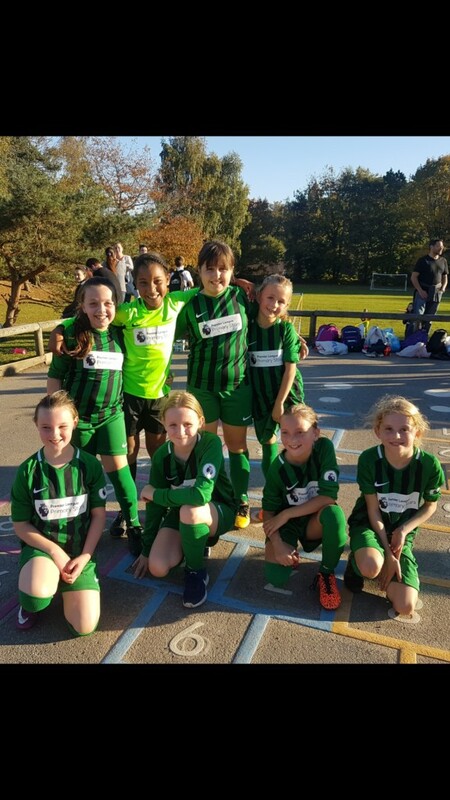 Our team consisted of Annais, Abbie, Aysha, Jessica, Annalys, Martha & Amelia and although they had never played a competitive game before they played surprisingly well. Annais was an absolute superstar in goal keeping a clean sheet in all three group stage games. They won the first game 3-0 against Yalding, won 1-0 against Laddingford and drew 0-0 against Southborough. 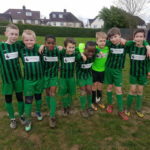 The team then progressed to the semi finals which was way beyond any expectations and they unfortunately lost 2-1 to Hildenborough. All the girls should be really proud of themselves as it was a brilliant performance from them all. 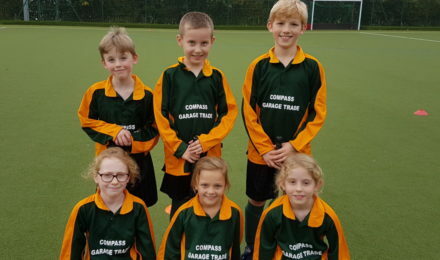 Year 2 team consisted of Cordi, Riley, Freya, & JJ and they finished in 4th place. 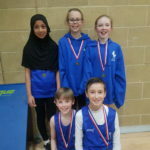 The Year 3/4 team consisted of Aysha, Keeley, Charlie & Charley and they also finished in 4th place. 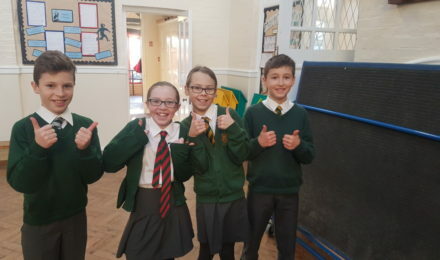 The Year 5 team consisted of Olivia, Demi, Daisy & Joe and they finished in 3rd place. 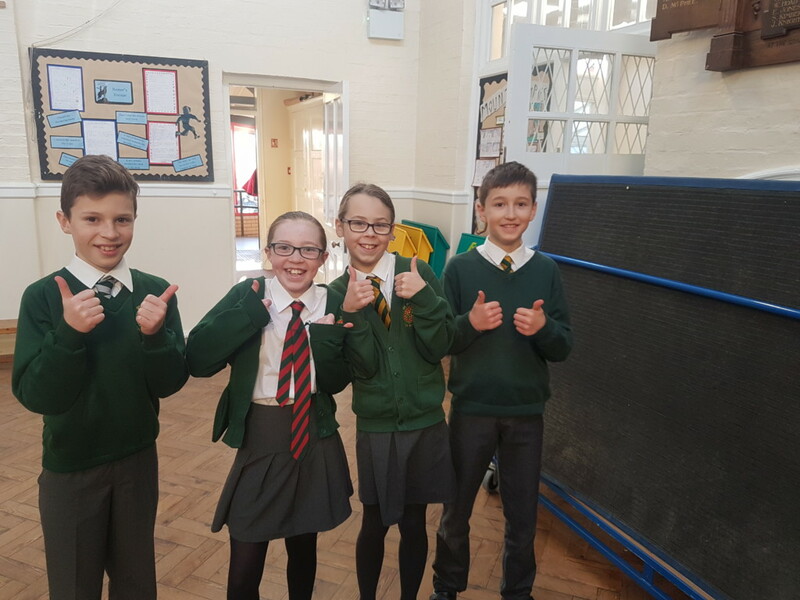 The most successful of our teams were the Year 6 team which consisted of Jasmine, Caoimhe, Sofia & Zach and they finished in 2nd place which means they now progress to the Kent Finals on 19th June. This will be the 2nd year running that we have qualified for the finals so we were very proud of their performances. 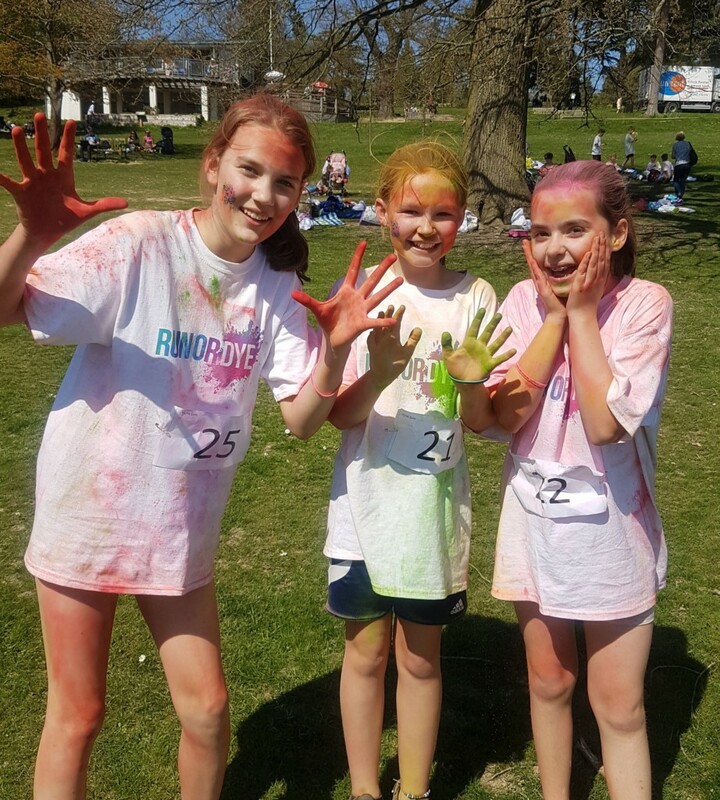 On Friday 20th April 22 children took part in a Colour Dash run at Dunorlan Park. It was a very hot day and the children were super excited to get covered in paint. Each race had 50 children in it and there were some superb performances from several of our children. 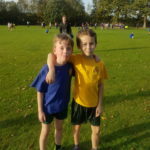 In the Year 3/4 boys race Jake finished in 1st place and Theo was 2nd. 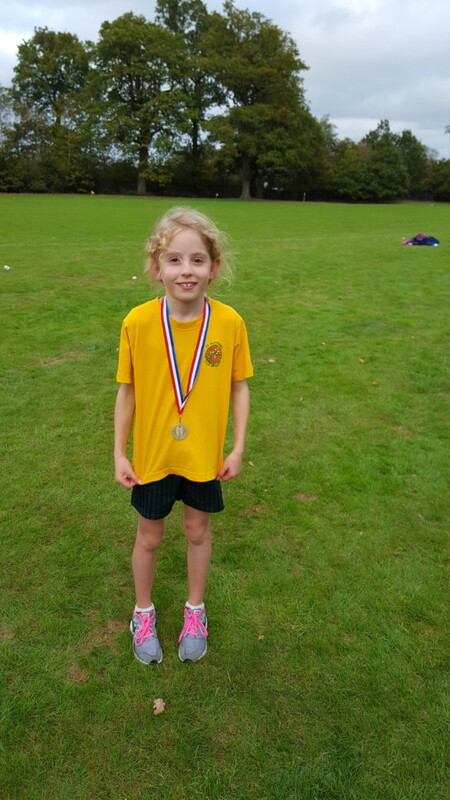 In the Year 3/4 girls race Abbie finished in 2nd place with a very impressive sprint finish for the line. 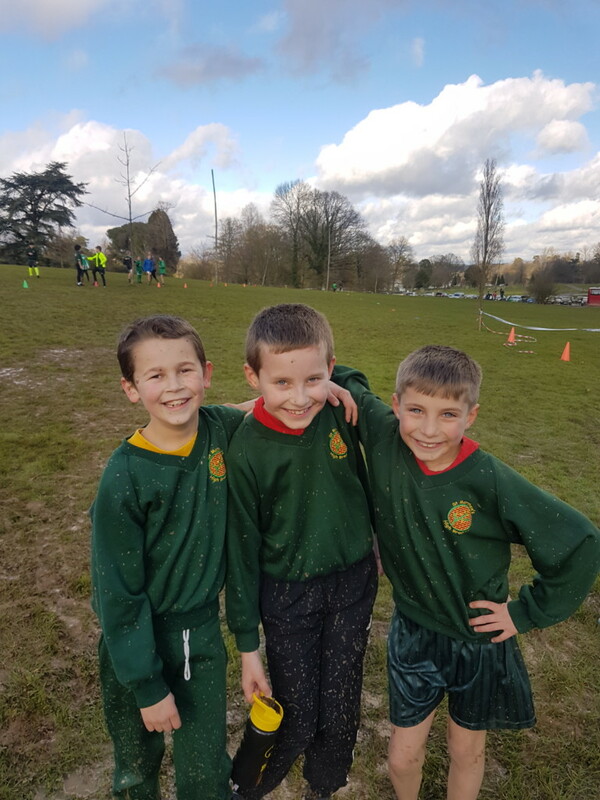 In the Year 5/6 boys race Luka finished in 3rd place ina very high quality race and Joe was in 5th place. Great fun was had by all the children and we can’t wait to take part again next year. 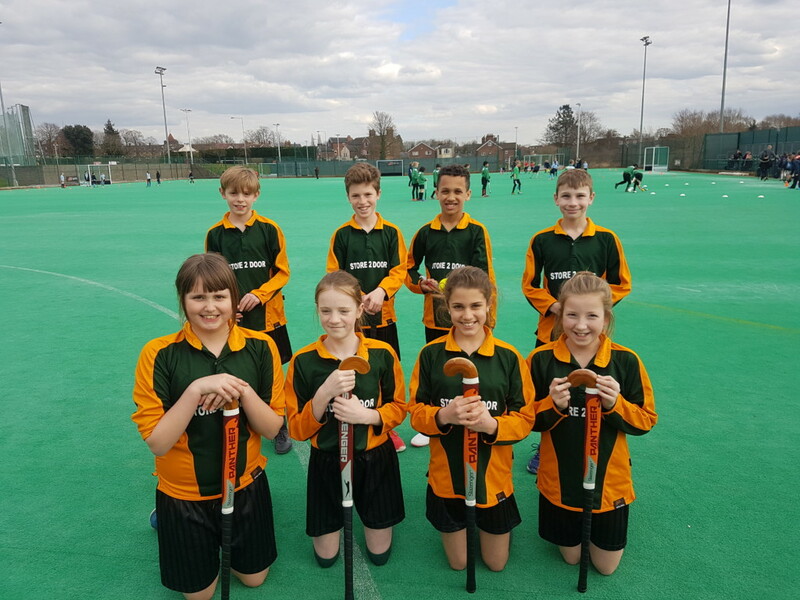 On Monday 26th March St Matthew’s took part in the inter schools quick sticks hockey tournament at Tonbridge School. 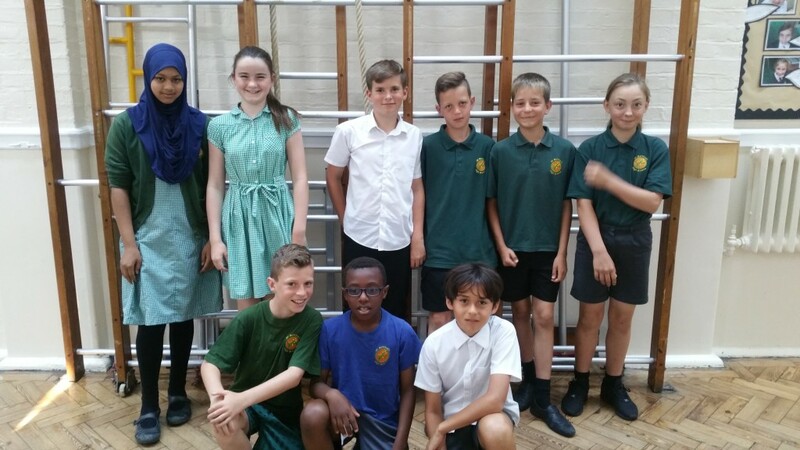 The A team consisted of Luka, Ethan, Zach, Kieran, Rhianna, Shantaya, Lily & Chloe and the B team consisted of Munashe, Harshal, Petroc, Archie, Sophie, Erin, Sofia & Lilly. 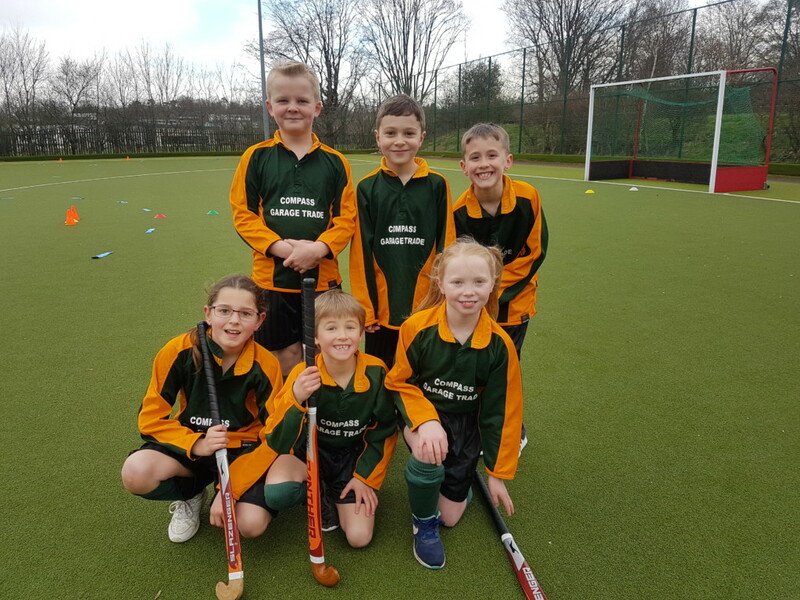 These were the most talented hockey teams we’ve had at St Matthew’s for many years and their performances were fantastic. 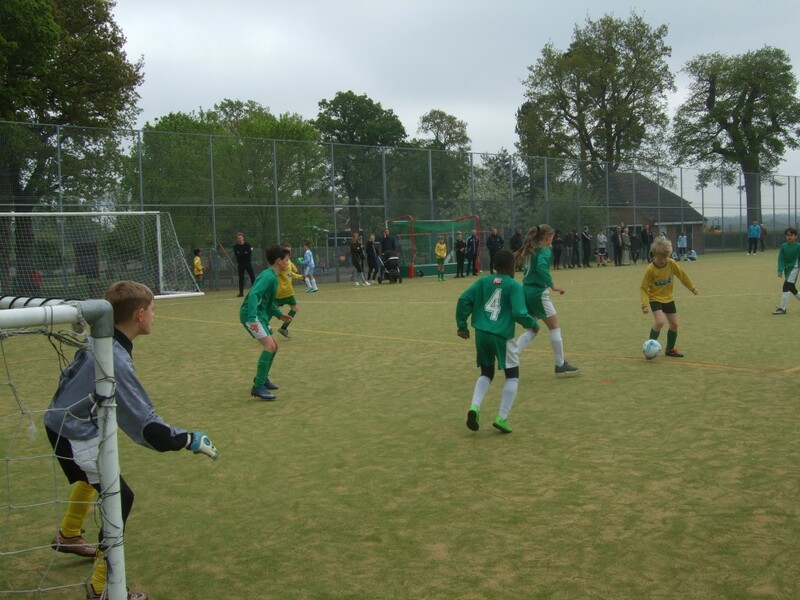 In the group stages each team had to play four games and both teams won every game which put them both into the quarter finals. Unfortunately the B team was beaten 2-1 by Pembury A but the A team beat Bidborough to progress to the semi finals against Pembury. After another superb game they won 2-1 and moved into the final against Claremont. It was a really exciting game finishing 1-1 at full time. It then went to extra time and sadly Claremont scored in the last minute. This was a huge achievement by both teams as we haven’t progressed out of the group stages in previous years and we couldn’t have been prouder. Every single player was superb and gave 100% but there were two outstanding performances from Luka and Ethan who showed great skill & effort. 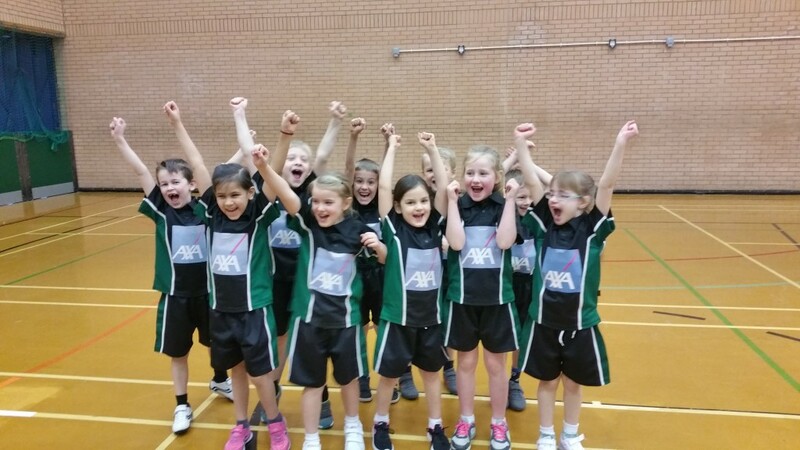 On Wednesday 14th March St Matthew’s took part in the first ever cheerleading competition at Tonbridge School. 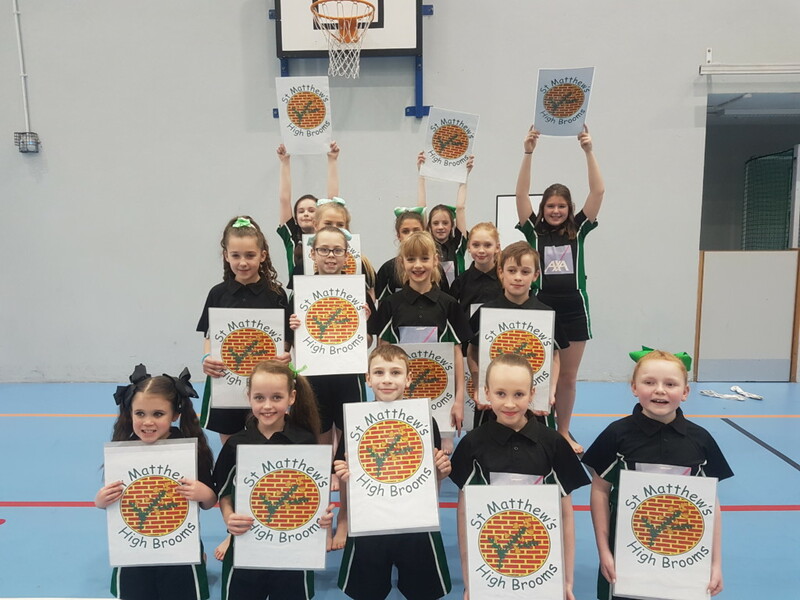 The team consisted of Caoimhe, Daisy, Ruby, Zach, Kamila, Frankie, Sophie, Imogen, Shantaya, Jasmine, Demi, Julia, Bailey, Lily and Sofia and they spent several weeks choreographing and practising a routine with the help of Mrs Brown and Mrs Lewis. It was great to see how imaginative the children were and how skilled the different moves were. The team performed in front of 3 professional judges and against 12 other schools. 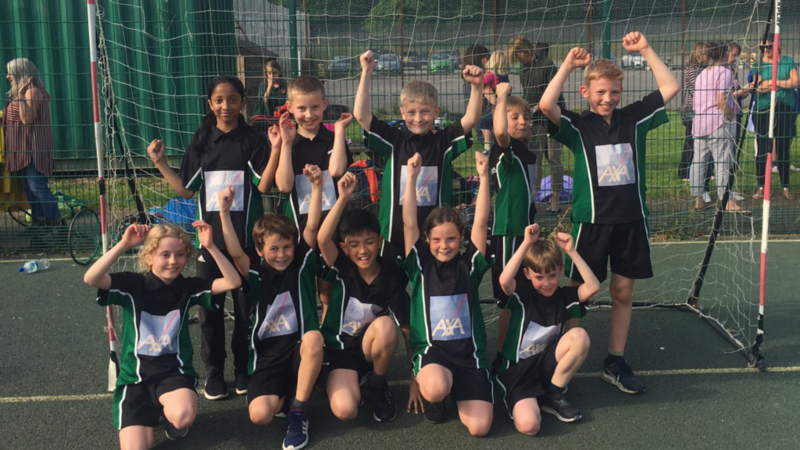 St Matthew’s scored 174 points out of 200 which we were really pleased with as it was the first time we had ever attempted the sport. 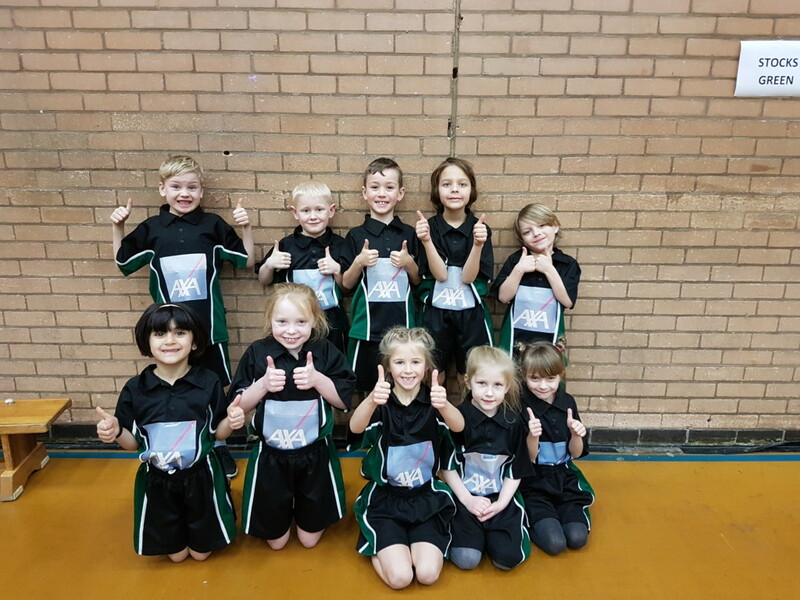 When the children were interviewed after their performance they said it was the most exciting thing they had ever done and really hoped that the school could set up an after school cheerleading club. Well done to the whole team we were very proud of you all. 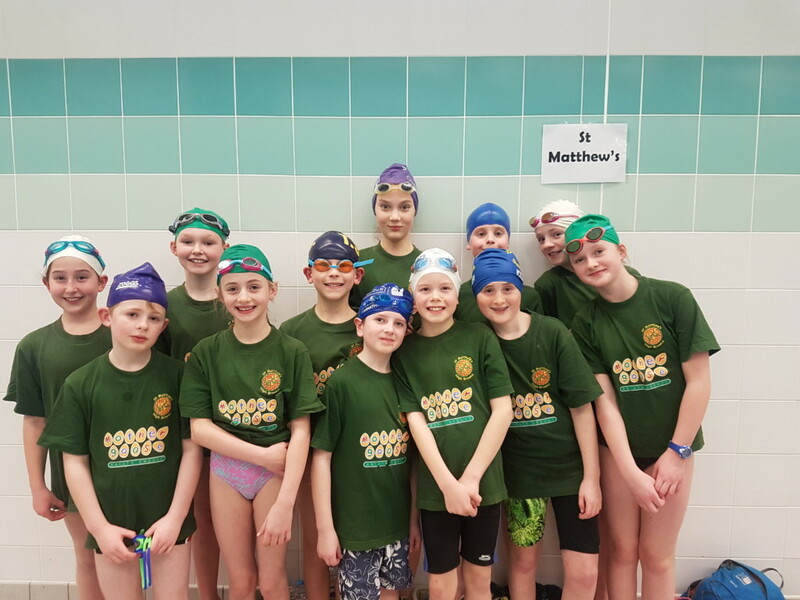 During the evening of Wednesday 21st February St Matthew’s took part in the inter schools swimming gala at Tunbridge Wells pool. This was only the second time we have managed to enter a team in this competition for over 15 years so there was great excitement from all the children taking part. 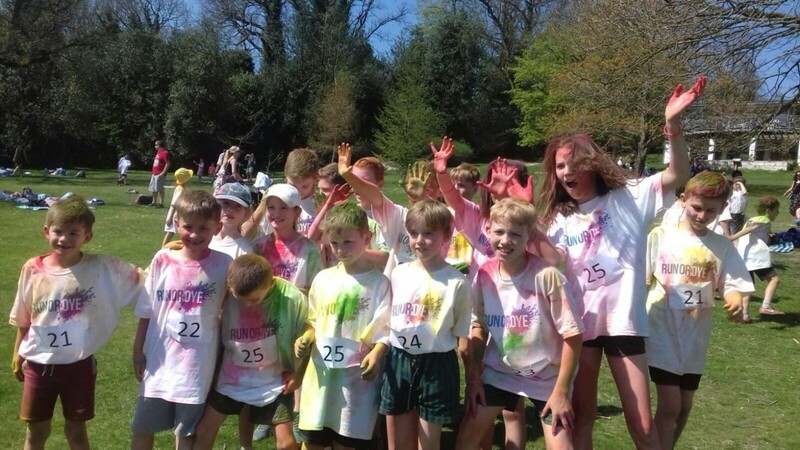 The team consisted of Niamh, Marta, Lily, Sofia, Erin, Becca, Charlie, Finley, Kyle, Matthew, Archie and Ben. 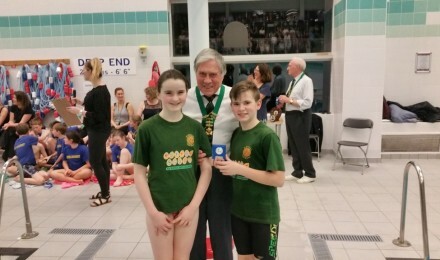 There were stand out performances from Niamh in the Year 6 girls freestyle and Matthew in the Year 5 boys freestyle as they both finished in 2nd place. All of the children gave 100% swimming against some very talented swimmers from other schools and it was lovely to see them all smiling and feeling super proud of themselves. A big thank you to Mike Smith who came along to help look after the team. 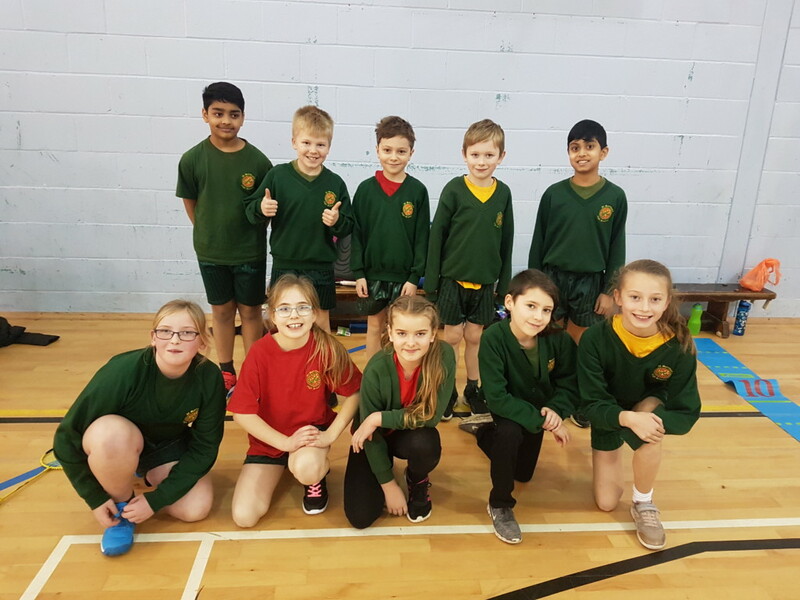 On Tuesday 20th February our Yr 3/4 athletics team became champions in the Inter Schools Indoor Athletics competition for the second year running. 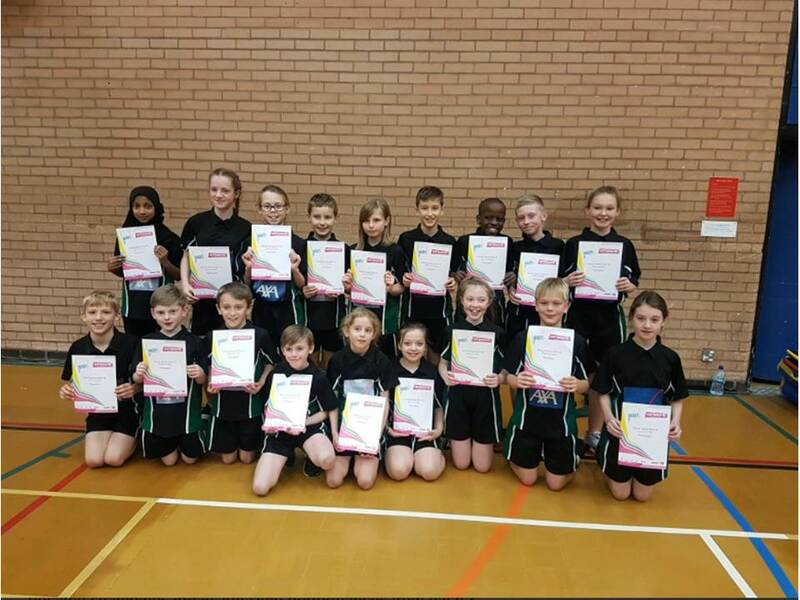 The team consisted of Abbie, Humairaa, Alana, Charley, Keeley, Annais, Annalys, Aysha, Martha, Harvey, Theo, Charlie, Nikodem, Oliver, Jonathan, Leon and Jake.The children had all trained so hard for this competition and it certainly paid off. They each had to do 2 running relays and a 2 jumping or throwing events. There was a superb performance from Abbie and Humairaa in the 2 x 2 lap relay and the boys team all ran amazingly winning 4 out of the 6 relays. Matthew was incredible in the boys 5 strides recording 9 meters 50cm and Oliver threw a huge 17 meters 80cm in the javelin. The team managed to amass a total of 442 points, 22 points ahead of second. 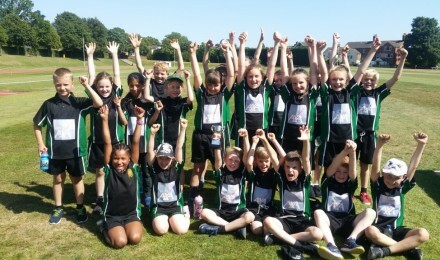 Well done to each and every one of the children we are very proud of them as they now progress onto the Kent School Games Finals in June. 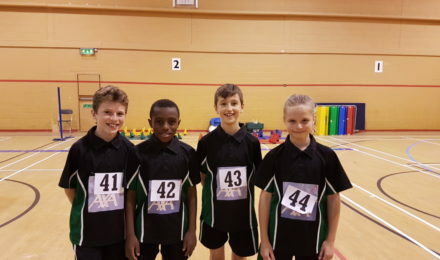 On Saturday 10th February Luka, Henry, Olivia and Demi were part of the Kent team in the Southern Inter Counties Indoor Athletics Championships in Guildford. 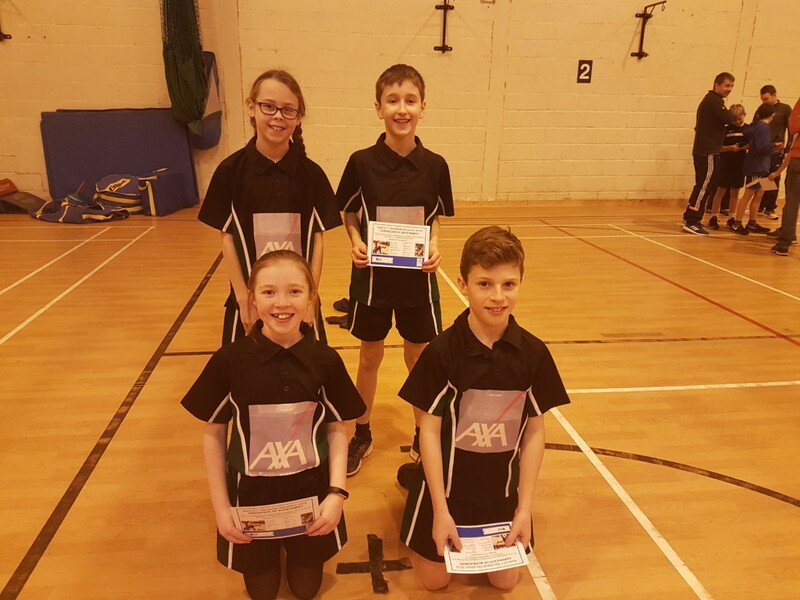 It was a fantastic competition with some very talented children making up the Kent team.The competition was against Berkshire, Buckinghamshire, Hampshire, Oxfordshire, Surrey, Sussex and the Isle of Wight. Luka was amazing jumping 49 in the vertical jump and gaining a 60 out of 60 seconds in the balance test. He was also part of the obstacle relay team that won by 2 seconds. Henry also performed really well jumping 1 meter 91 in the long jump and threw 16 meters in the javelin. The boys team was amazing winning the competition overall by 22 points from Berkshire. The girls team finished in 4th place, only 4 points behind third. Olivia had a great day recording 59 in the speed bounce and finishing first in the over under relay. Demi recorded 42 in the balance test and ran really well in the hurdles relay. 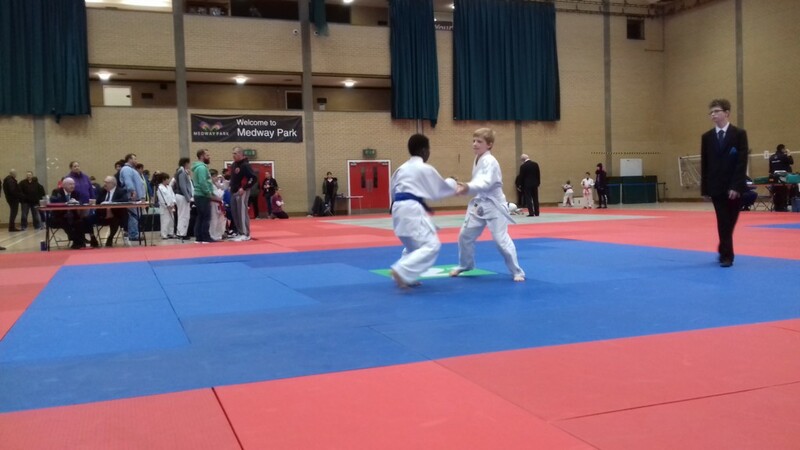 St Matthew’s are so proud to have four children who are talented enough to be selected for a Kent team, it is such a huge achievement, so very well done all of you..
On Saturday 20th January 2018 Theo took part in the Southern British Schools Regional Judo Championships in Gillingham. He fought really well winning several bouts and even fought against someone a year older and heavier than himself. It was a great day for Theo as he managed to win the silver medal. 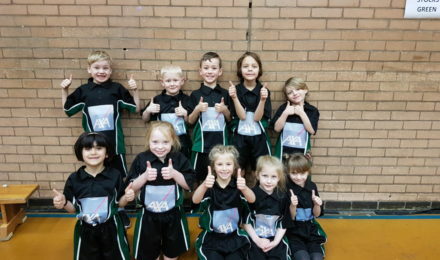 On Thursday 18th January St Matthew’s became champions at the Infant Agility competition for the 3rd year running. The team consisted of Jackson, Justin, JJ, Logan, Archie, Sally Lilia, Leah, Florence & Lacey. 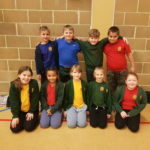 The children had to do 6 activities including, speed bounce, skittles, shuttle run, long jump, chest push and javelin and they all performed amazingly well gaining some really high scores. They had practised every lunchtime for 2 months and their dedication really paid off today. 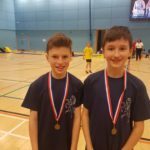 They will now progress to the Kent School Games Final in June. Well done to each and every one of you. 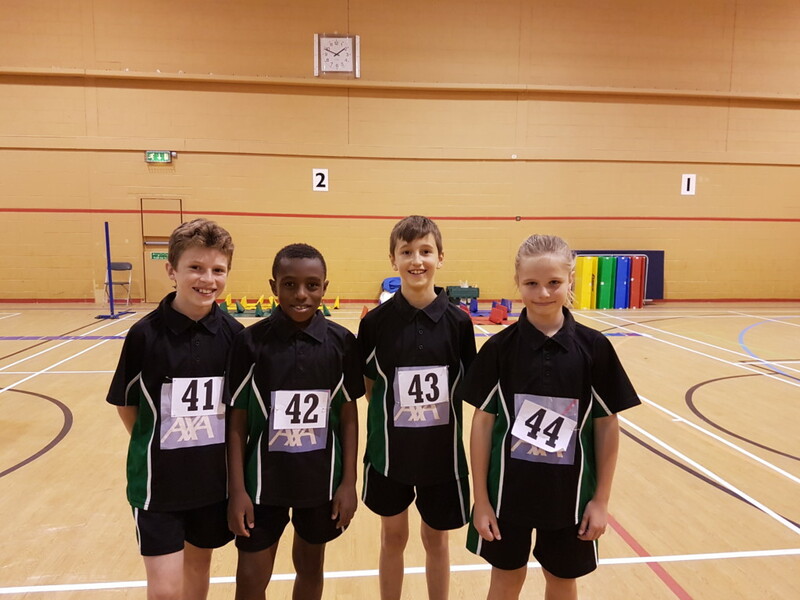 On Sunday 14th January Luka, Henry, Olivia and Demi took part in the Kent Decathlon Championships at the Stour Centre in Ashford. 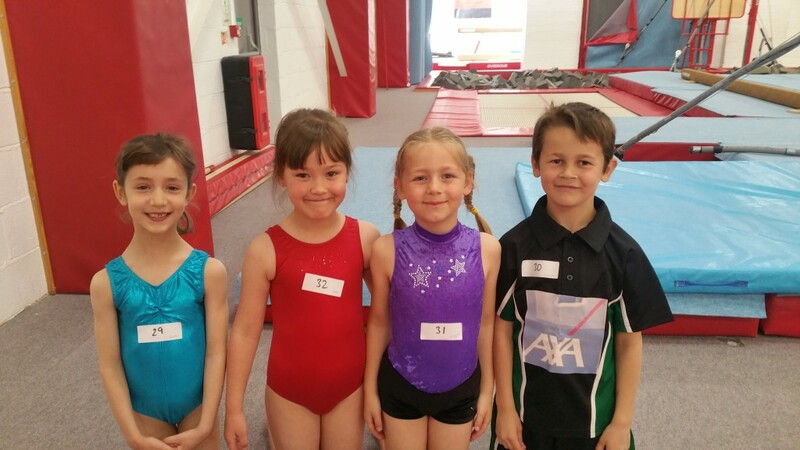 They had to take part in 10 different events to gain an overall score. Luka and Olivia were excellent in the balance bar gaining the maximum of 60 points. 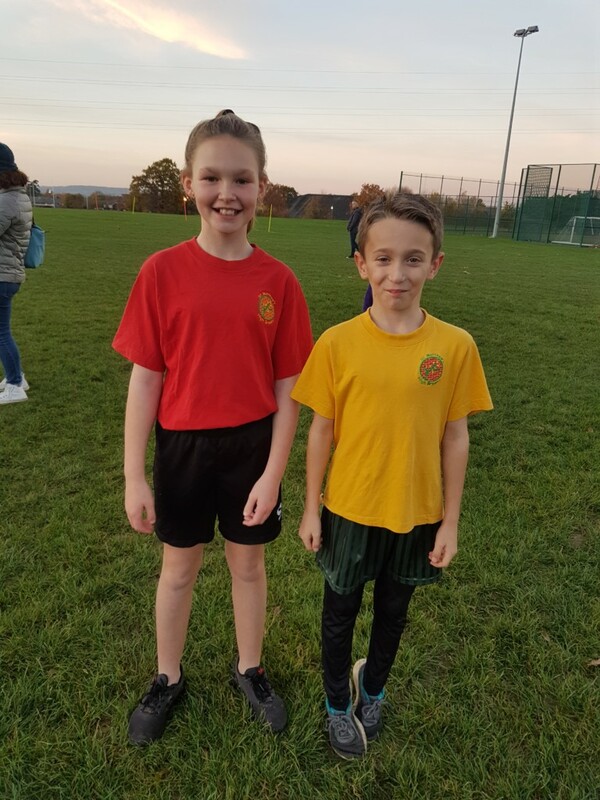 Henry gained the furthest distance out of everyone in the javelin throwing 17 meters and Demi achieved the second highest score in the target throw and ran a very fast time in the sprint race. There were 58 boys taking part and Luka finished in an incredible equal 3rd place and Henry was in 10th place. In the girls event there were 59 taking part and Olivia finished in 7th place and Demi in 9th place. 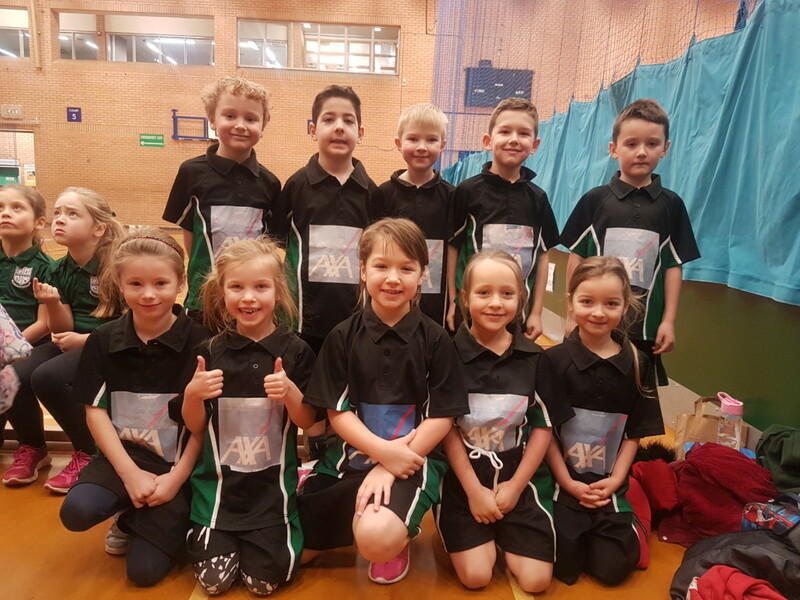 This was an amazing performance from all the children and they have now been selected to represent Kent in the Inter counties on 10th February. 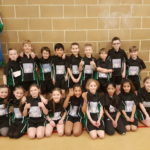 On Thursday 11th January St Matthew’s finished in 2nd place out of 12 schools in the Year 5/6 indoor athletics. 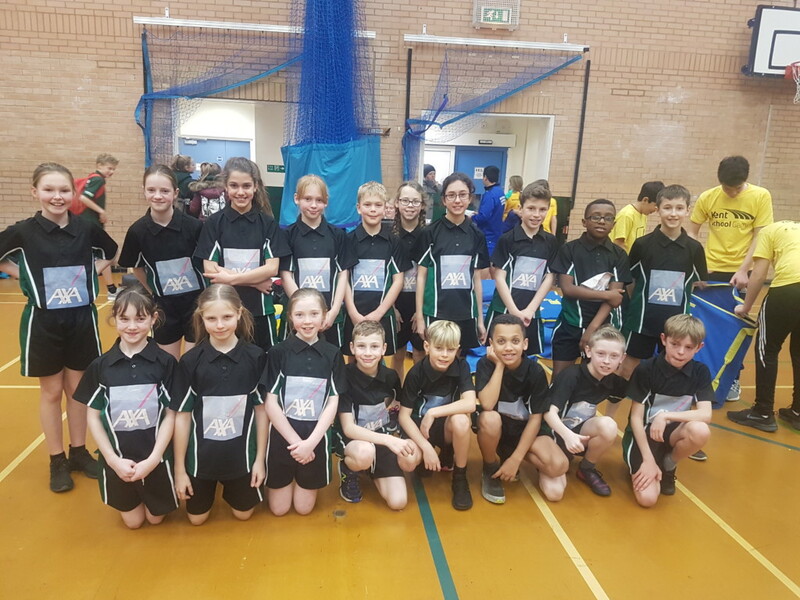 The team consisted of Nikola, Olivia, Demi, Lily, Jasmine, Erin, Tara, Ella, Shantaya, Luka, Munashe, Henry, Kieran, Ethan, Aiden, Dominic, Petroc & Zach. 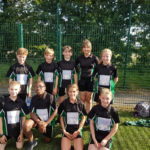 There were some fantastic performances especially from Demi & Lily who won the 2 + 2 relay, Luka & Henry who won the 1 + 1 relay and Munashe, Ethan, Aiden & Henry who won the 4 x 1 relay. 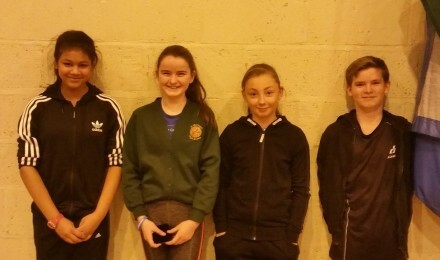 In the field events Olivia, Ella & Nikola won the girls speed bounce event scoring 54, 54 & 57. The boys, Luka, Munashe & Aiden also won the boys speed bounce event scoring 62, 60 & 54. 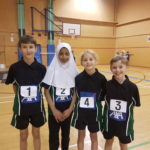 Munahse, Henry & Zach won the long jump and Tara, Jasmine & Demi also won the triple jump. All the children performed really well and did St Matthew’s proud. Well done all of you. 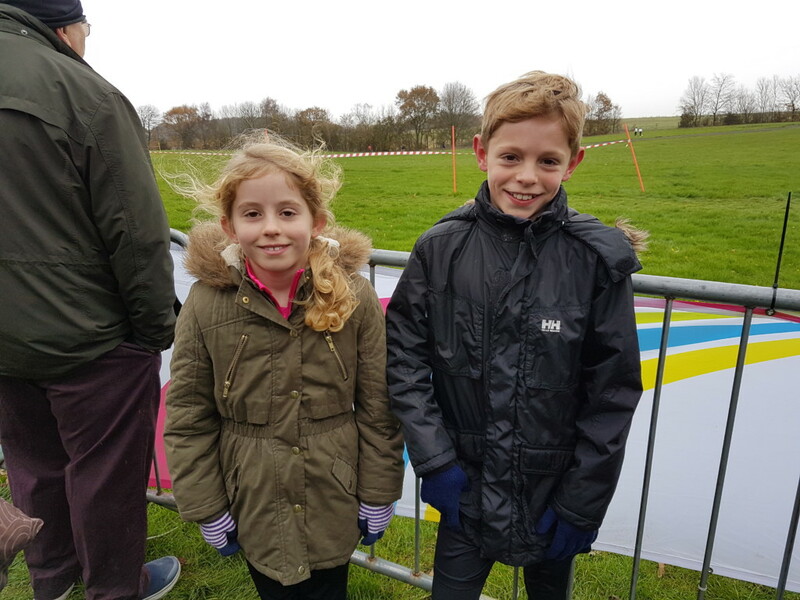 On Saturday 18th November Abbie and Kieran took part in the Kent Schools Cross Country Championships at Detling Showground. 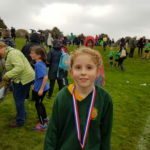 In the Year 4 girls race Abbie finished in a remarkable 5th place out of 145 runners. 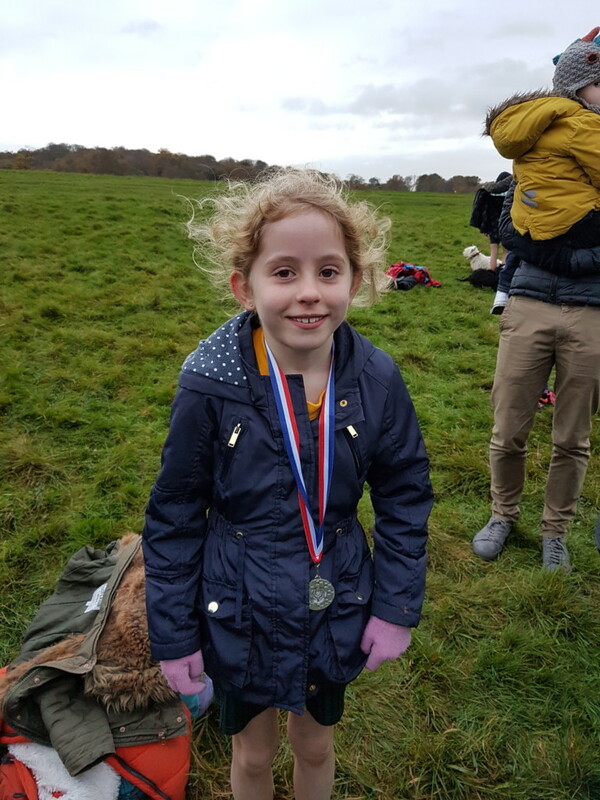 The course was over 1000 meters and her time was a really quick 5 minutes and 2 seconds which was 46 seconds quicker than she ran last year. 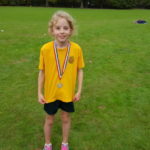 Abbie was also the first runner in from the South West Kent area which is a great achievement. 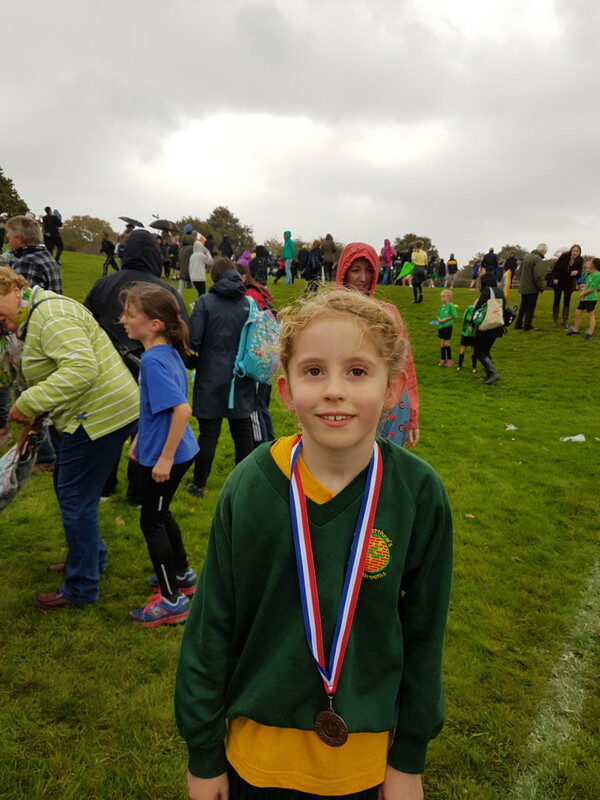 Kieran also had a brilliant run finishing in 39th place in the Year 6 boys race. This was the first time he had taken part in this competition so his result was really impressive. His time was a fast 9 minutes and 24 seconds and there were 165 runners in the race. Well done to both of you, you did St Matthew’s proud. 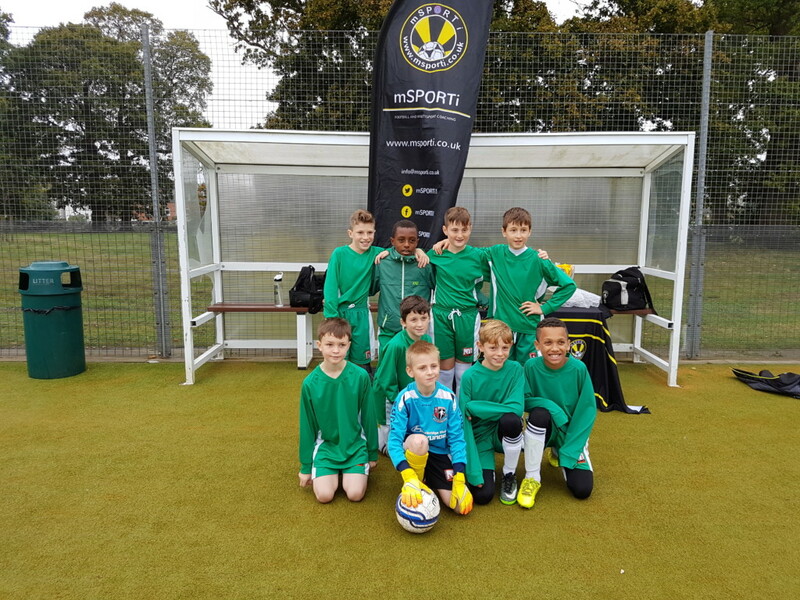 On Friday 10th November St Matthew’s took part in the annual 5 a side football tournament at Sevenoaks School. 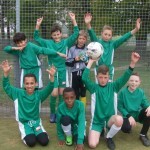 The team consisted of Harry, Kieran, Luka, Munashe, Ethan, Jamie, Riley & Archie. They played 6 games winning 3 of them 2-1, 5-2 & 5-0, but narrowly lost 3 games by 1 goal. 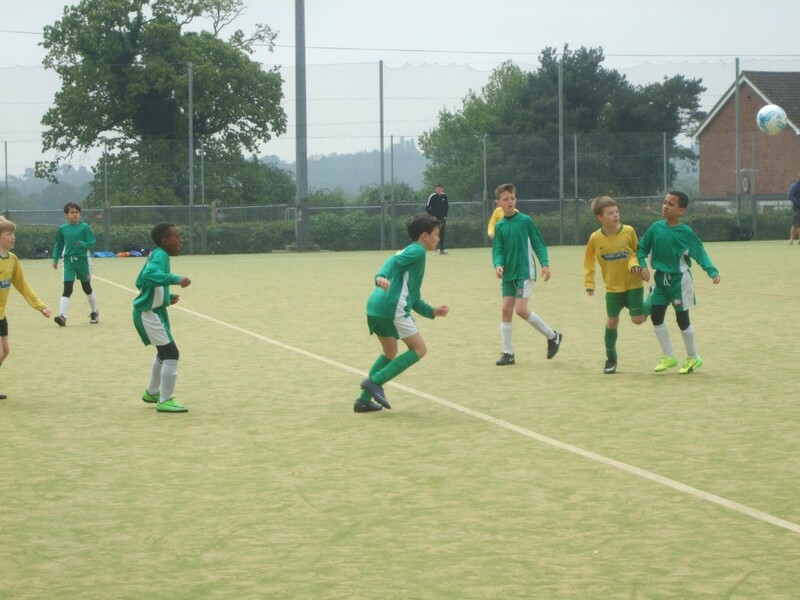 There was some skillful play from Munashe, Luka and Jamie which resulted in some great goals. 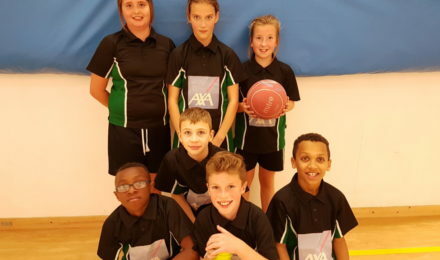 On Monday 6th November St Matthew’s took part in the 5/6 Basketball Tournament held at Skinners School. The A team consisted of Luka, Munashe, Chloe, Marta, Rhianna, Ethan & Zach & the B team consisted of Petroc, Nathanial, Kieran, Sophie, Erin & Lilly. There was some superb play from the A team who made it through to the semi finals. Munashe was voted Player of the competition by the referee.& Luka showed great skill with Rhianna played brilliantly in the centre. They beat St Barnabas 28-1, Speldhurst 19-7 & St James B 29-2, finishing 1st in their group.In the quarter final they beat Claremont 18-7.and then in the semi final they sadly lost to St James A by 1 basket. 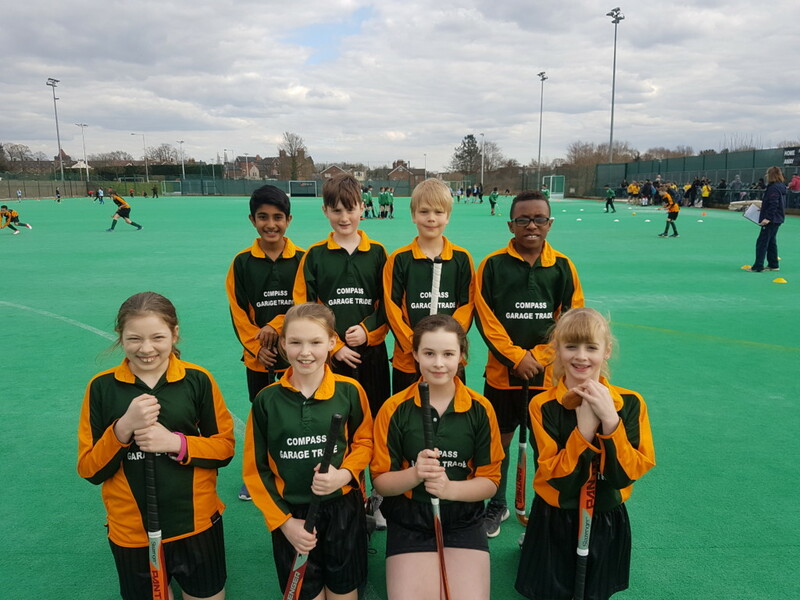 The B team also played brilliantly beating Bishops Down C 12-0, Langton Green 10-2 but losing 17-6 to St James A, finishing 2nd in the group stage. 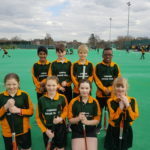 They went through to the quarter final where they beat Bishops Down B 9-1 and in the semi final they beat St James B 6-5. The final was a tough, physical game and St James beat us 12-6. A fantastic afternoon of basketball by both teams and the hours of practise really showed. Well done everyone of you. 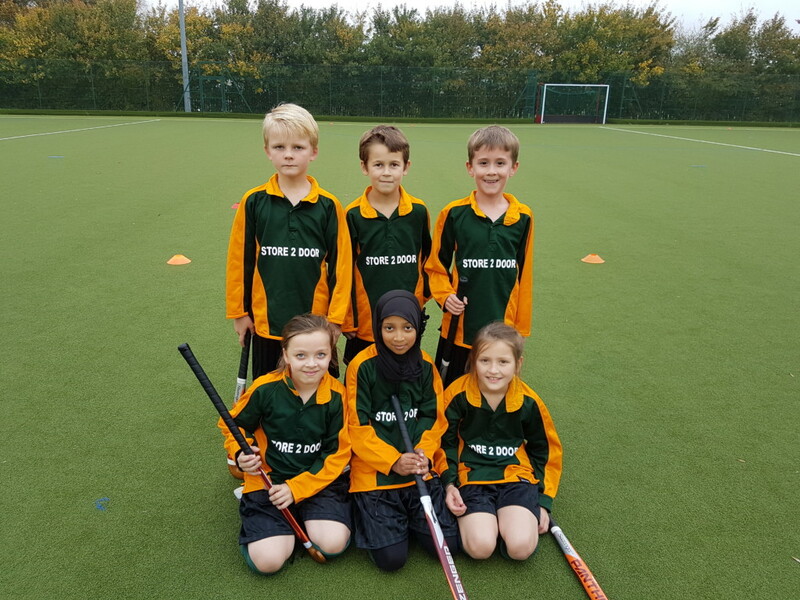 On Wednesday 18th October St Matthew’s took part in the Year 3/4 Hockey Festival at Tunbridge Wells Girls Grammar School. The A team consisted of Abbie, Lucy, Willow, Jake, Nikki and Theo and the team played 5 games. There was some great defensive play from Nikki and Willow and Jake really shone in mid field scoring several goals. We won 2 games 4-0 and 2-0 but sadly lost the other 3 and they finished 4th in Pool A. 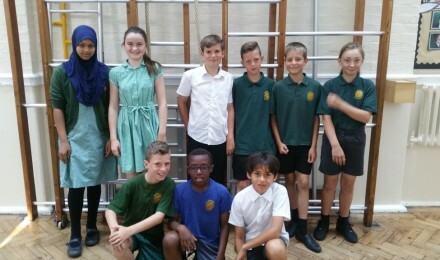 The B team consisted of Charlie, Aiden, Harrison, Humairaa, Aysha and Keeley. They only played 4 games but won 3 of them scoring a total of 9 goals and they finished 2nd in Pool B. Again there was some great defensive play from Charlie and Humairaa and Harrison and Aysha played really well in midfield scoring all the goals. Well done to all the children for giving a strong performance and representing your school so well. 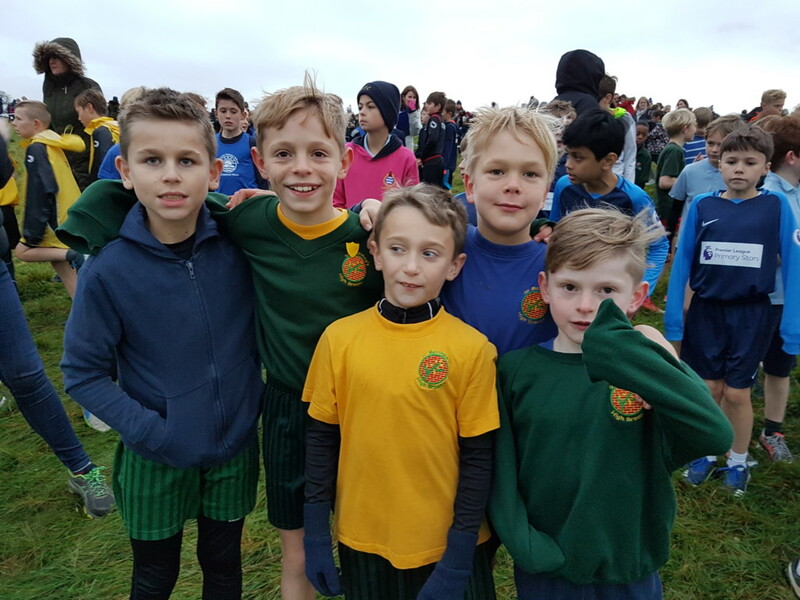 On Friday 13th October five St Matthew’s children took part in the first inter schools cross country race at Somerhill School in Tonbridge. Our team consisted of Abbie, Keeley, Erin, Joe and Kieran and there were some fantastic results. 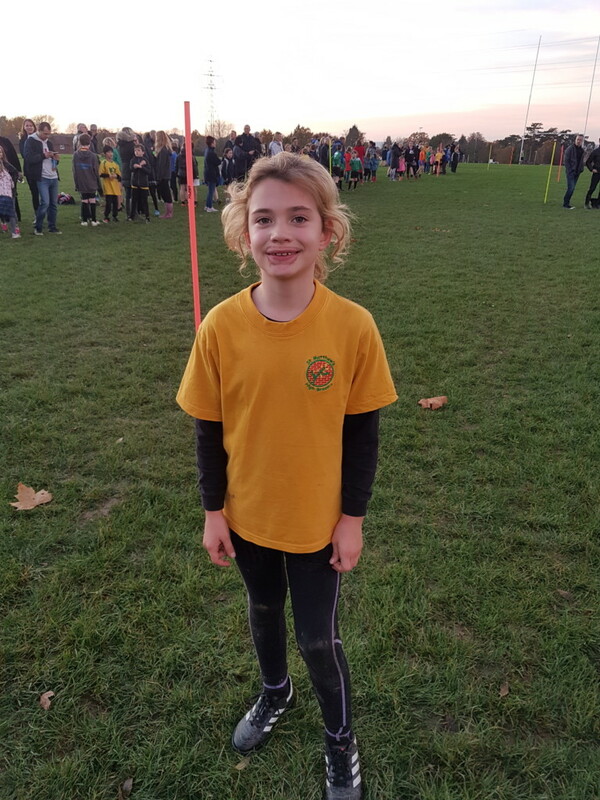 Abbie was amazing finishing in 3rd place in the Year 4 girls race, which is the highest ever finishing position by a St Matthew’s child. 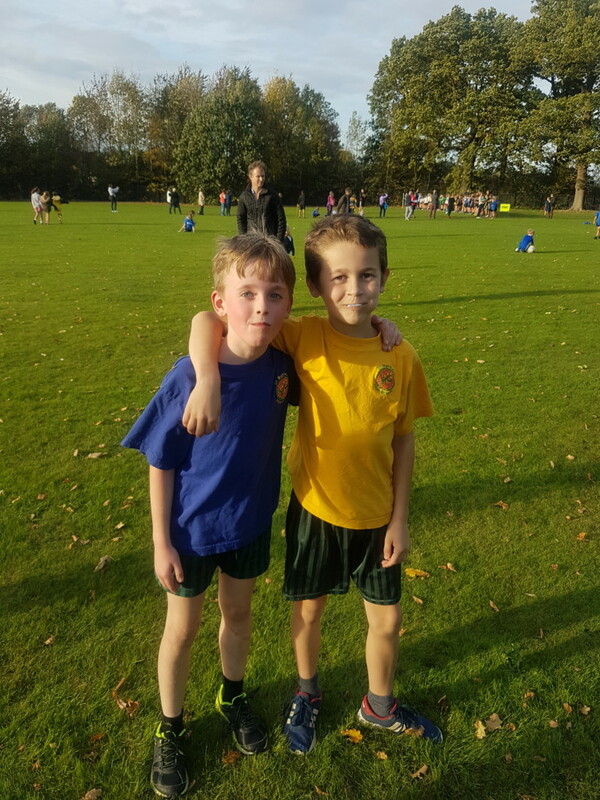 Her brother Kieran also had a superb run finishing in 11th place in the Year 6 boys race and the improvement he has shown this year is fantastic. 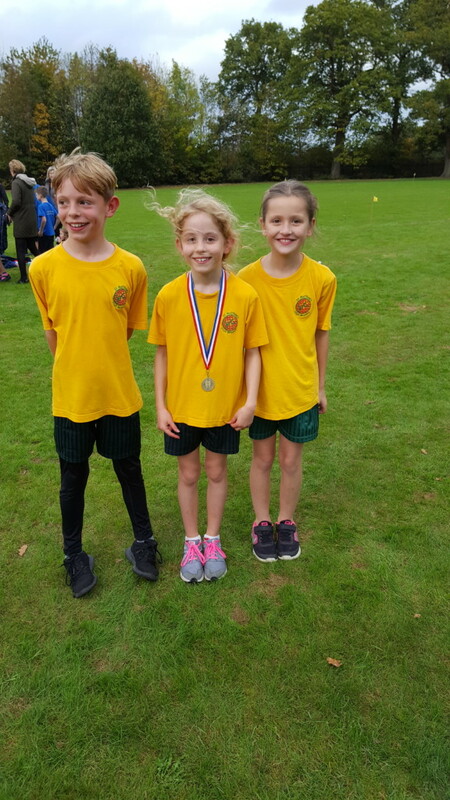 The three other children also ran really well with Keeley finishing in 57th place in the Year 4 girls race, Joe finishing 29th in the Year 5 boys race and Erin finishing 28th in the Year 5 girls race. Well done to all of them. 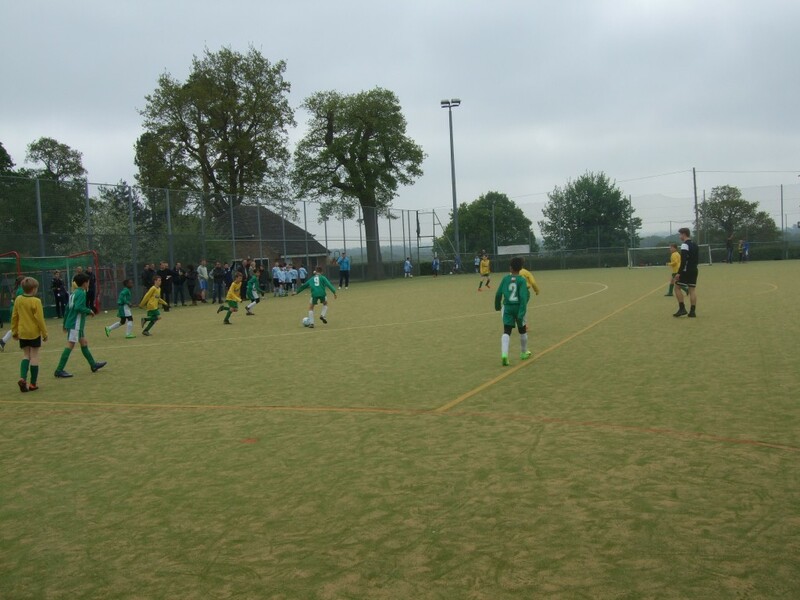 On Friday 13th October St Matthew’s took part in the ESFA 7 aside football tournament at Hawkenbury 3G pitches. 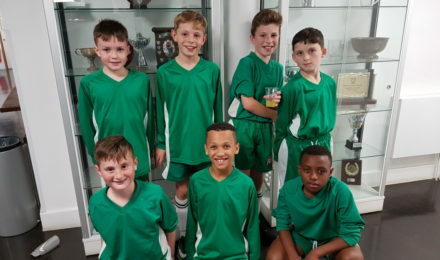 The team consisted of Luka, Munashe, Kieran, Jamie, Ethan, Riley, Henry and Archie. They played in four games, winning one, drawing 2 and losing 1. It was an impressive performance overall with great team work and some super goals from Ethan, Munashe and Luka. 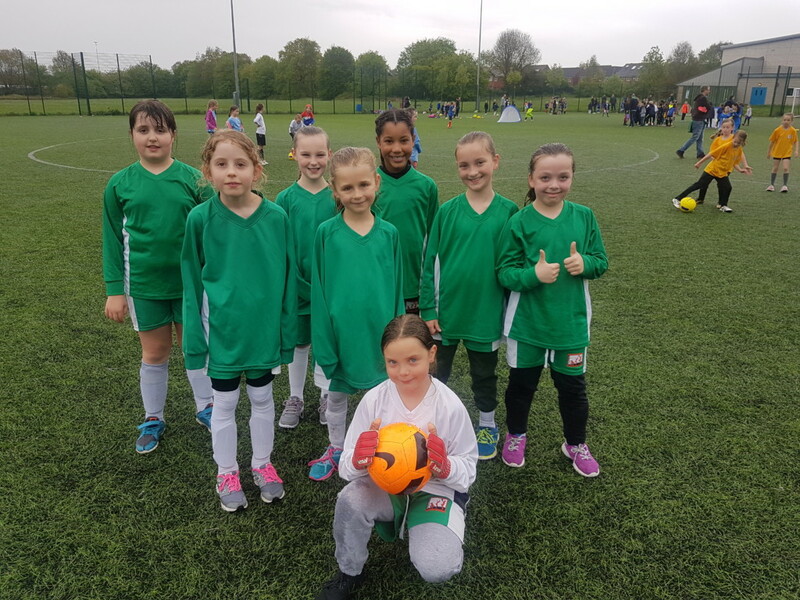 The finals were decided on goal difference as it was a really close competition and St Matthew’s missed the semi finals by one goal, which was a real shame as we beat the team who qualified for the final in the group stages. Well done to all the boys as they played really well. 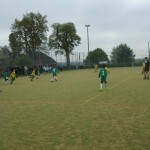 On Monday 9th October St Matthew’s travelled to Bishops Down School for their first football match of the season. 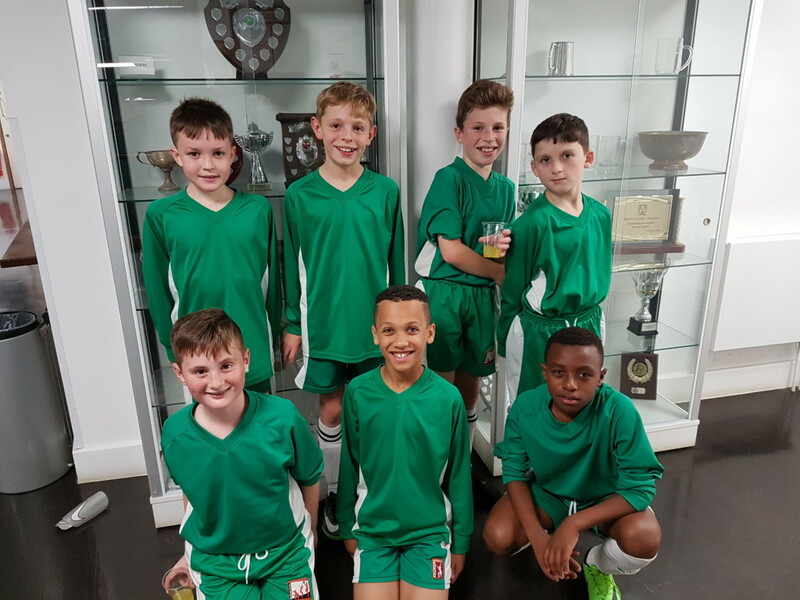 The team consisted of Munashe, Luka, Henry, Ethan, Jamie, Harry, Kieran, Archie and Riley and they had been working really hard with Wayne who has recently taken over football club. 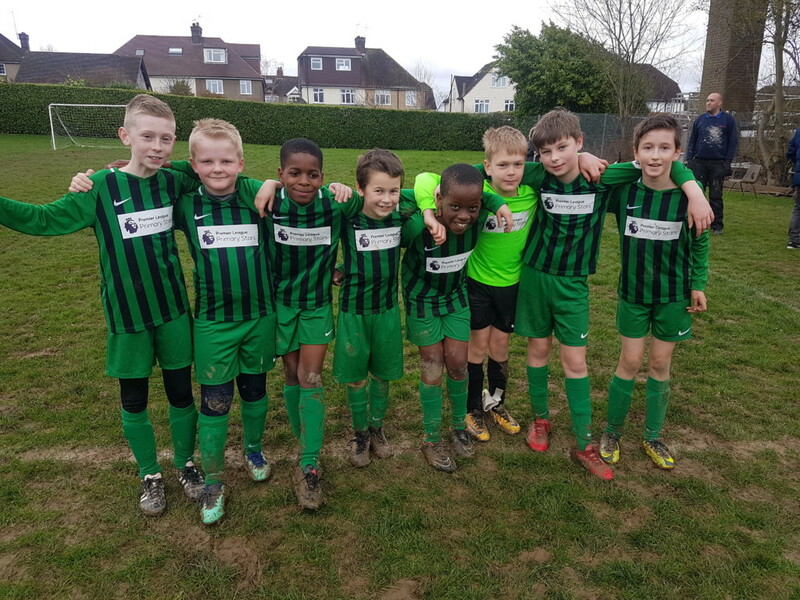 Their improvement was evident during the game and there was some great skill shown by Munashe and Luka and full time score was 3-0 to us with goals being scored by Munashe, Henry and Ethan. Wayne was really impressed with the performance and is looking forward to the next few games we have. 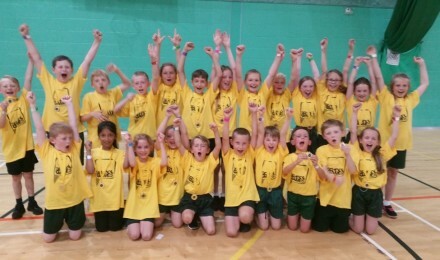 On Sunday 8th October St Matthew’s took part in the Kent under 11s indoor athletics festival at St Johns sports centre. 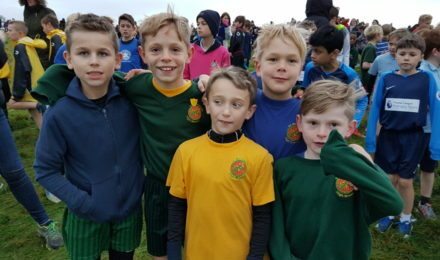 This was a competition for the most talented children in the school and our team consisted of Luka, Munashe, Henry W and Nikola S. Each child had to do a jump, a throw and two relay runs and their scores were added together to make a team total. Luka and Munashe were exceptional in the hop, step and jump recording distances of 5 meters 60cm and 5 meters 57cm, giving them 1st and 2nd place. 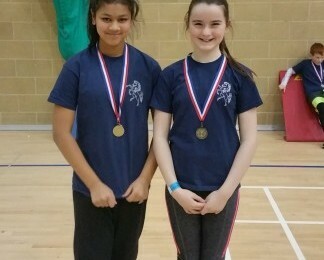 They also came 1st and 2nd in the speed bounce where they achieved 59 and 54 bounces. 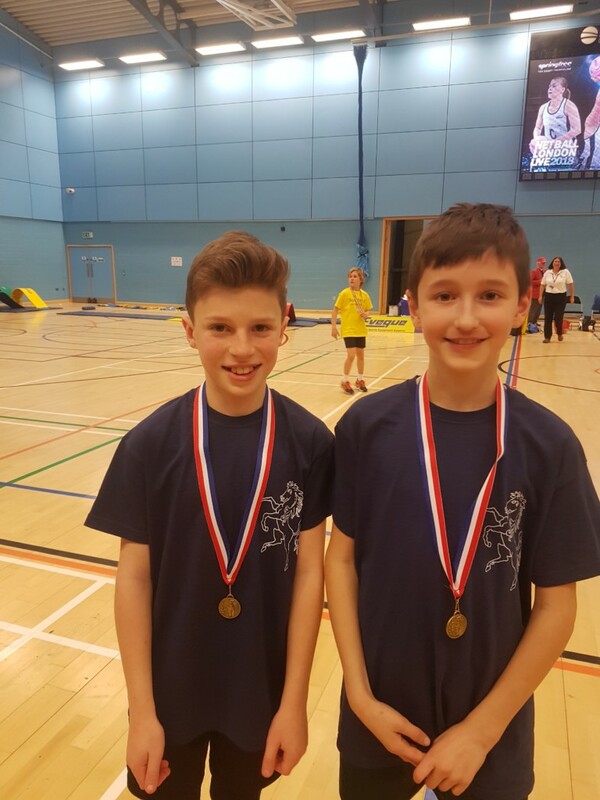 Henry and Nikola competed in the chest push and vertical jump recording really good marks which put the team in first place before the final event. However due to a small mistake in the final relay we finished in 3rd position giving us 4th place in the overall results. This was a great achievement as there were 18 schools taking part and it gives us a good indicator how well we can do in future competitions. On Wednesday 28th June we had the most successful day of sport in the history of the school. 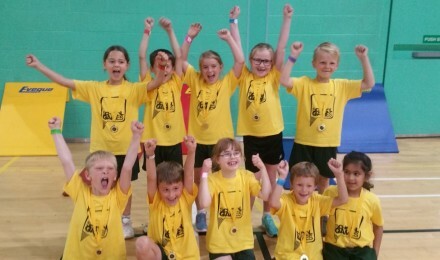 In the morning the Year 2 Infant Agility team represented the Tunbridge Wells area in the Kent School Games Infant Agility Finals in Gillingham. 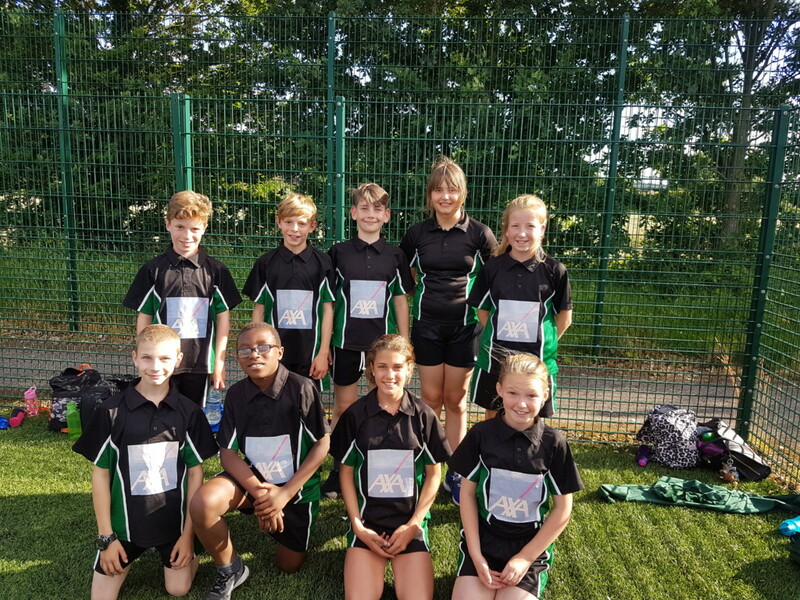 The team consisted of Lilly, Niamh, Lucy, Freya, Ateefa, Oliver, Charlie, Harrison, Ryan G & Aiden and they all gave 100% effort and determination winning the competition by 45 points from 16 other schools from around Kent. The whole team was incredible but there were some outstanding individual performances from Freya who produced 56 speed bounces, Charlie who jumped 1 meter 80 in the long jump & Oliver who threw over 16 meters in the javelin. 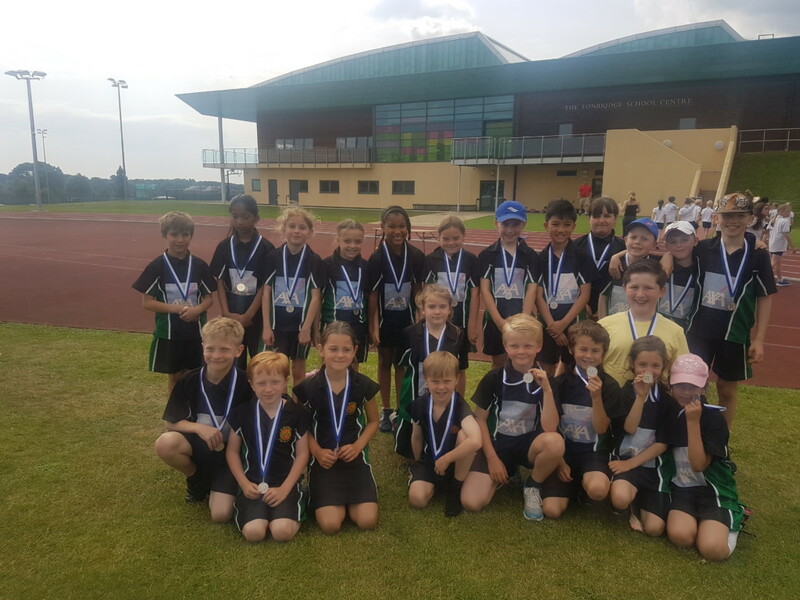 The Year 3/4 athletics team arrived just in time to cheer and celebrate with the Year 2 team and it was a wonderful moment for us all. 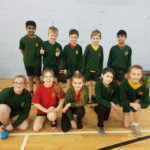 We were still on a high when the Year 3/4 competition began and we got off to a flying start winning the first two relays. 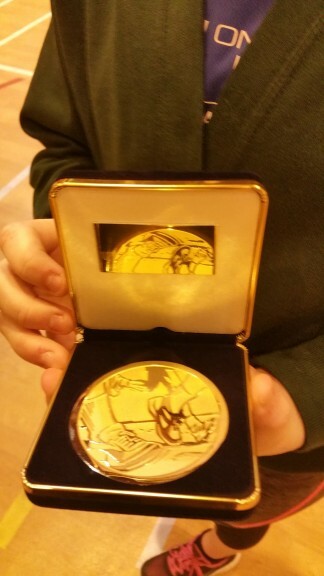 The team consisted of Nikola, Ella, Demi, Olivia, Erin, Lilly, Nicola, Humairaa, Abbie, Aysha, Daisy, Petroc, Henry, Dominic, Theo, Riley, Freddie-Jay, Charlie, Joe, Nikki, Jake, Freddie-Lee & James and the success continued throughout the competition. 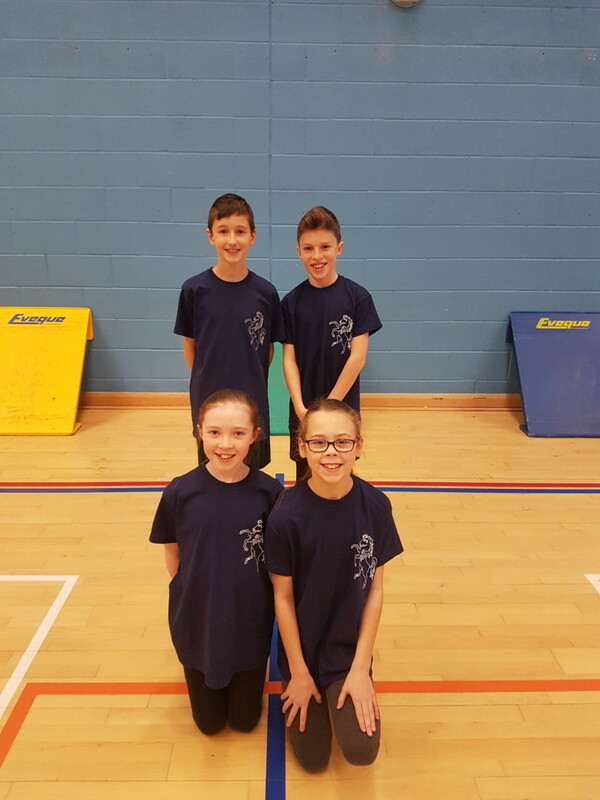 There were some outstanding individual performances from Nikola & Petroc who both threw 5.75 meters in the chest push, Freddie-Jay who jumped 55 speed bounces, Demi who jumped 10 meters in the 5 strides & Daisy who jumped 40cm in the vertical jump. We then waited for the announcement of the results and there was overwhelming joy when were declared Kent Champions for the second time in one day. It was a truly wonderful day and we were totally overwhelmed by the grit and fighting spirit that all the children showed. The whole school is incredibly proud of both teams, so a huge well done to each and every child you were AMAZING!!!!! 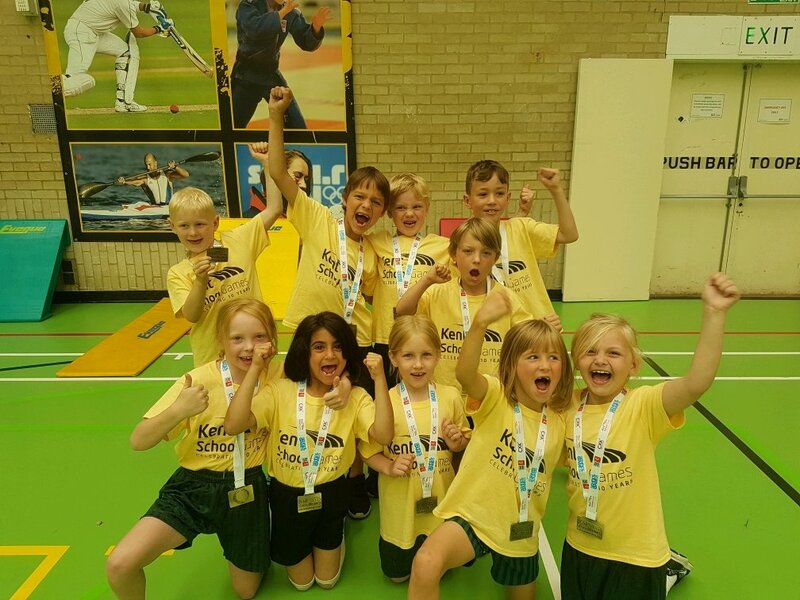 On Tuesday 27th June St Matthew’s represented the Tunbridge Wells area in the Kent School Games Final Tri-Golf competition in Canterbury. 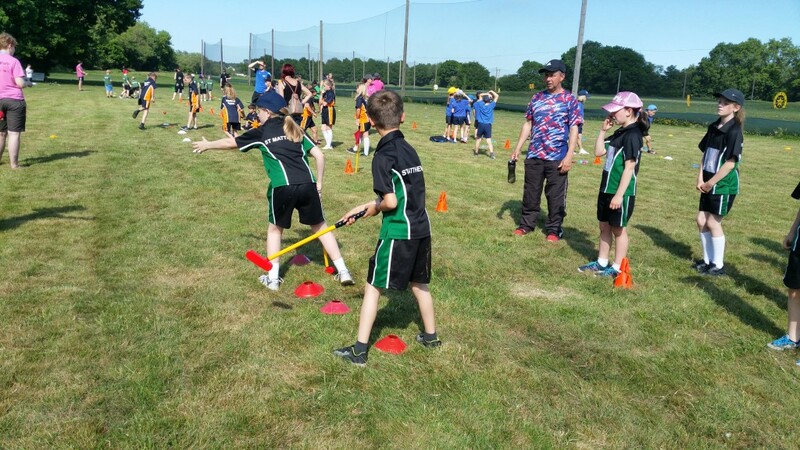 The team consisted of Lilly, Erin, Amelia, Abigail, Becca, Daniel, Jack, Dominic, Joe & Charlie and the children had to complete 10 different activities testing their putting and chipping skills. 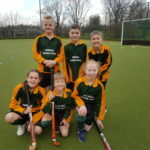 This was a huge achievement to even make the finals and the children all played really well finishing in 7th place out of 16 schools a result they should be really proud of. 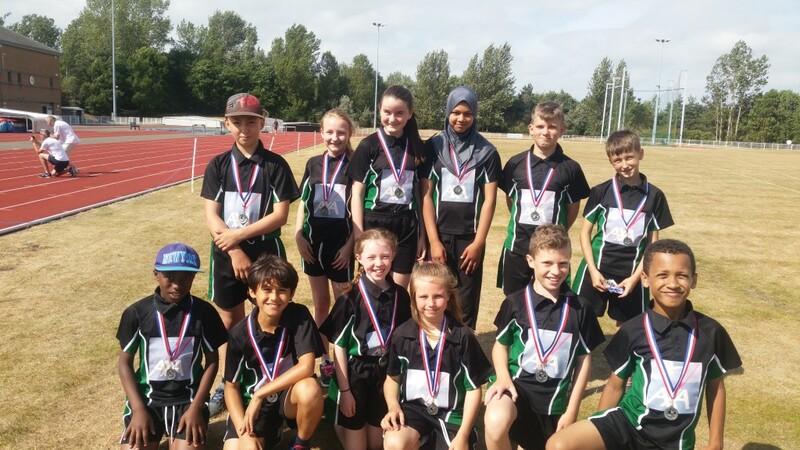 On Friday 23rd June St Matthew’s took part in the Ashford Leisure Trust Athletics Festival at the Julie Rose Stadium in Ashford. 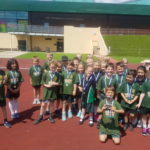 The team consisted of Eleanor, Saarah, Caitlin, Charli, Nikola, Olivia, Ethan, Jamie, Munashe, Luka, Evan and Henry and all of the children had to do a run, a jump, a throw & a relay. 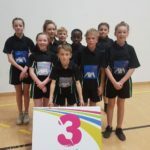 There were 24 schools taking part from all over Kent and St Matthew’s produced one of the best team performances we’ve seen all year, finishing in 3rd place. There were some spectacular individual performances from the long jumpers where Eleanor jumped 2 meters 40cm, Nikola jumped 2 meters 10cm, Munashe jumped 2 meters 25cm & Henry jumped 2 meters 20 cm. All these distances were personal bests and the furthest distances we’ve seen this year. Caitlin threw an amazing 35 meters 85 cm in the vortex , Luka and Olivia did brilliantly in the speed bounces recording 54 & 52, Eleanor threw a huge 30 meter hammer throw and Saarah & Evan jumped two incredible jumps in the triple jump recording 6 meters 10 cm and 6 meters. 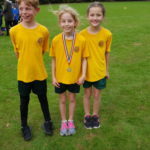 Special mentions need to be given to Nikola, Olivia and Henry who are Yr 4 children but were competing in a Yr 5/6 competition, meaning they were against children 2 years older than them. All three of them were brilliant showing how talented they are and we are very excited to see them competing over the next couple of years. Huge congratulations to all the children that took part you were truly wonderful and it was a great finale to the athletics season. 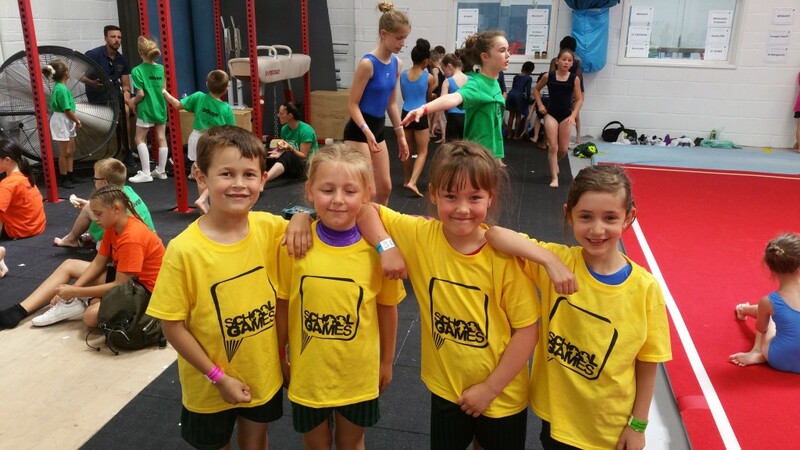 On Tuesday 20th June St Matthew’s represented the Tunbridge Wells area in the Kent School Games Finals for gymnastics at the Peagusus Gymnastics Centre in Maidstone. 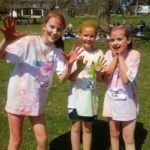 Our team consisted of Lena, Charlie, Georgia and Lily S and there were 21 different teams taking part from all over Kent. 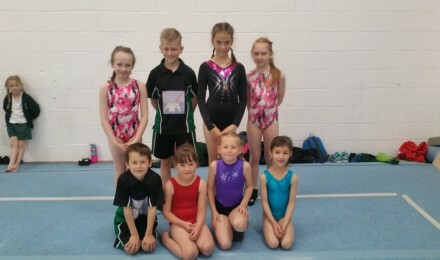 The children had to perform a body management routine, a floor exercise routine and a vault routine. The marks were out of 30 for the three combined routines and Lena scored 24.25, Charlie scored 24.30, Georgia scored 24.6 and Lily scored our highest marks with 25.25. 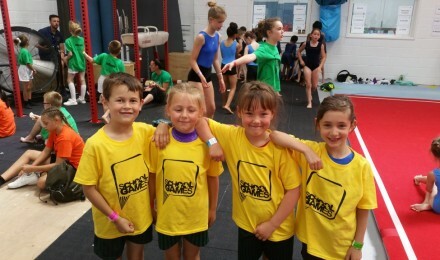 We were really proud of all four children as this is the first year we have ever entered the gymnastics event so to qualify for a Kent Final and to finish 14th out of 21 schools is a superb effort. 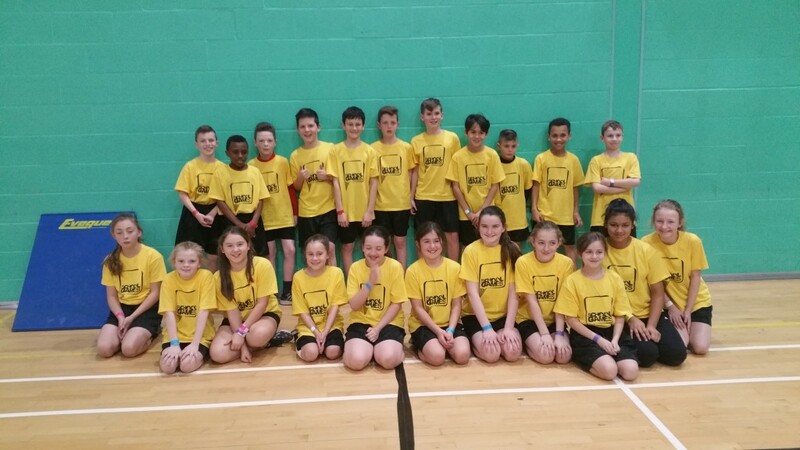 On Thursday 15th June St Matthew’s took part in the Inter schools Handball Tournament at Hayesbrook School. This is the first time this event has ever taken place so it was a new experience for all the teams taking part. Our team consisted of Eleanor, Saarah, Caitlin, Luka, Munashe, Harley, Oliver, Evan & Jamie. It was an incredibly hot day but everyone played really well. 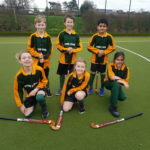 They won their first game 4-1 against Goudhurst, the 2nd game was won 5-4 against Woodlands, the 3rd game was won 4-1 against St Peters and then they lost the 4th game 1-4 to St James. This was a great performance and the team finished in 3rd place overall. 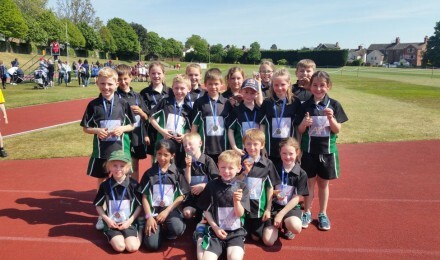 On Wednesday afternoon, 14th June St Matthew’s won the Year 3/4 Pentathlon at Tonbridge School. The team consisted of Abbie, Humairaa, Nikodem, Martha, Theo, George, Freddie-Jay, Jake, Jessica, Aysha, Charlie, Dominic, Erin, Nikola, Demi, Ella, Petroc, Ben, Olivia, Nicola & Henry. The whole team was absolutely fantastic finishing with an overall score of 160 points, seven points more than 2nd. There were some outstanding performances from Demi who jumped a huge distance in the 5 strides, Humairaa in the long jump and Petroc in the javelin. 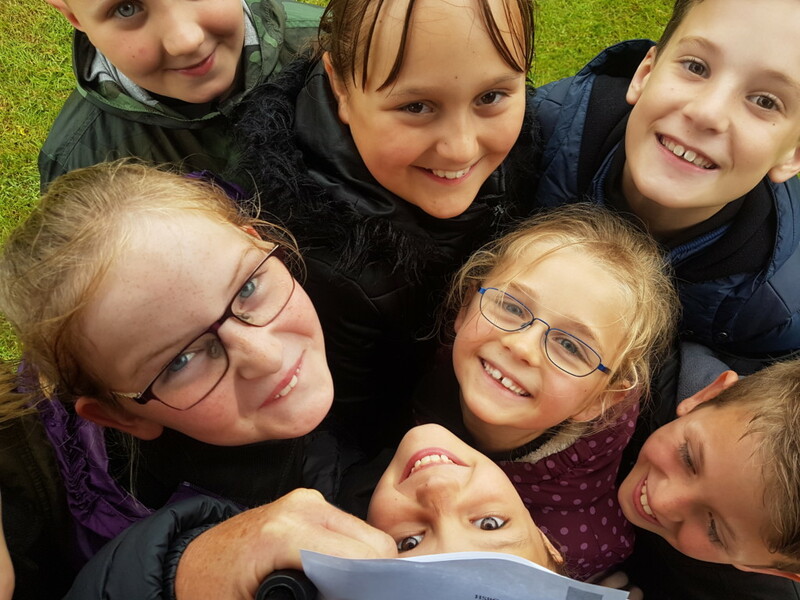 Many of the children achieved level 5, which is the highest level they can reach and we were incredibly proud of the whole team. 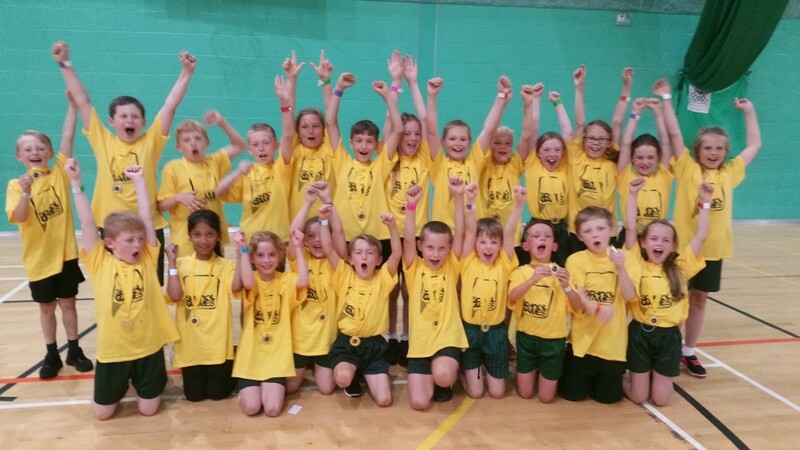 On Wednesday morning, 14th June St Matthew’s took part in the Year 1/2 Pentathlon at Tonbridge School. 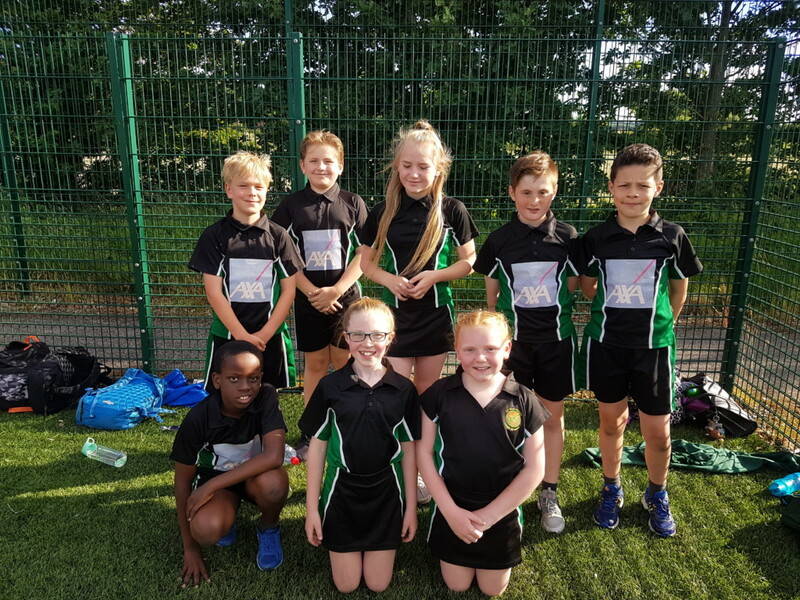 The team finished in 2nd place and consisted of Eloise, Olivia, Freya G, Leah, Florence, JJ, Justin, Archie, Logan, Callum, Freya B, Lena, Niamh, Ateefa, Lucy, Lilly S, Charlie, Oliver, Harrison, Harvey, Jack & Ryan G. It was the first a lot of the children had competed for the school and they all did extremely well. 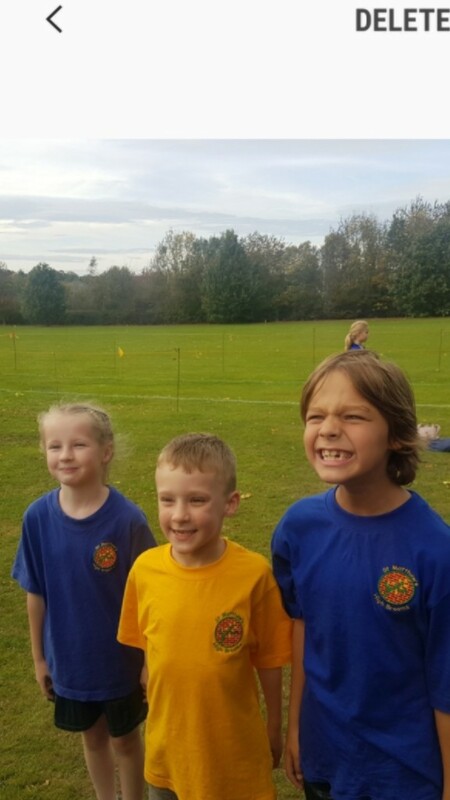 Some stand out performances came from Eloise in the Yr 1 girls 60 meter sprint & Harvey and Oliver in the Yr 2 boys Javelin. 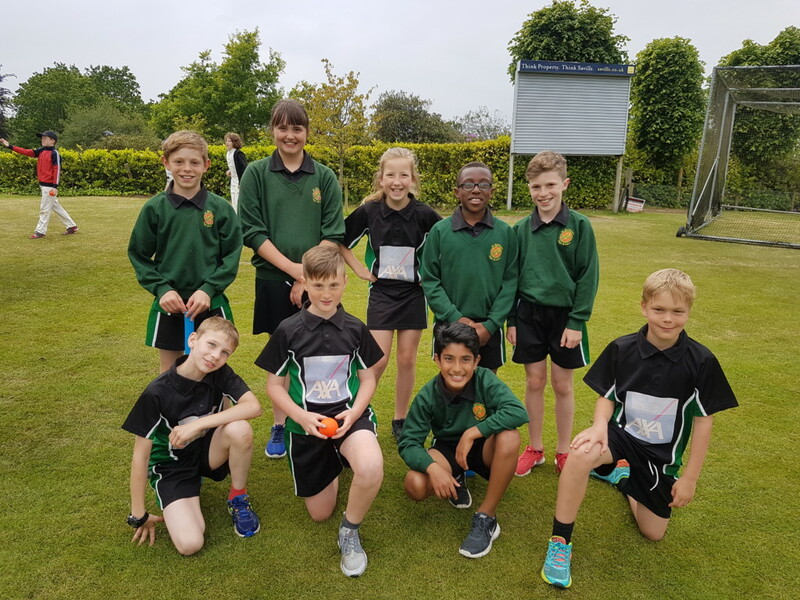 On Thursday 25th May St Matthew’s took part in the inter schools Tri-Golf tournament at Tonbridge golf centre and the team consisted of Lilly, Becca, Abigail, Amelia, Erin, Dominic, Joe, Daniel, Jack and Charlie. It was lovely to have some children in the team who hadn’t represented the school before and there was great excitement amongst all the children. They had to do 10 different activities which lasted 8 minutes each and they included putting and chipping skills. 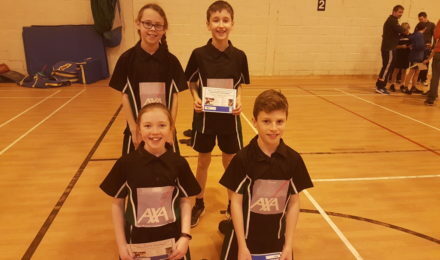 There was some brilliant skills shown by Lilly, Charlie and Jack, who scored a large amount of points on each activity but all the team played really well winning the tournament with 969 points which was 230 points more then second place. 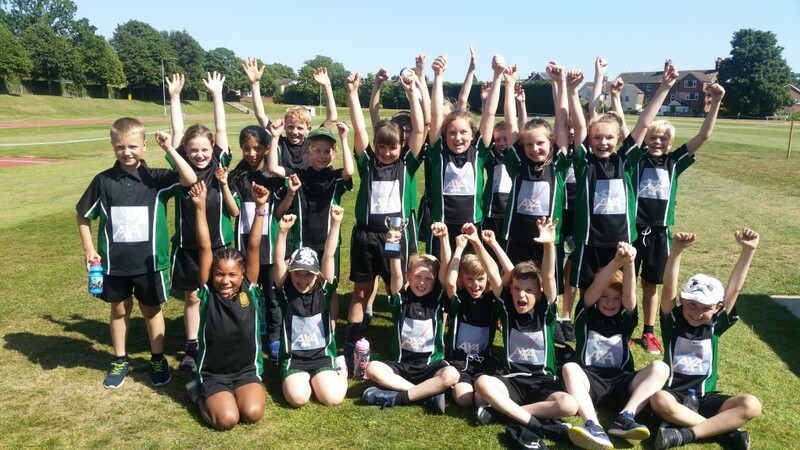 It was a fantastic afternoon in the sunshine and St Matthew’s now go forward to represent the Tunbridge Wells area in the Kent School Games Golf Finals in Canterbury on June 27th. 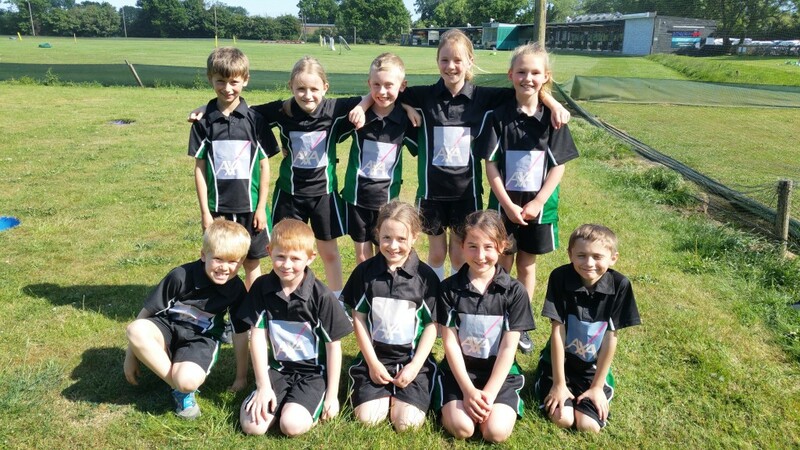 On Wednesday 17th May St Matthew’s took part in the Year 5/6 inter schools pentathlon at Tunbridge Wells Rugby Club. 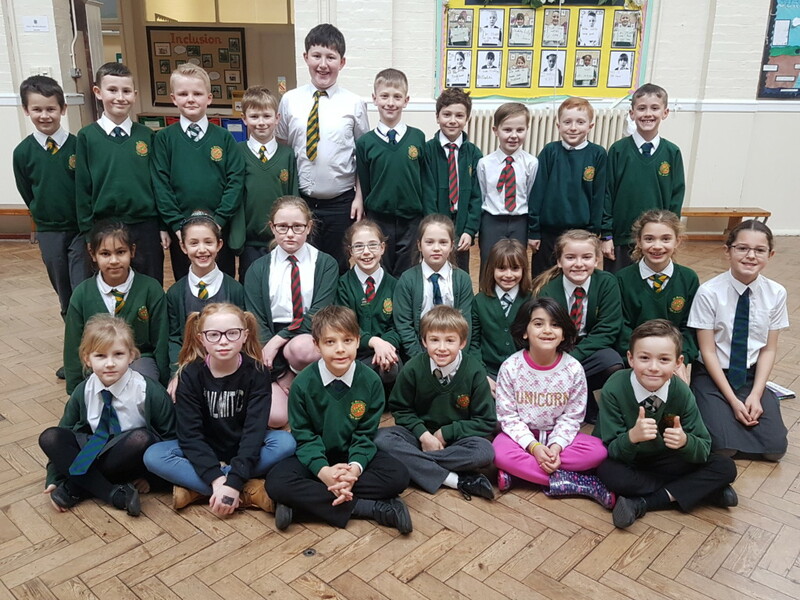 The team consisted of Chloe, Jasmine, Kamilla, Nellie, Tara, Rhianna, Munashe, Luka, Liam, Ethan, Zak, Eleanor, Saarah, Charli, Caitlin, Evan, Harley, Jamie, Harvey, Ian and Aarron. 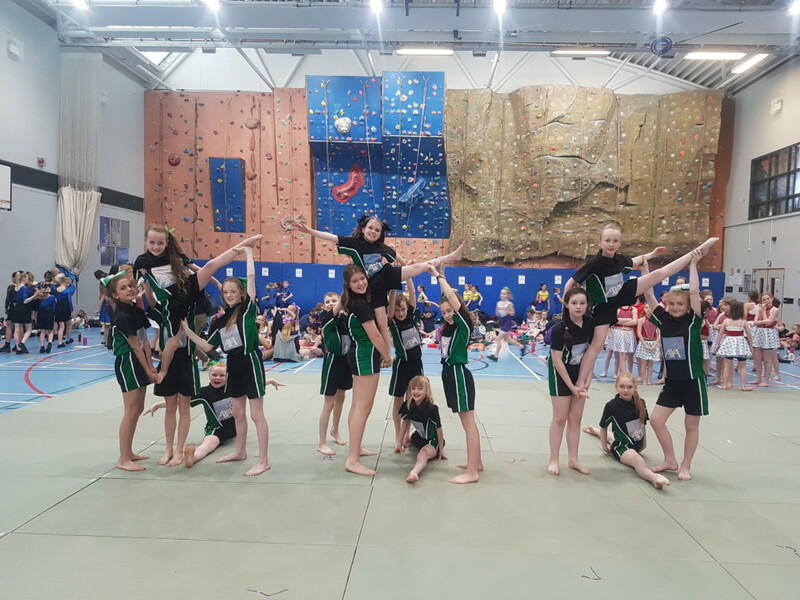 The team was absolutely fantastic coming equal first with Claremont with a score of 160 points and 11 out of the 21 children scored a level 5 standard, which was the highest level possible. 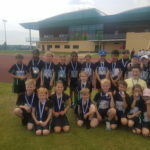 There were some outstanding performances from Munashe in the Year 5 boys Long jump, Triple jump and 60 meter sprint, where he scored 5 level 5 standards.The whole team trained so hard for this event and it definitely paid off and we are incredibly proud of each and every one of you for retaining the winning trophy. 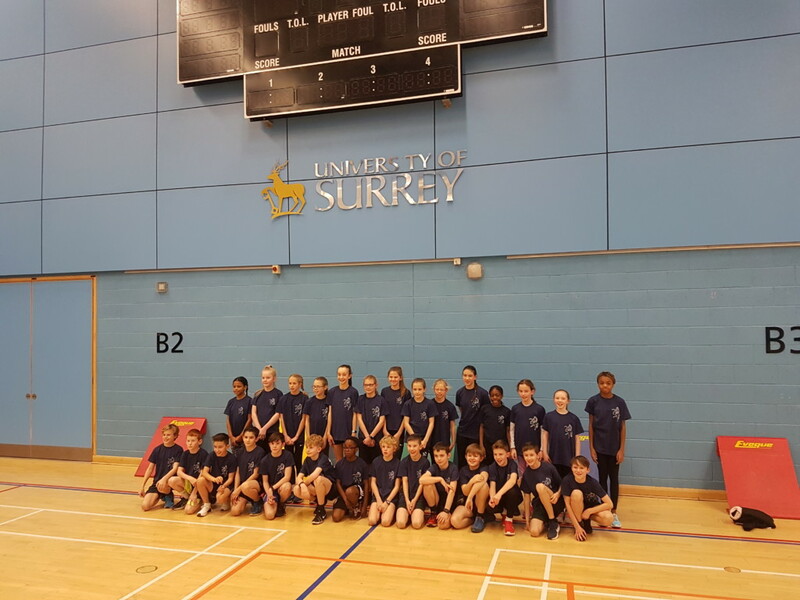 On Wednesday 10th May St Matthew’s took part in the Olympic Legacy athletics competition at Tonbridge School. 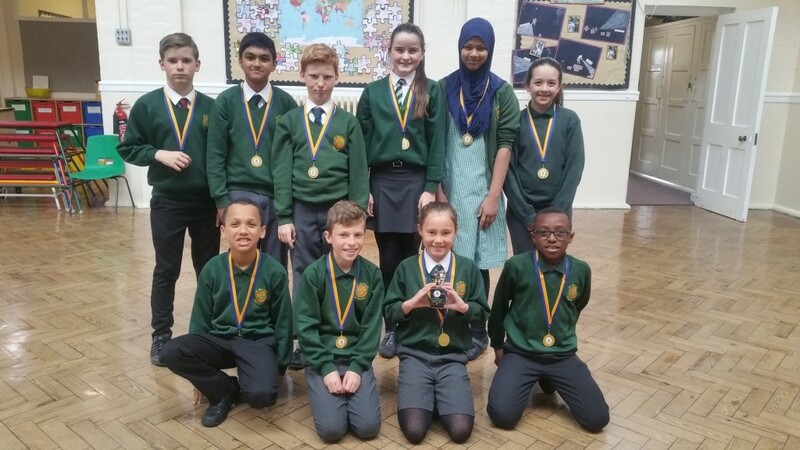 The team consisted of Nikola, Nicola, Erin, Demi, Abbie, Humairaa, Ella, Becca, Henry, Harry, James, Dominic, Charlie, Joe, Theo & Franek. There were some superb performances especially from Demi who jumped an incredible 10 meters 30 cm in the 5 strides, which was a schools record. Erin also gave her all in the 600 meters finishing in 3rd place and Abbie and Ella ran really well winning both their 75 meters sprints. 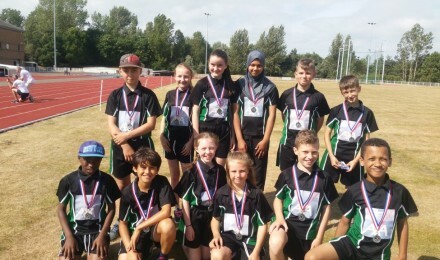 St Matthew’s won virtually all the field events and out of 12 schools finished in 2nd place. Another wonderful day of athletics from a great team. 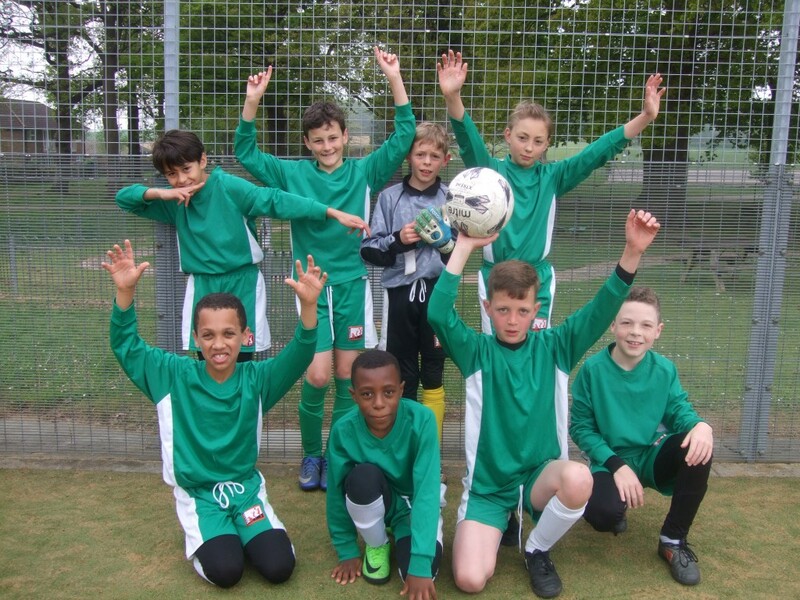 On Saturday 6th May, St Matthew’s took part in the Tunbridge Wells Primary Schools football tournament at Hawkenbury Astro. The team did extremely well: Won 2, drew 2, lost 1. This gave us second place in the group and a place in the semi-finals. 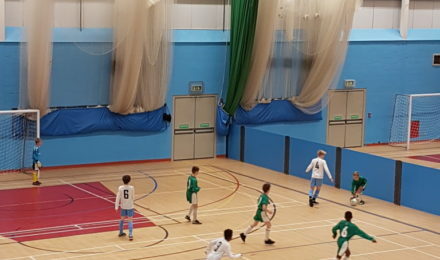 In the semi, we played St Augustine’s, which had been a 3-3 thriller of a game in the round, however neither team could score in the semi, so it went to penalties. After 3 penalties a piece, sudden death penalties were played and unfortunately St Matthew’s lost. Great sportsmanship and teamwork was shown throughout the whole morning. Well Done. 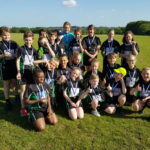 On Wednesday 3rd May St Matthew’s took part in the Primary Tag Rugby Festival at Tunbridge Wells Rugby Club and the team consisted of Eleanor, Saarah, Sheima, Scarlett, Evan, Arthur, Saihaan, Ethan, Luka and Munashe. The weather was horrendous with lashing rain and really cold temperatures and all the teams really struggled to play in the conditions, slipping and sliding on the wet grass. The rules of tag rugby have been changed this year by the Rugby Football Union and all competitions have to be fair play awards, which means the scores are irrelevant and the teams are judged on sportsmanship, respect, determination, good supporters and quality of play. 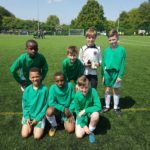 St Matthews won 1 game and drew 3 and each referee marked the team on the fair play values deeming them the overall winners of the tournament out of 20 other teams. 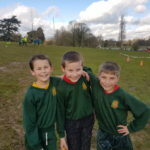 We were incredibly proud of the children because not only did they display the required values they also played some exceptionally good rugby. On Tuesday 2nd May St Matthew’s took part in the Mini Tennis Tournament at Tunbridge Wells Sports Centre. The A team consisted of Dominic & Charlie, and the B team consisted of Nikola A and Nikola S. The A team won 3 out of their 4 games and the B team won 2 out of their 4 games. They all played really well but unfortunately missed the semi finals by 1 point which was a shame as they all showed some really good skills. 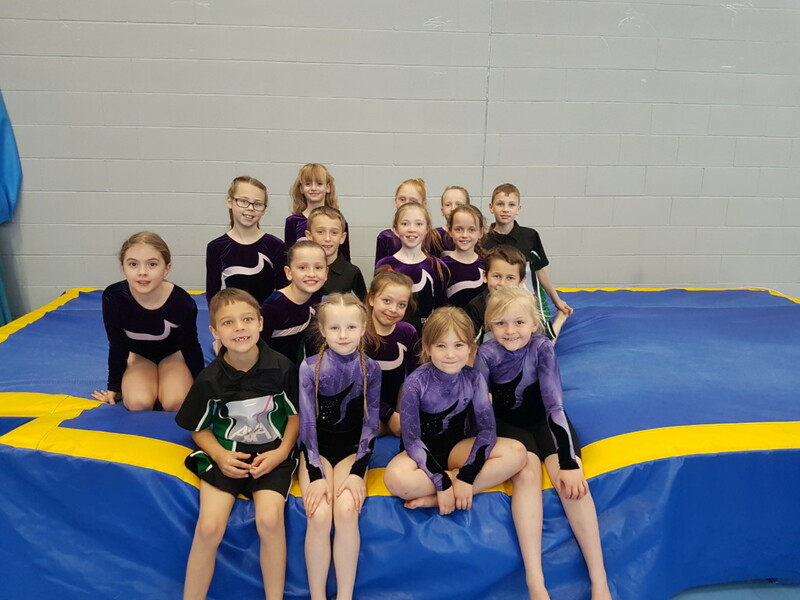 On Thursday 27th April a Year 2 team and a Year 5 team took part in the Key Steps Gymnastics Festival at the NDGA arena. 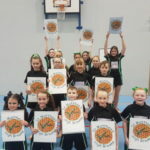 This was the first time St Matthew’s had taken part in this competition and our Year 2 team consisted of Lena, Charlie, Georgia, Lilly, and the Year 5 team consisted of Jasmine, Marta, Keaton and Caoimhe. 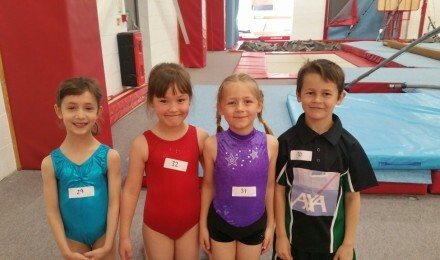 Each child had to do a floor routine, a body management routine and a vault exercise. All the scores were added together to get an overall team score. 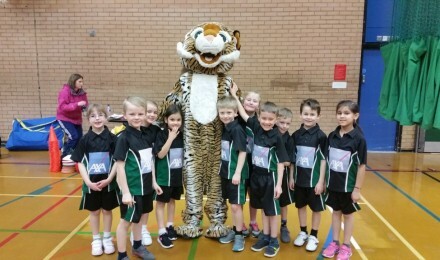 The Year 2 team completed their routines brilliantly with very few mistakes and they finished in 2nd place, which came as a real shock, only 1.6 marks behind first place. This means they now go forward to represent the Tunbridge Wells area at the Kent School Games Final in June. 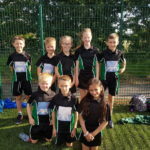 The Year 5 team also competed really well finishing in 3rd place, only 0.1 marks behind 2nd and 0.4 marks behind first place. We were really impressed with all the children who took part and considering it was our first time at this competition the results were superb. 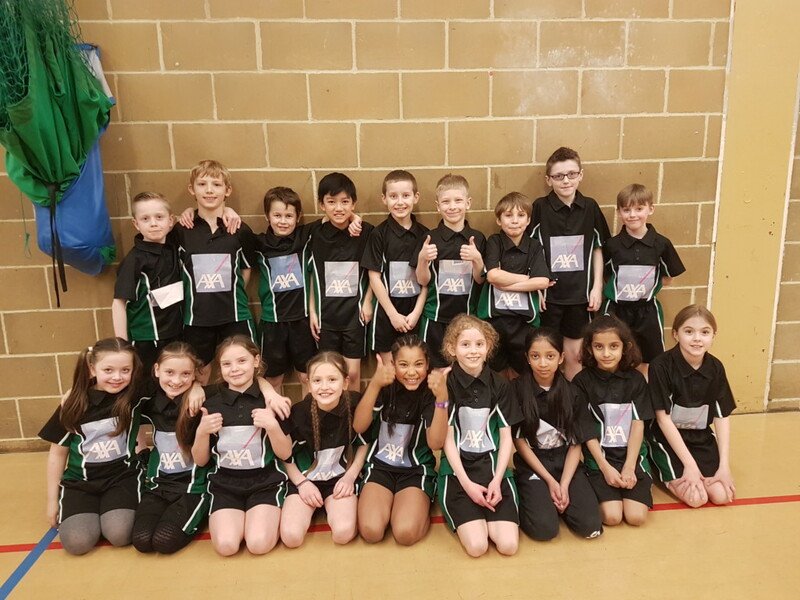 On Tuesday 21st February our Yr 3/4 athletics team became champions in the Inter Schools Yr 3/4 Indoor Athletics competition. 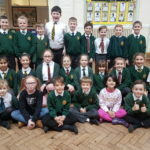 The team consisted of Ella, Lilly, Olivia, Erin, Nikola, Abbie, Humairaa, Demi, Daisy, Tinashe, Charlie, Nikoderm, Henry, Dominic, Theo, Freddie-Jay, James and Jake. 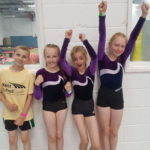 The children had all trained so hard for this competition and it certainly paid off. They each had to do 2 running relays and a 2 jumping or throwing events. There were some spectacular performances from Abbie & Humairaa in the 2 x 2 lap relay & from Nikoderm, Henry, James & Charlie in the boys 4 x 1 lap relay; the speed of their running was incredible. 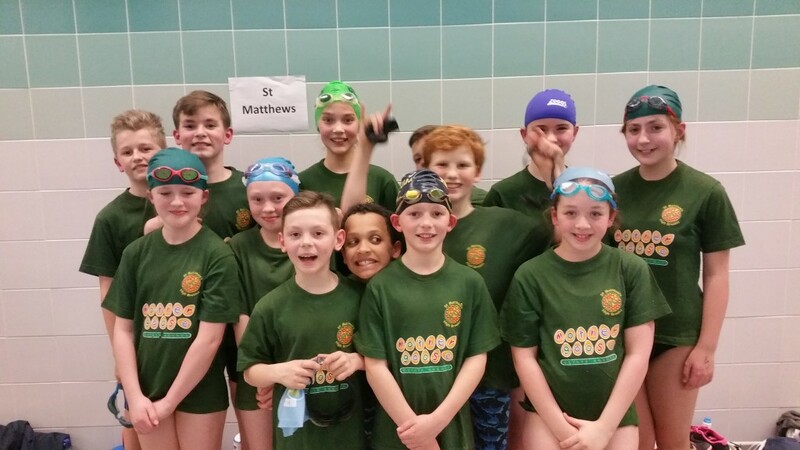 There were 12 relays in total and St Matthew’s won 8 of them. Freddie-Jay & Demi both jumped an incredible 9 metres in the 5 strides and Theo threw over 13 metres in the javelin. This was probably one of the most talented teams we’ve ever had and their enthusiasm and determination really shone through. The team managed to amass a total of 358 points, 34 points ahead of second place. 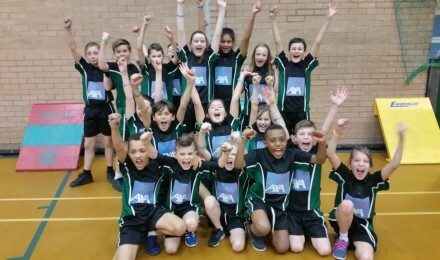 Well done to each and every one of you we are very proud and St Matthew’s have now won the indoor athletics competitions for every year group. 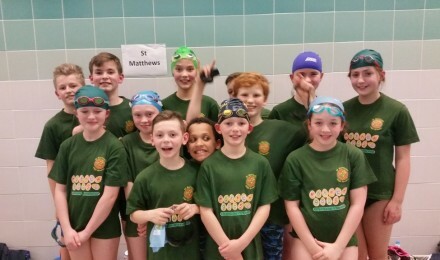 During the evening of Wednesday 22nd February St Matthew’s took part in the Inter Schools Swimming Gala at Tunbridge Wells Sports Centre. This was a first for us as we haven’t managed to enter a team in this competition for over 15 years. There was great excitement from all the children taking part as well as from Mrs Hookway and Mr Dodd. The team consisted of Eleanor, Sheima, Jasmine, Marta, Summer, Niamh, Arthur, Evan, Harley, Ethan, Hamish, Ewan & Keaton. 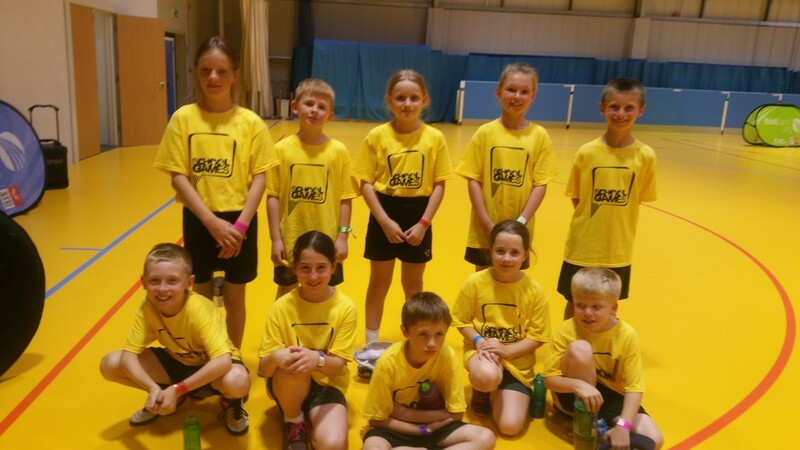 We took part in the B league as we were new to the competition and there were 6 other schools competing against us. There was a stand out performances from Arthur who won the Yr 6 boys breast stroke race in great style. All of the children gave 100% and it was lovely to see them all smiling and feeling super proud of themselves. St Matthew’s finished in 4th place overall, a huge achievement. Well done everyone. Harley 3rd Yr 6 Boys backstroke. 4th in mixed medley relay. 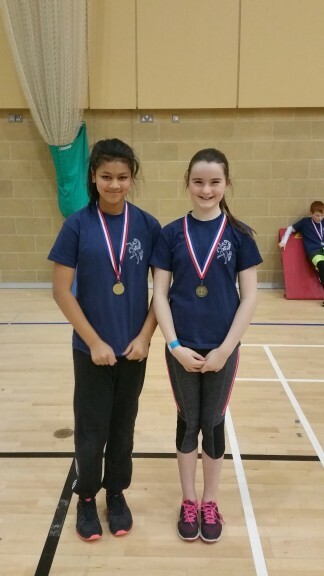 On Saturday 11th February Eleanor and Saarah were part of the Kent team that won the Southern Inter Counties Indoor Athletics Championships in Burgess Hill. It was a fantastic competition with some very talented children making up the Kent team. 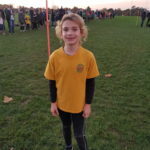 Eleanor jumped brilliantly in the triple jump recording a distance of 5 metres 80 cm and 6 metres 75 cm in the chest push. 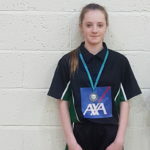 Saarah also competed really well recording 7 metres 50 cm in the chest push and 48 cm in the vertical jump. They were also in the obstacle and hurdles relay. 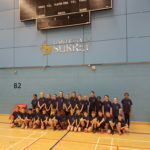 The competition was against Berkshire, Buckinghamshire, Hampshire, Oxfordshire, Surrey and Sussex and the whole team were fantastic winning by 15 points from second place. 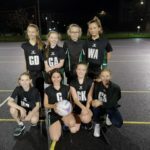 St Matthew’s are so proud to have two girls who are talented enough to be selected for a Kent team, it is such a huge achievement, so very well done girls. 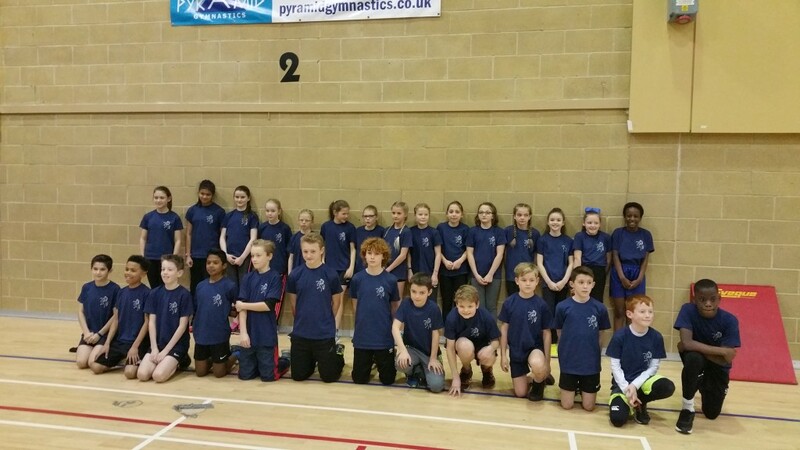 On Wednesday 8th February St Matthew’s represented the Tunbridge Wells area in the Kent School Games Yr 5/6 indoor athletics Final in Gillingham. There were 14 teams taking part and we finished in the 4th place, which was a spectacular performance especially as this was the first time we have qualified for the competition. 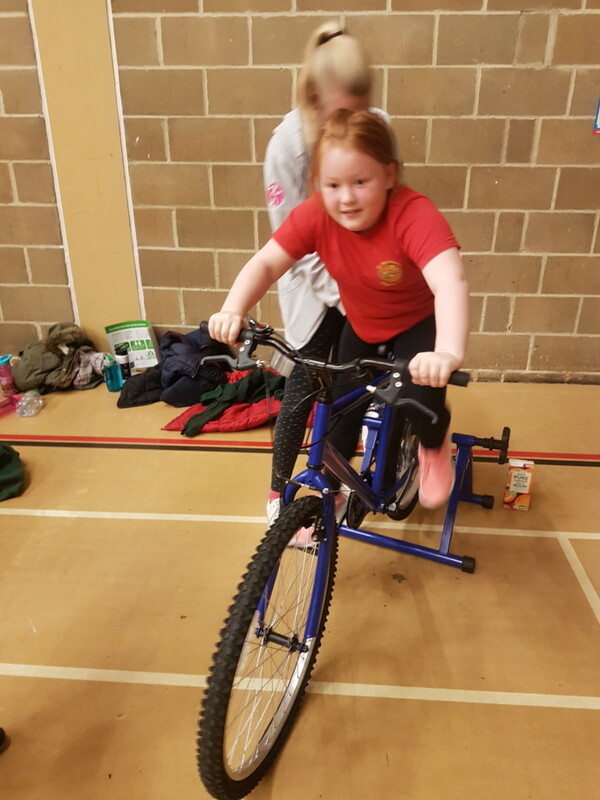 The team consisted of Eleanor, Saarah, Caitlin, Sheima, Lottie, Dotty, Samanatha, Nellie, Charli, Ellie M, Ellie D, Jamie, Harley, Evan, Aiden, Ethan, Ben, Luka, Munashe, Max B and Zach. 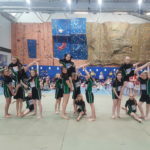 The competition was a very high standard but we still managed to produce some brillianr performances. 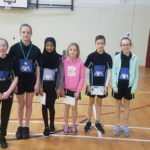 Munashe jumped 2 meters 10cm in the boys standing long jump, Saarah threw 7 meters 50cm in the chest push and Eleanor jumped 5 meters 85 cm in the triple jump and 60 speed bounces. The whole team were fantastic and really did St Matthew’s proud in our first Kent Final. 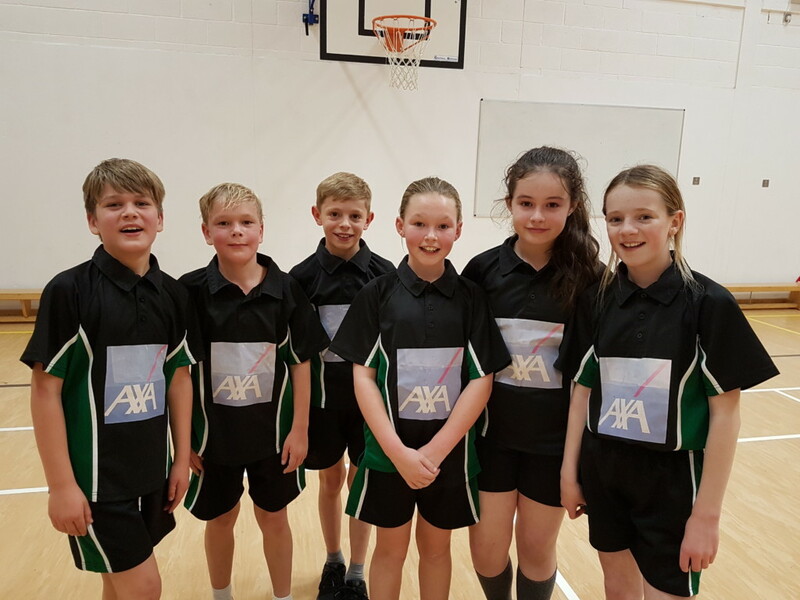 On Thursday 2nd February St Matthew’s represented the Tunbridge Wells area at the Kent School Games Basketball Finals in Gillingham. 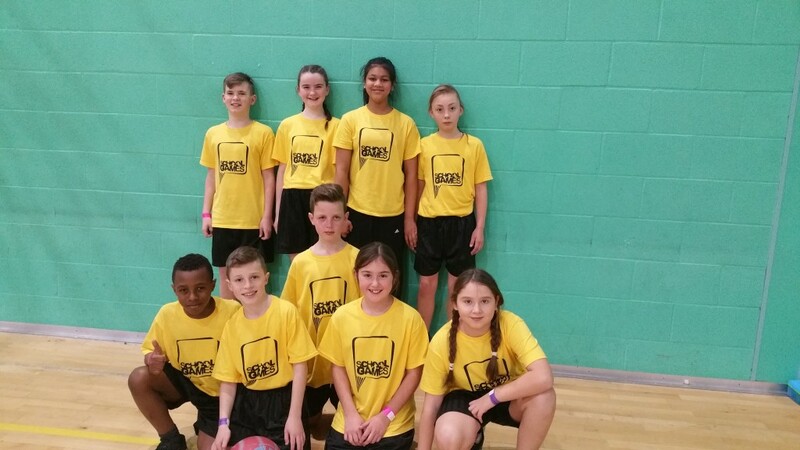 The team consisted of Munashe, Luka, Jamie, Harley, Evan, Eleanor, Saarah, Ellie, Lottie and Caitlin.They played 6 games in the group stages winning four of them convincingly and there was some superb shooting from Caitlin, Eleanor and Munashe, great defensive play from Harley, Evan and Saarah and Jamie, Luka, Ellie and Lottie supported play well out on the wings. 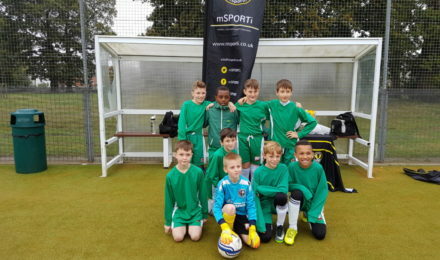 They finished third in their group stage and then progressed to play Ashford for 5th place over all. This was a superb game with some genius play from Munashe, who scored an incredible basket after dribbling around several of the opposition. We were incredibly proud of the whole team as they finished 5th out of 14 teams, which is a superb performance for their first time in a Kent Final. 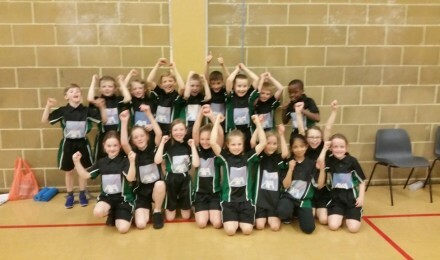 On Thursday 19th January St Matthew’s became champions at the Infant Agility competition for the second year running. The team consisted of Freya, Lucy, Eleanor, Niamh, Ateefa, Oliver, Charlie, Harrison, Aiden and Ryan. 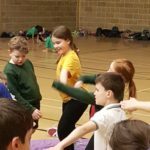 The children had to do 5 activities including, speed bounce, skittles, shuttle run, long jump and chest push and they all performed amazingly well. They had practised every lunchtime for 3 weeks and their dedication really paid off today. 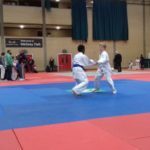 They will now progress to the Kent School Games Final in June. Well done to each and every one of you. 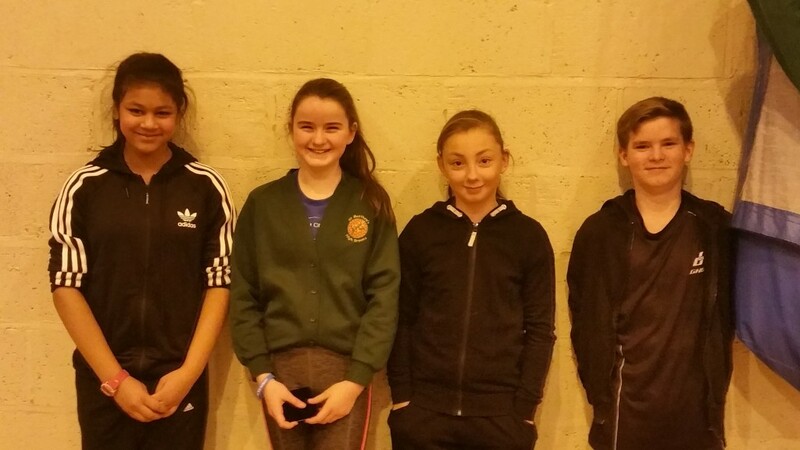 On Sunday 15th January Eleanor, Saarah, Caitlin and Evan took part in the Kent Schools indoor Decathlon Championships in Ashford. There were 155 children taking part and all four children performed superbly well. 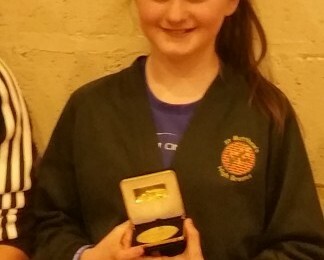 Eleanor was the real star of the show winning 9 out her 10 events and winning the girls competition overall with 523 points, 43 points ahead of second place. 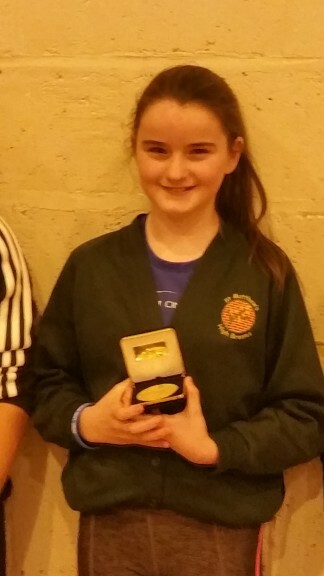 She will now represent Kent in the Inter Counties competition on 11th February. 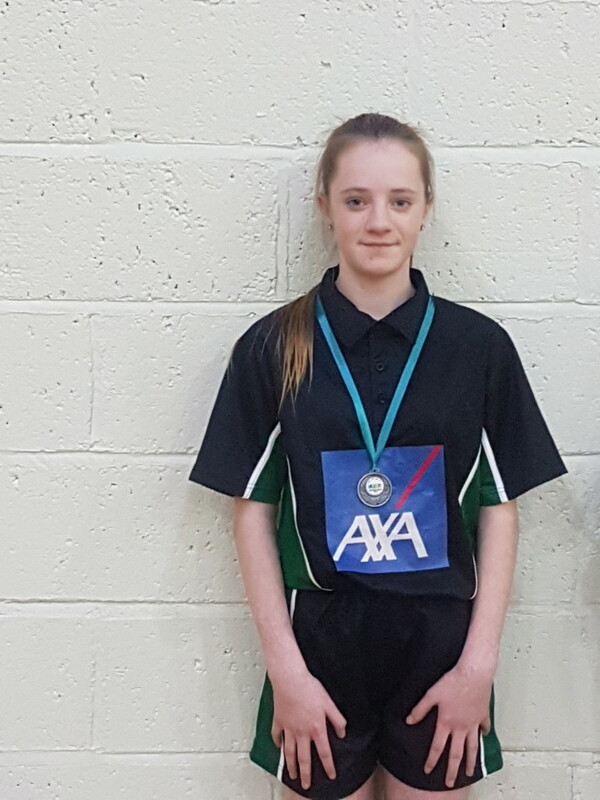 Saarah achieved 4th place and gained the highest vertical jump of 51 cm out of all the girls. Caitlin finished in 8th place throwing the longest javelin throw of the competition and Evan finished in 13th place after a very solid performance. Well done to all the children you once again did St Matthew’s proud. 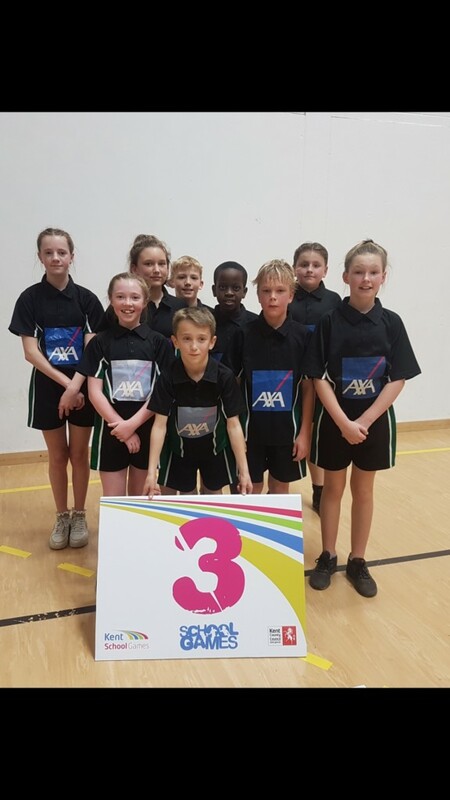 On Thursday 12th January St Matthew’s became Champions for the first time ever at the 5/6 Indoor Athletics Festival at the Angel Centre in Tonbridge. It was an absolutely wonderful day with all eighteen children performing to an incredibly high standard and winning many of the events that they took part in. 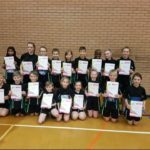 The team consisted of Eleanor, Saarah, Caitlin, Sheima, Lottie, Dotty, Samantha, Nellie, Charli, Jamie, Harley, Evan, Aiden, Ethan, William, Ben, Luka & Munashe. 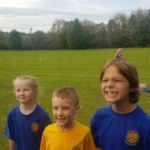 Each child had to take part in two field events and two running relays. There were some amazing performances including a 6 metre 10 cm triple jump from Eleanor, a 1 metre 12 cm vertical jump from Ben, a 57 speed bounce from Jamie and a 7 metre chest push from Saarah. 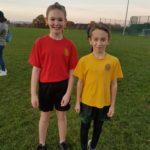 Caitlin and Eleanor also won the 2 x 2 relay and both the 4 x 1 girls and boys relay teams won. 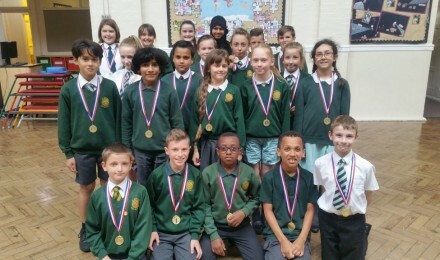 Each and every child was superb and the whole school is incredibly proud of them.